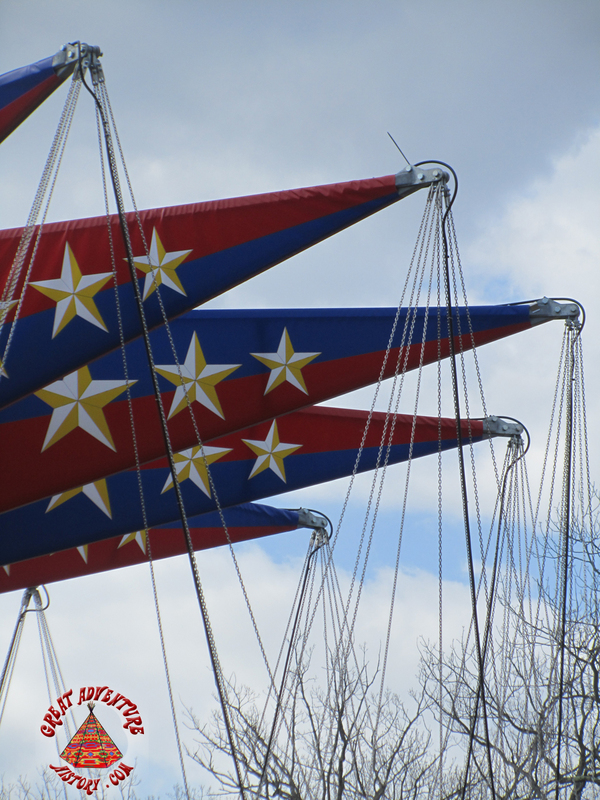 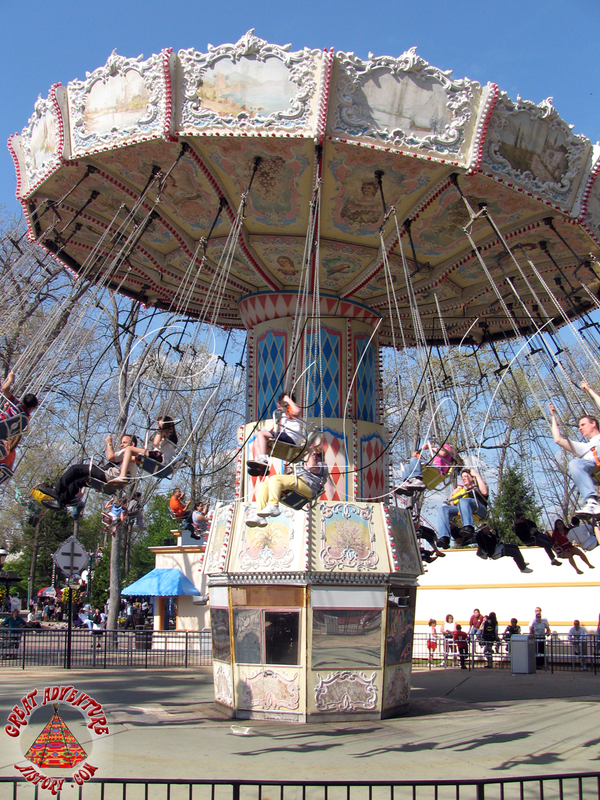 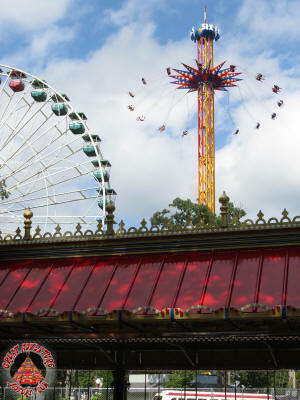 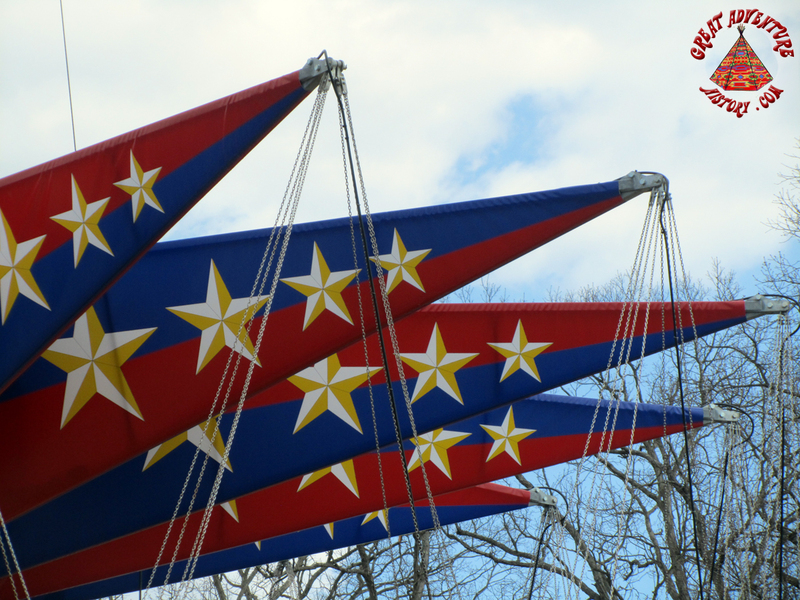 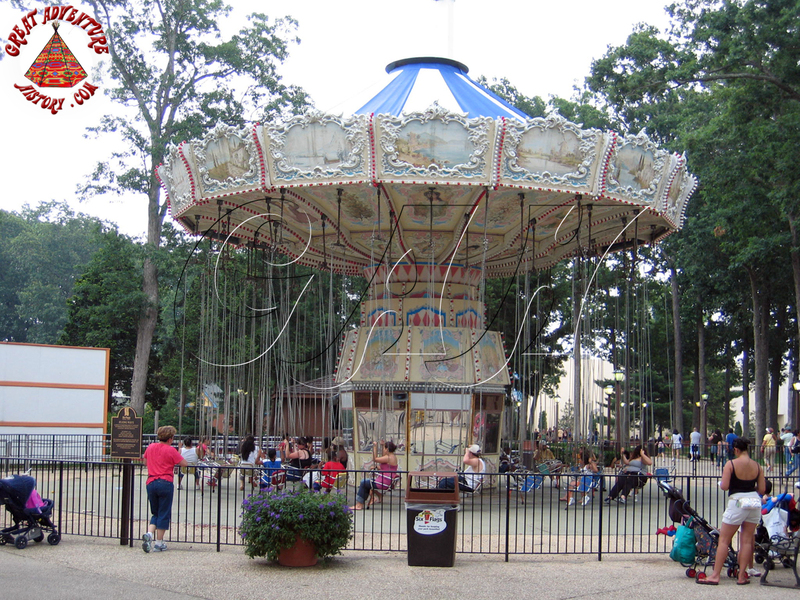 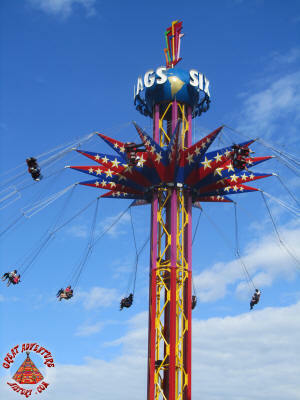 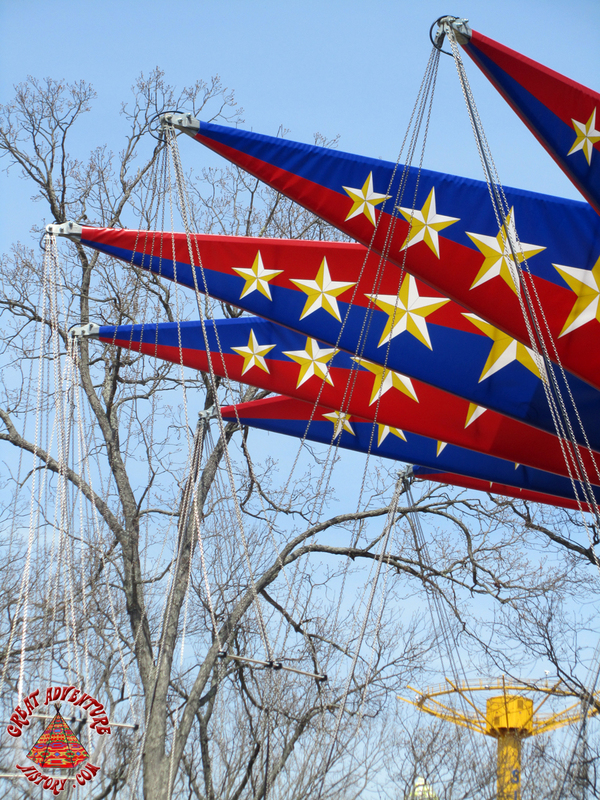 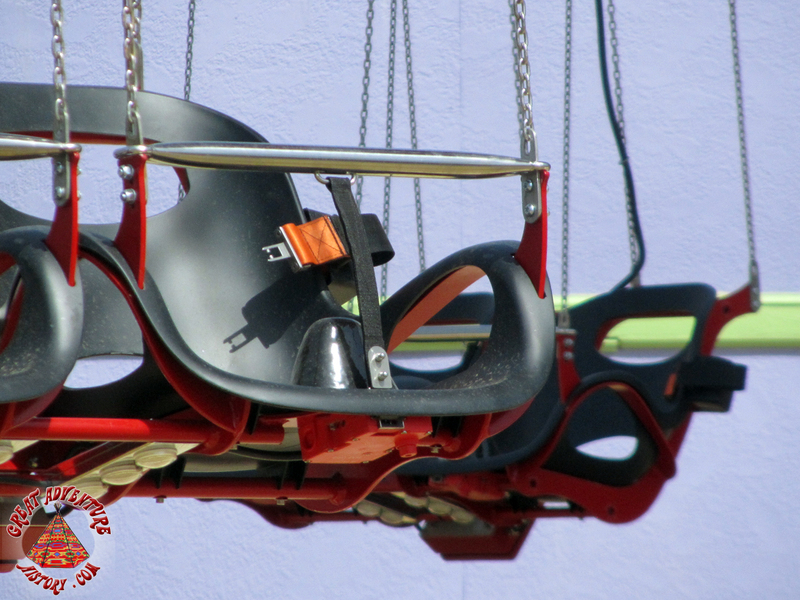 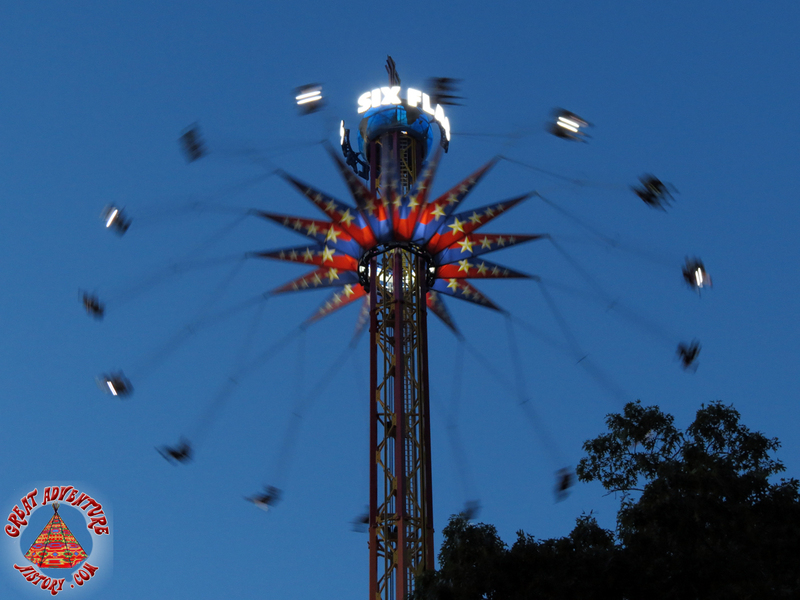 Flying swing rides are one of the oldest fairground attractions which have evolved over time with several manufacturers offering variations on the "flying carousel" concept. 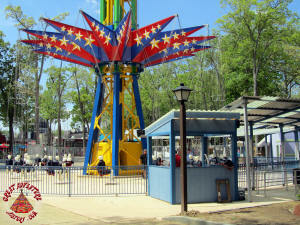 With the theme park boom of the 1960's and 70's the rides became a staple for all parks. 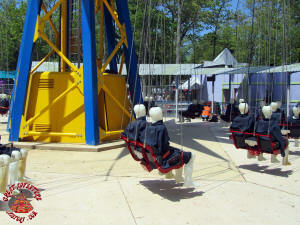 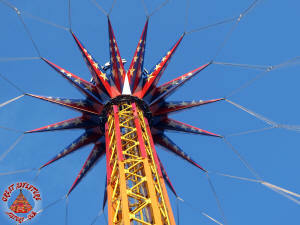 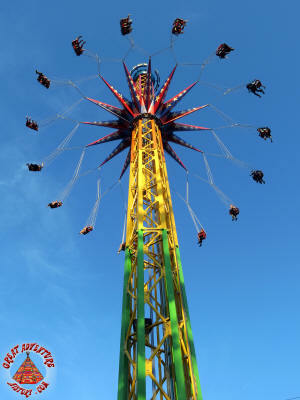 As technology and the publics demand for bigger thrills increased manufacturers took the concept to new heights building huge towers to take riders high above the treetops riding in simple swing seats. 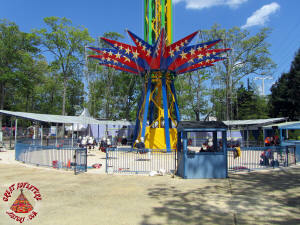 When Great Adventure opened in 1974, the Flying Wave was one of the park's signature attractions. 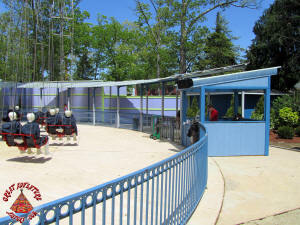 The ride which was built by Zierer featured an elegant style that made it look like an antique, though the ride was state of the art at the time. The longtime favorite was in the park for decades delighting generations of guests, but time took its toll on the ride's mechanical systems. 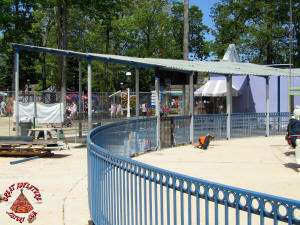 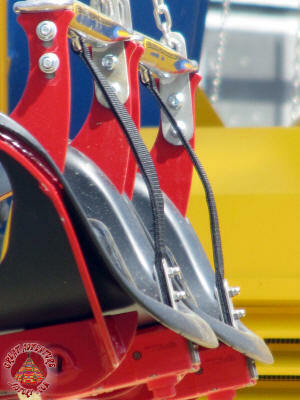 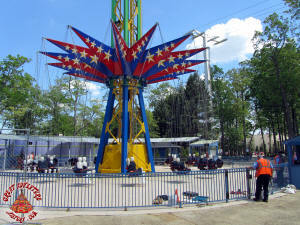 Many expensive repairs were made, but finally the costs of maintaining the Flying Wave got to be too much and the ride was removed for 2008. 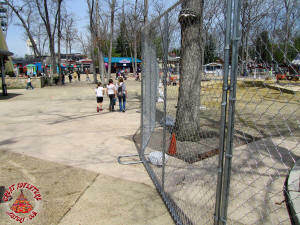 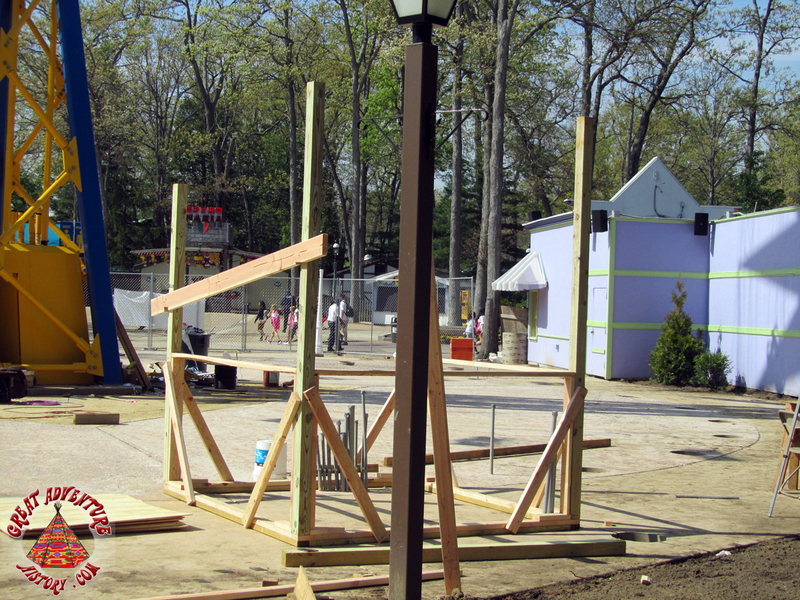 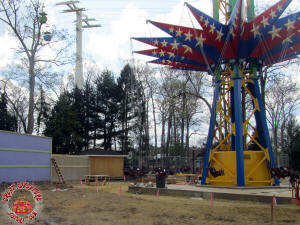 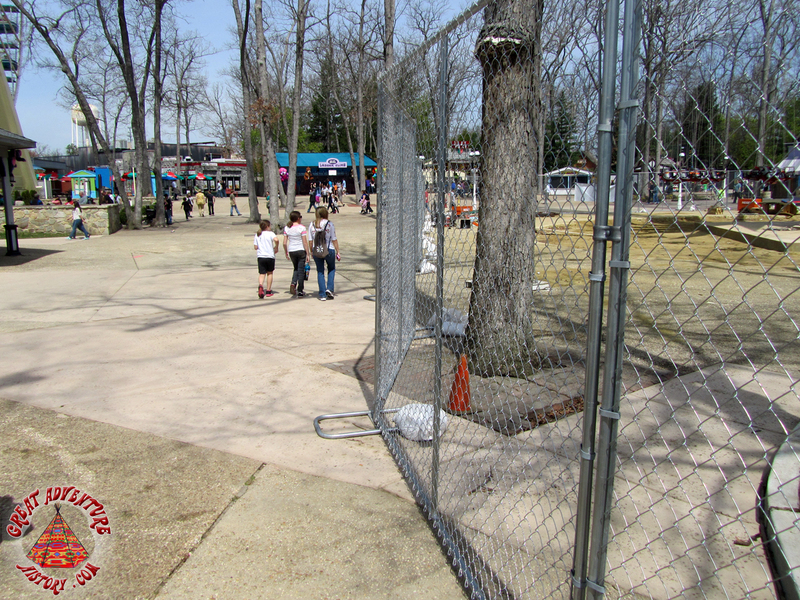 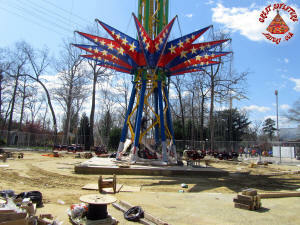 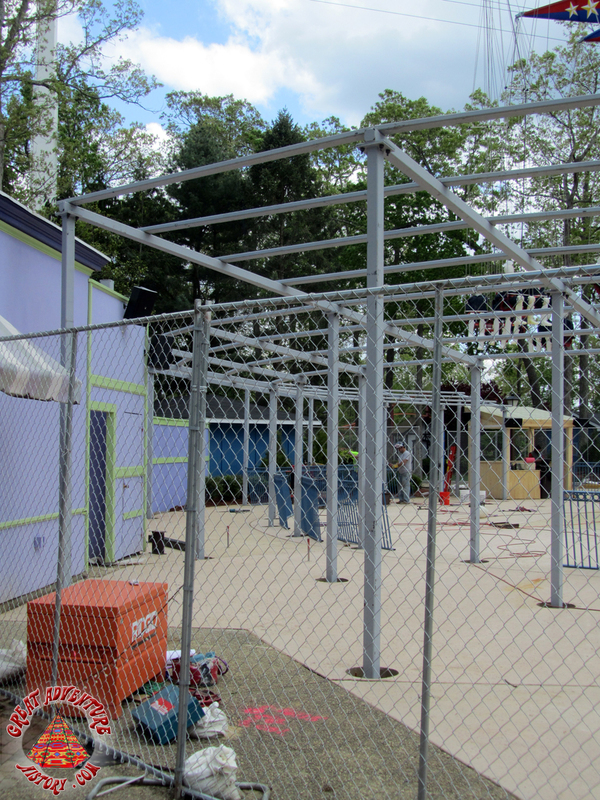 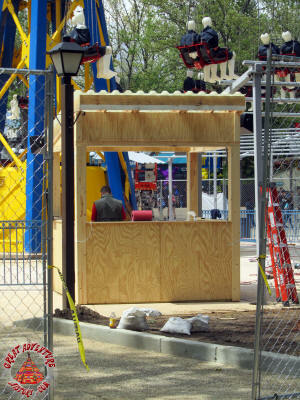 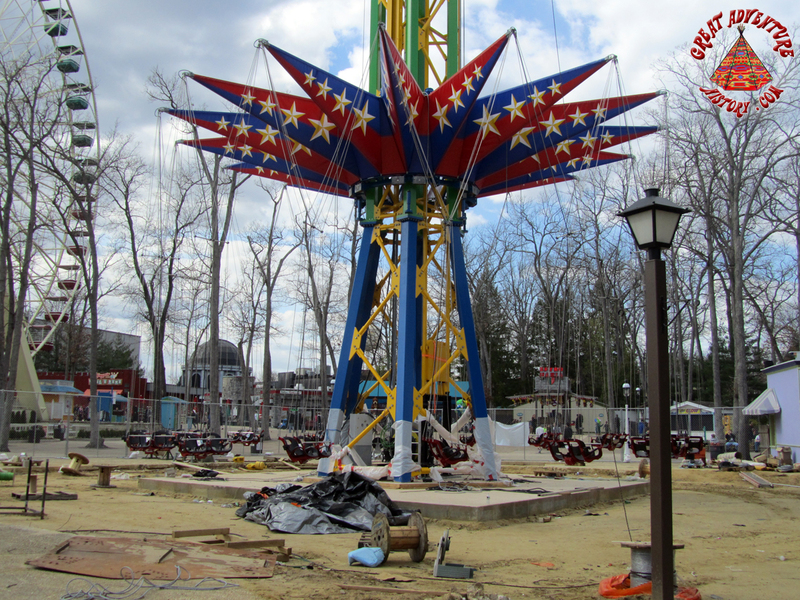 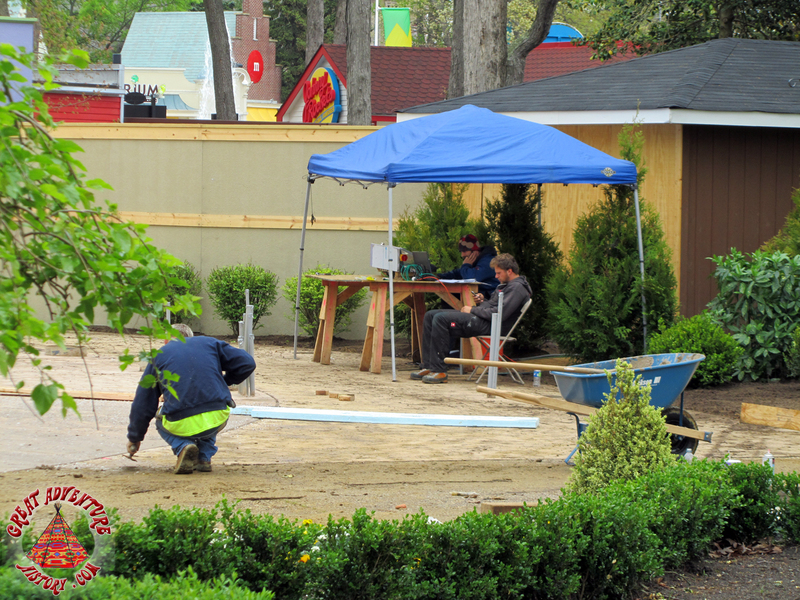 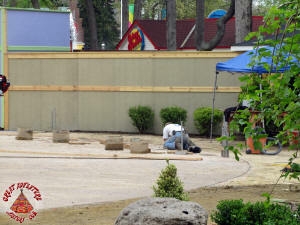 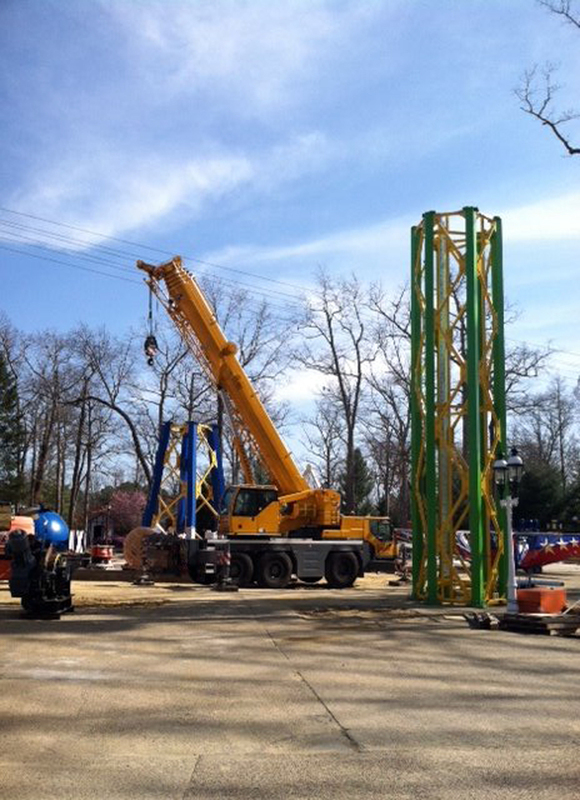 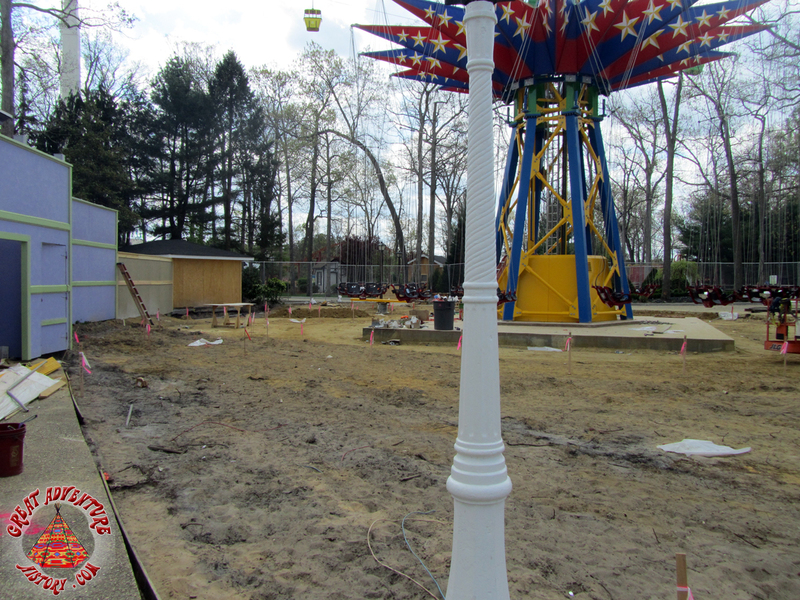 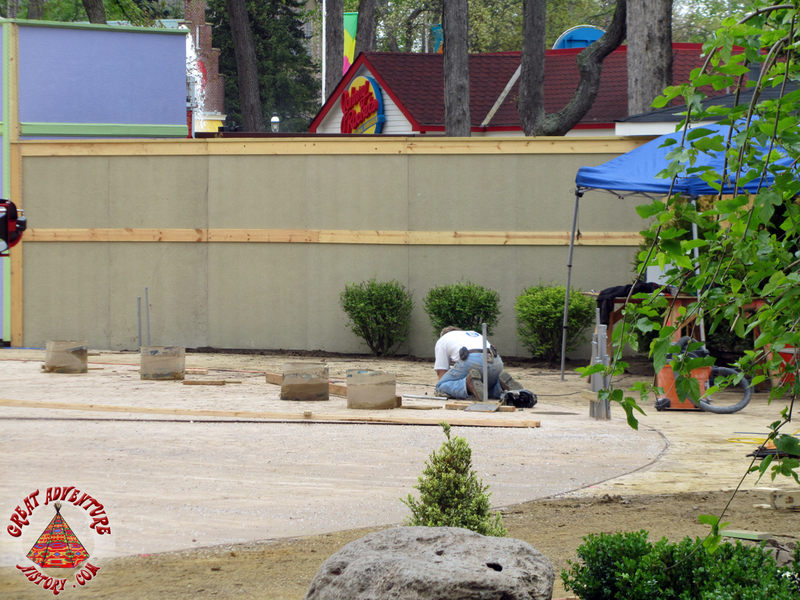 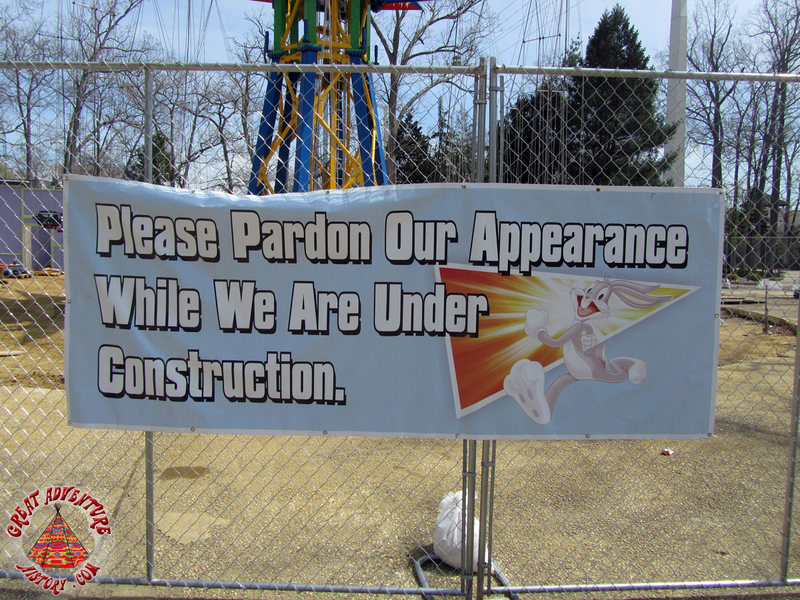 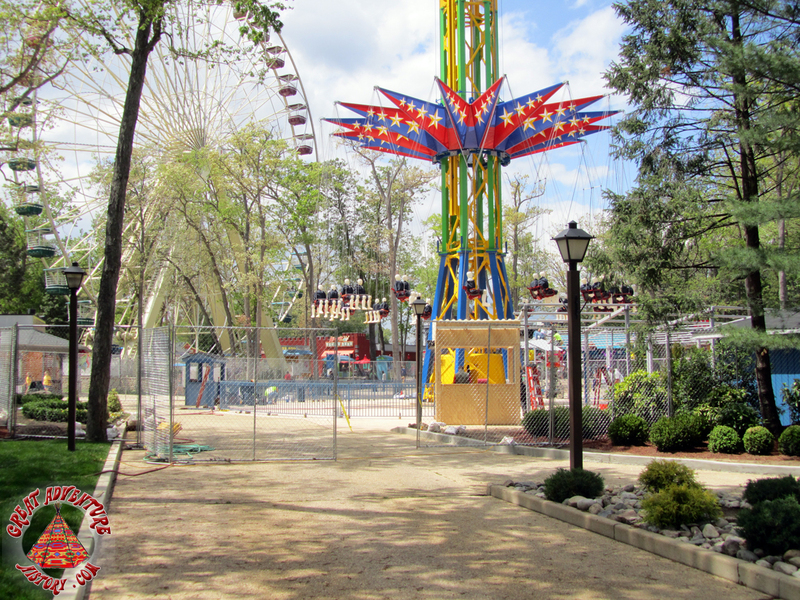 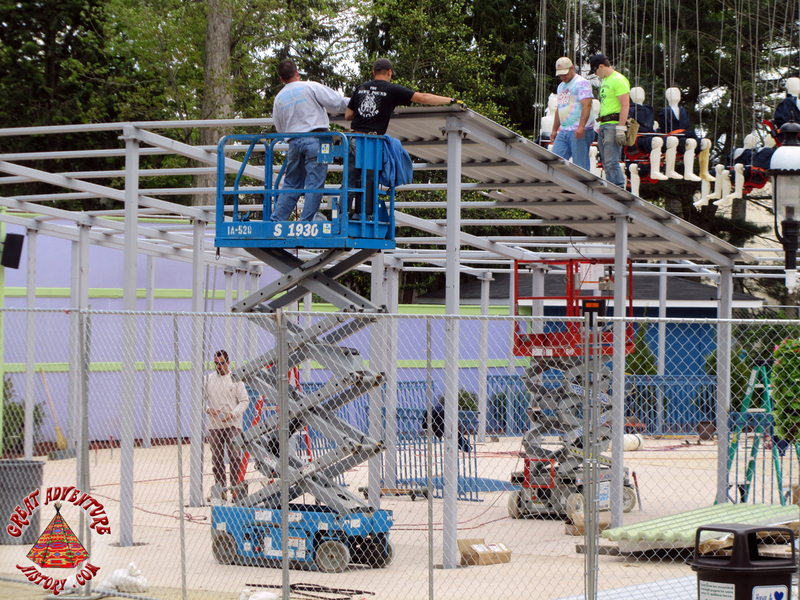 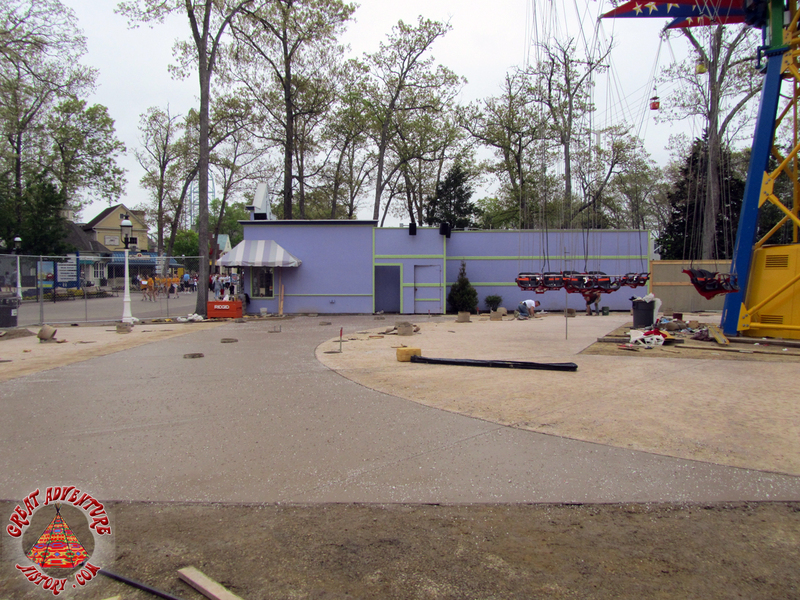 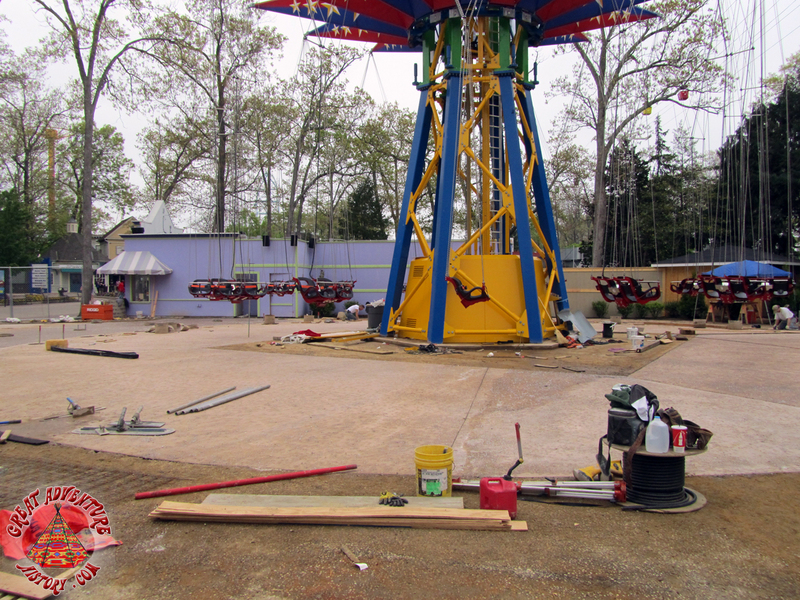 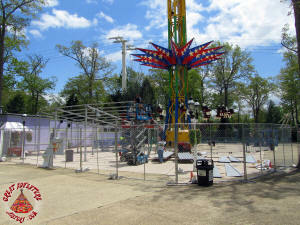 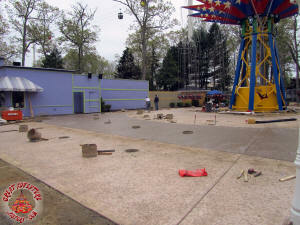 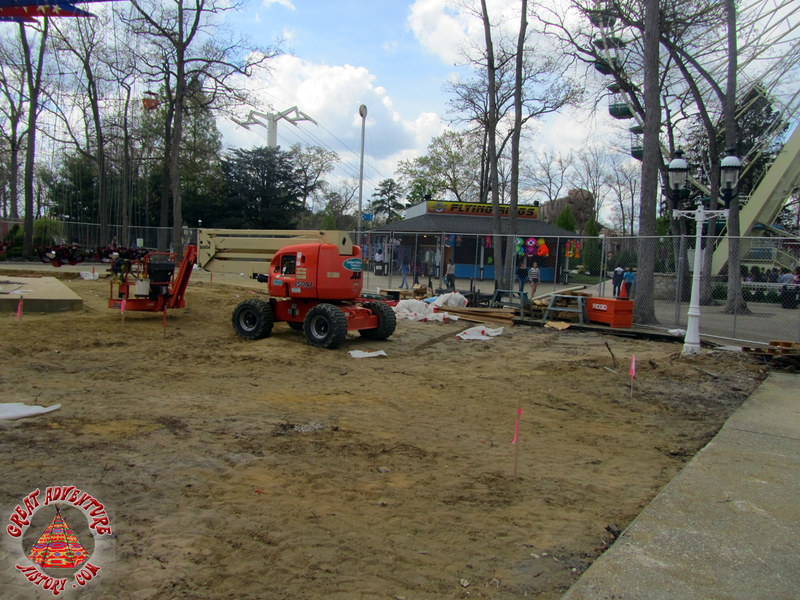 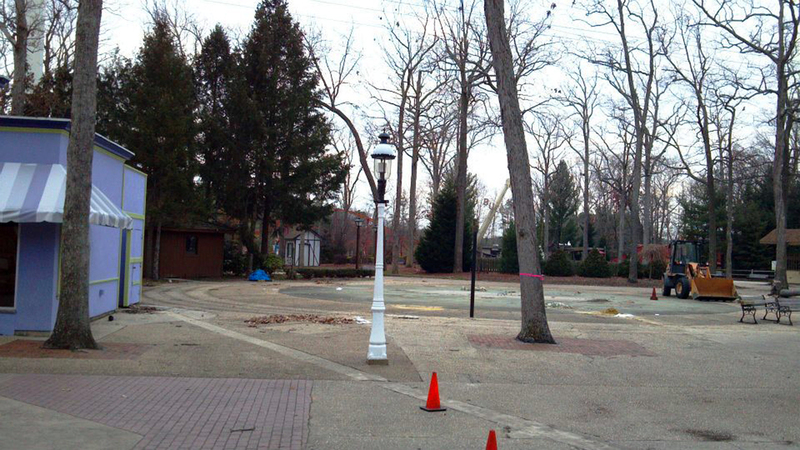 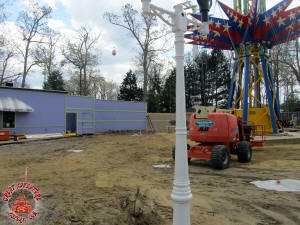 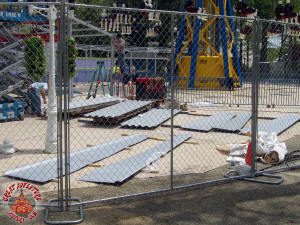 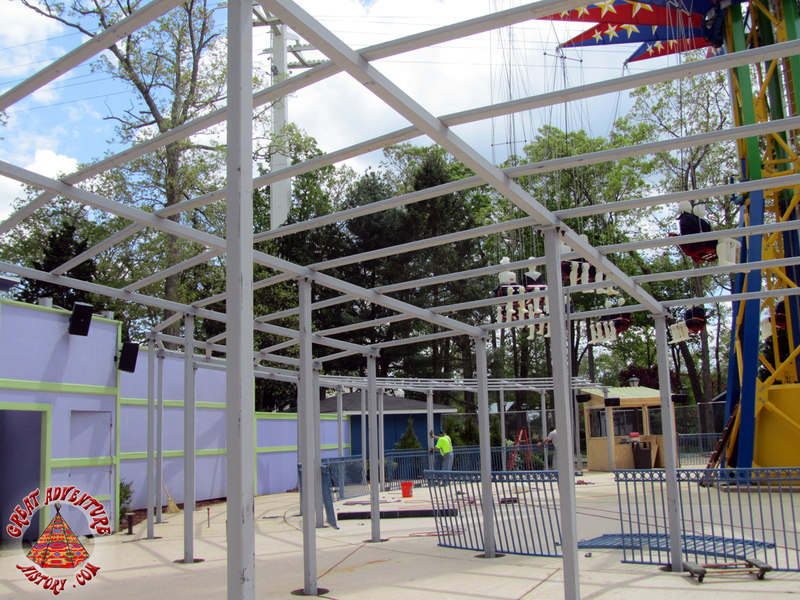 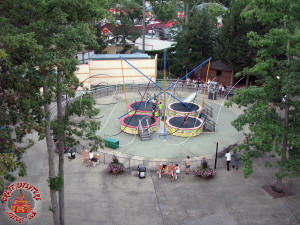 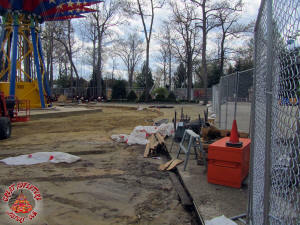 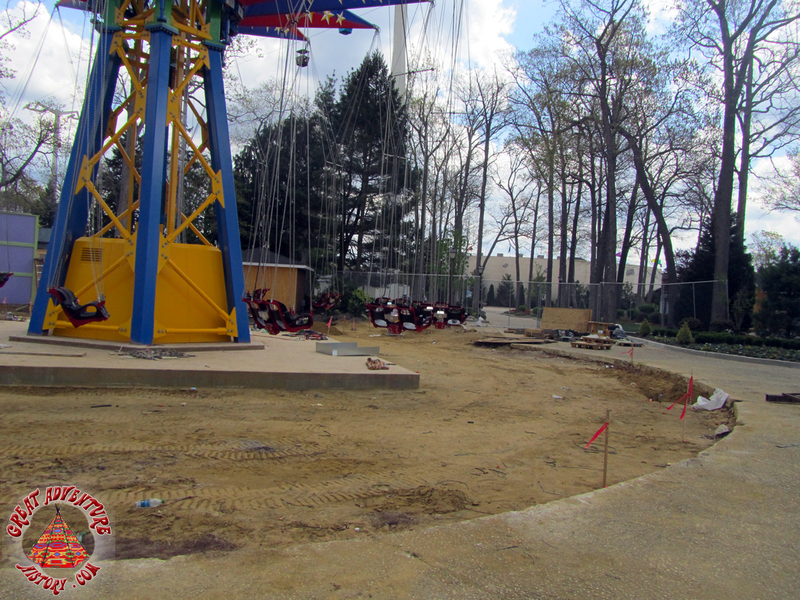 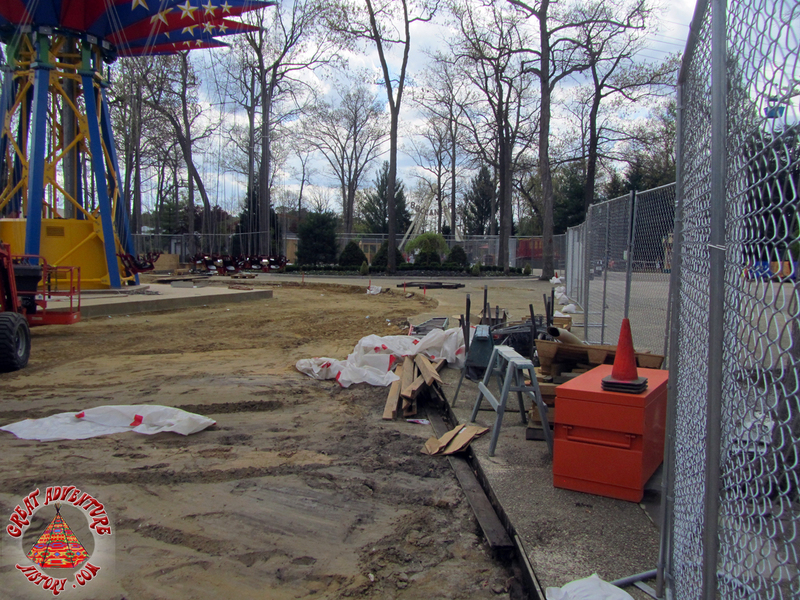 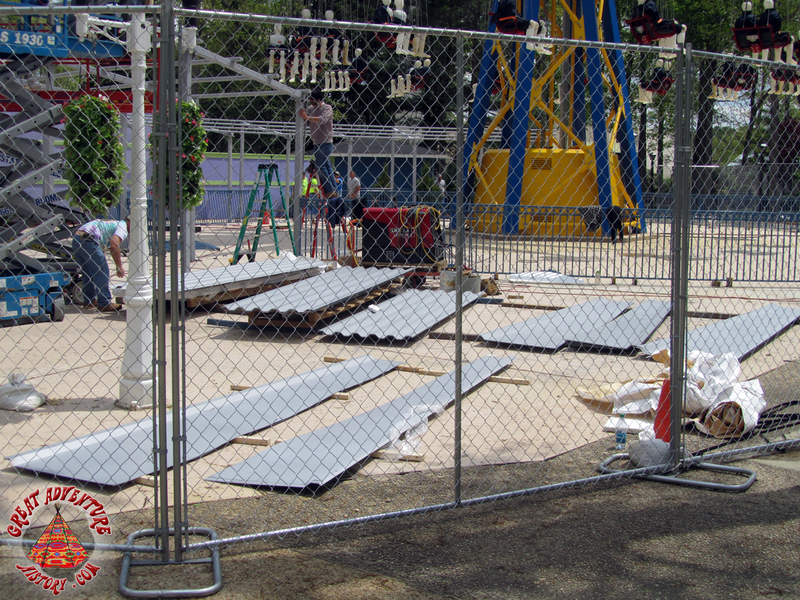 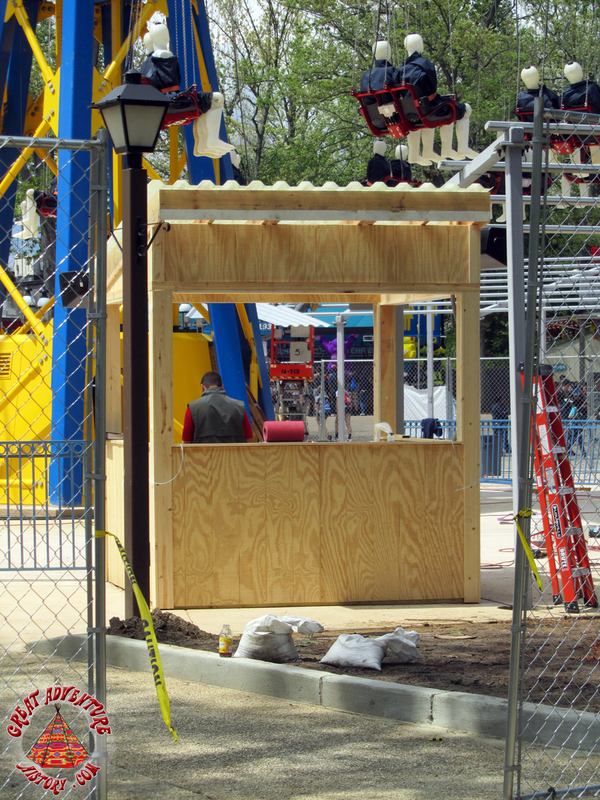 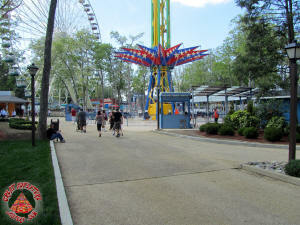 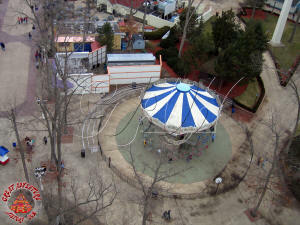 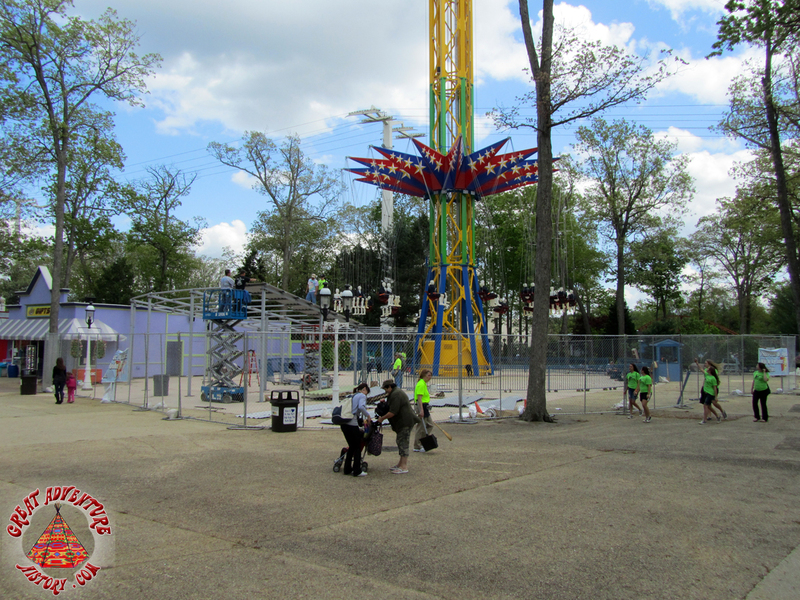 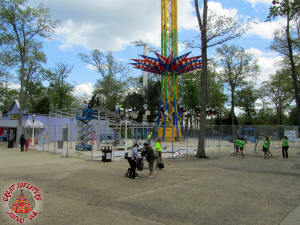 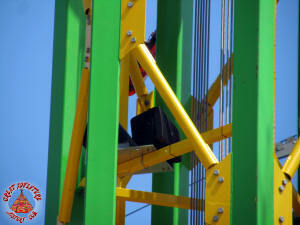 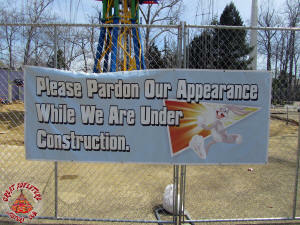 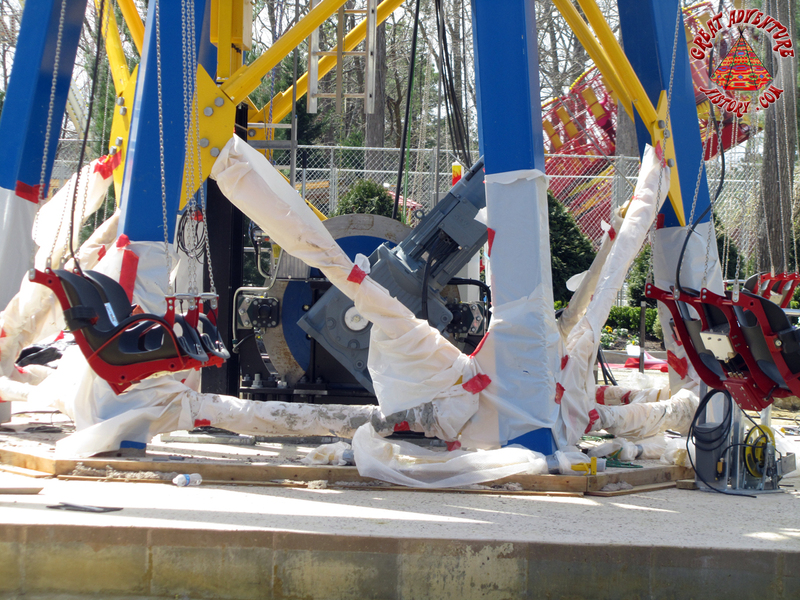 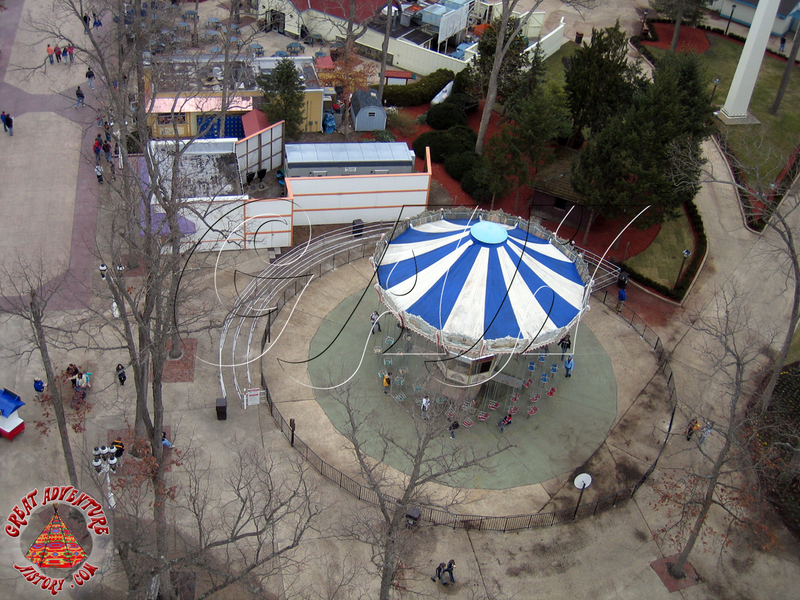 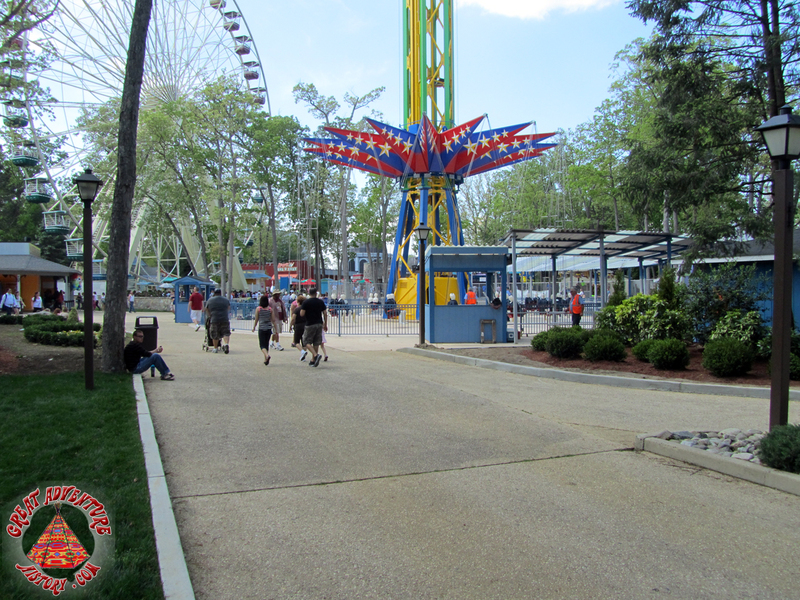 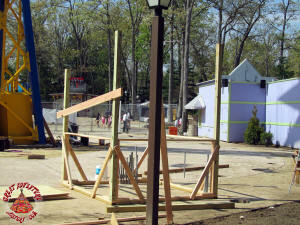 Early construction photos courtesy of Six Flags Great Adventure. 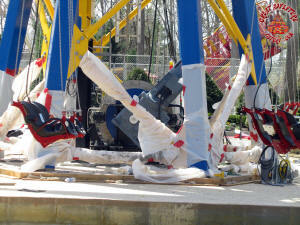 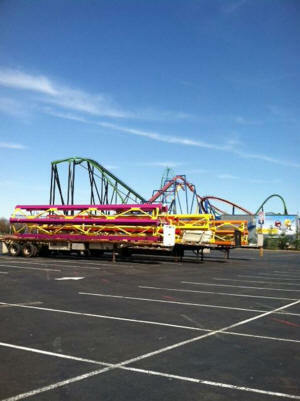 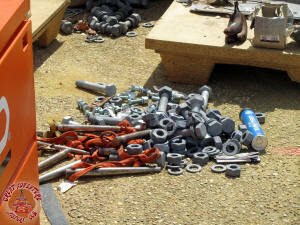 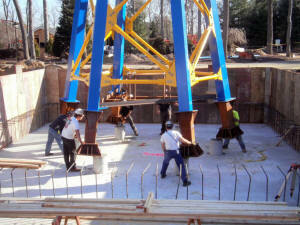 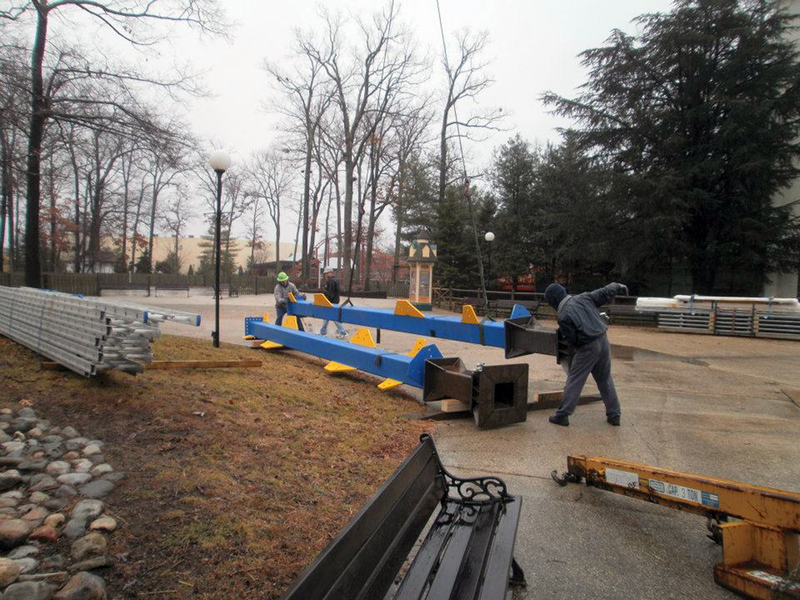 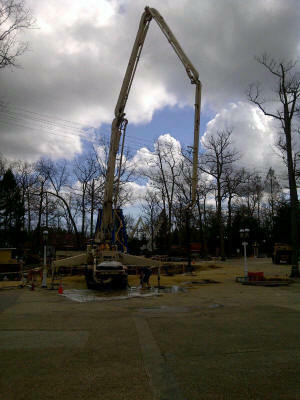 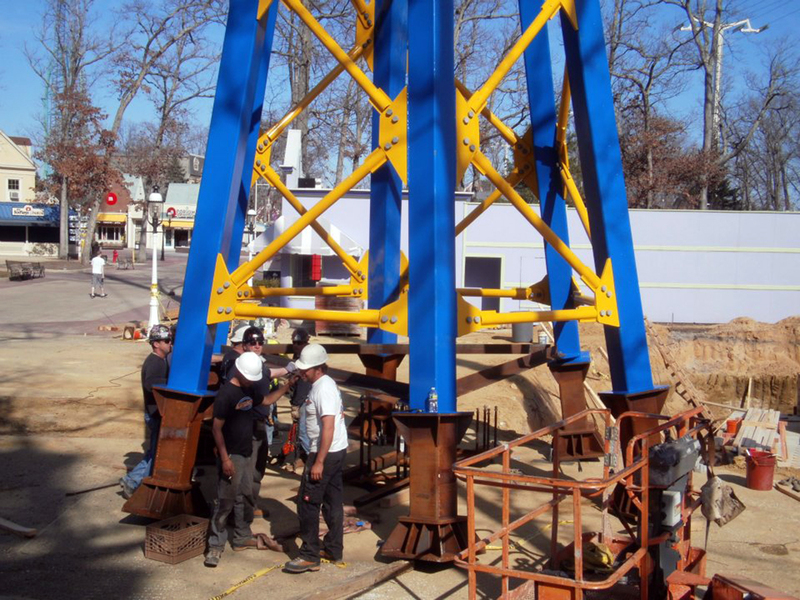 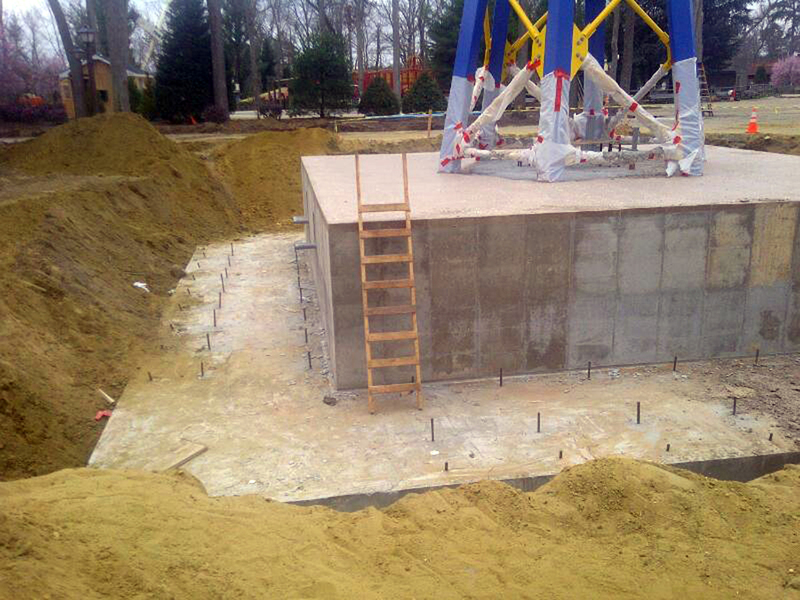 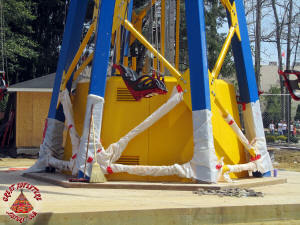 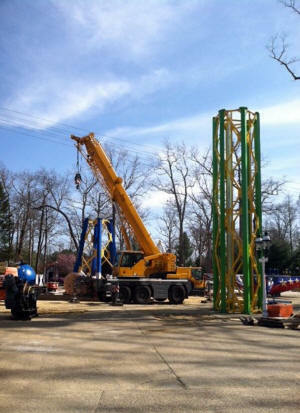 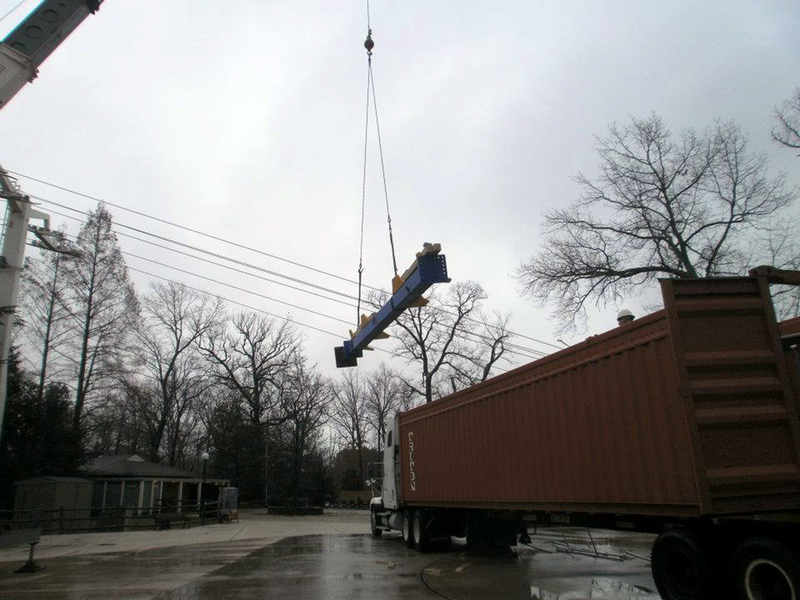 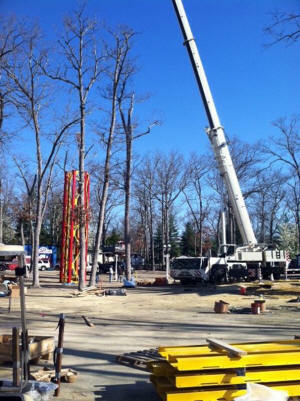 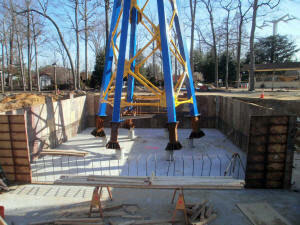 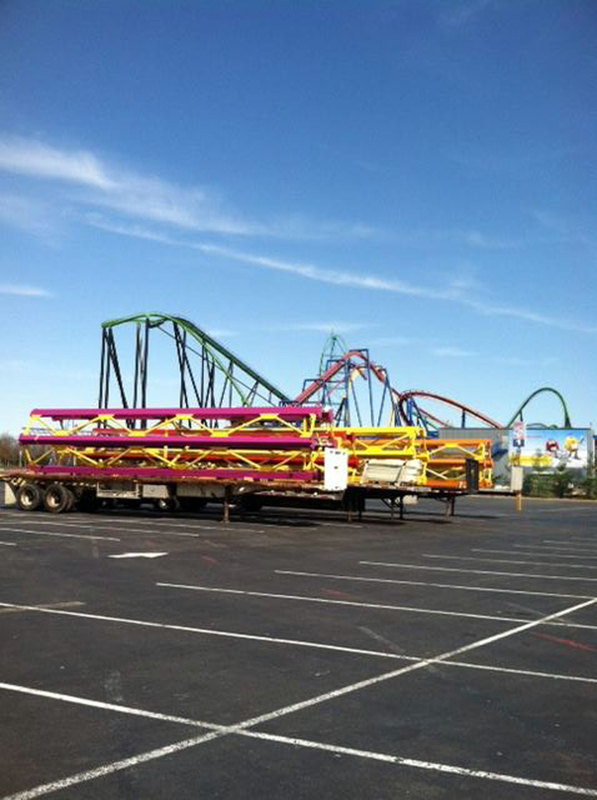 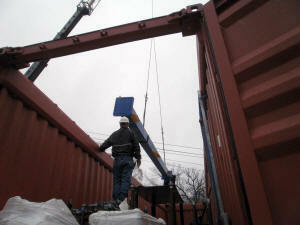 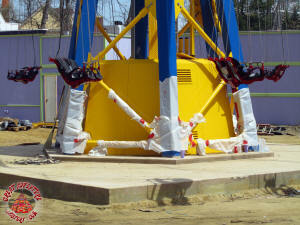 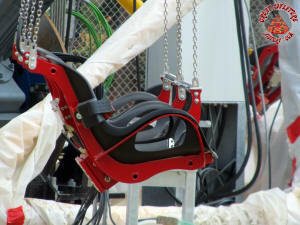 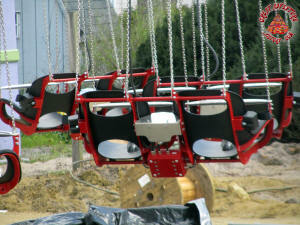 Over the winter of 2011-2012 site preparation began for the new Sky Screamer and parts of the ride began to arrive on site. 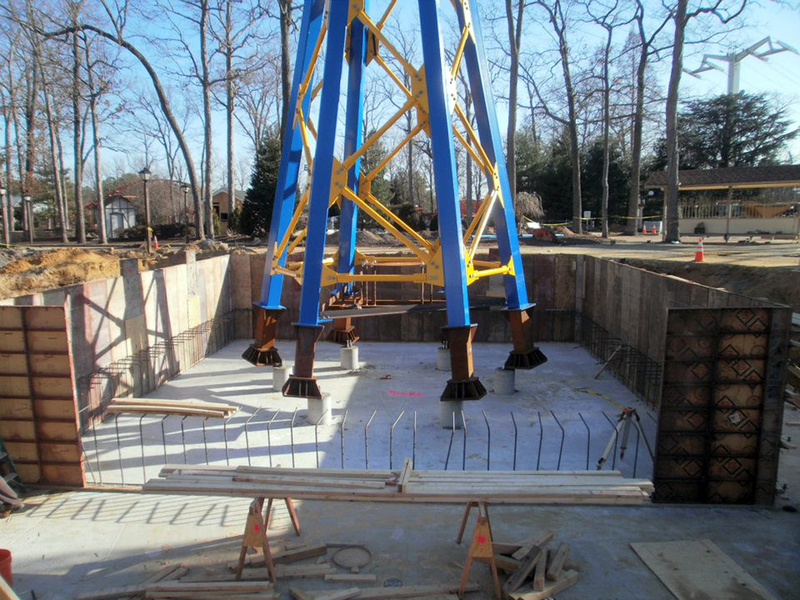 With the massive concrete footer in place, the steel tower base was assembled and installed and the remainder of the concrete was filled in around it. 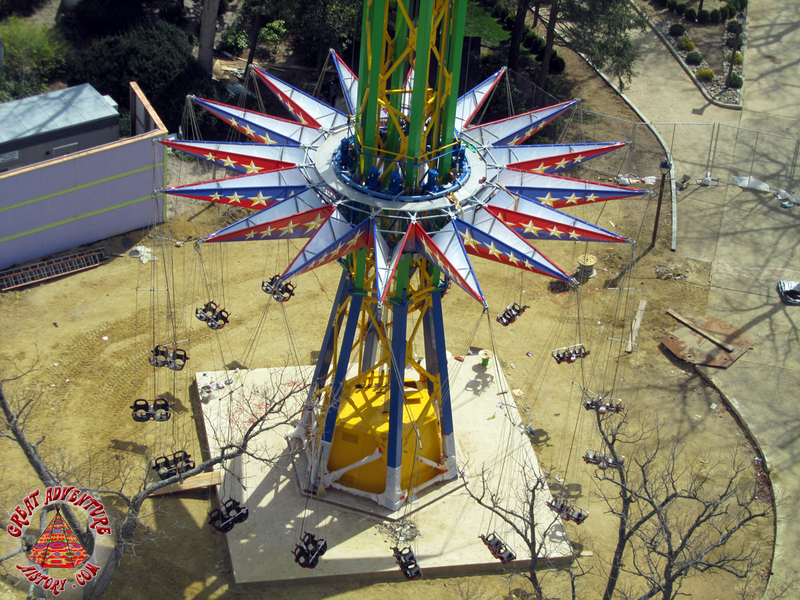 With the base complete, the first section of the tower was placed and the ride unit which creates the spinning motion, holds the swings, and runs up and down the tower, was assembled in place. 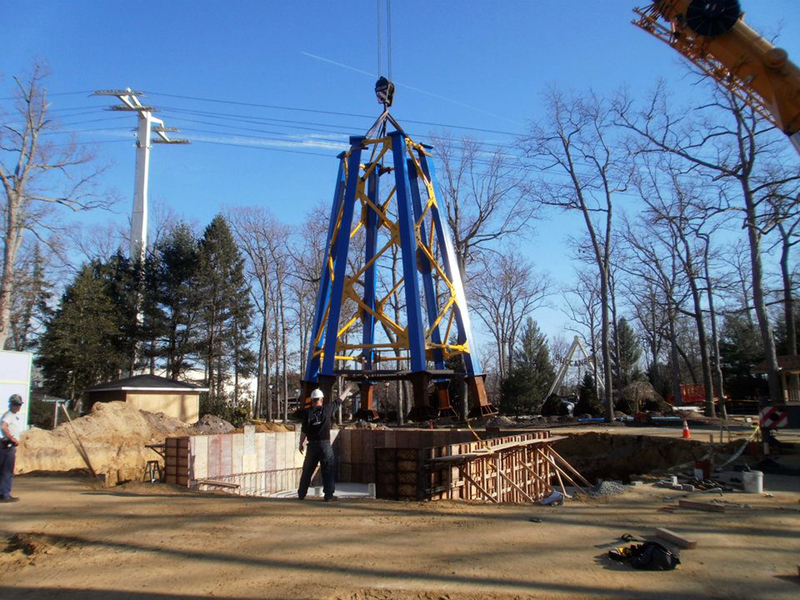 The additional sections of the tower were hoisted into place with a crane until finally the delicate looking lattice frame reached its finished height. 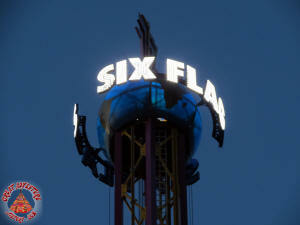 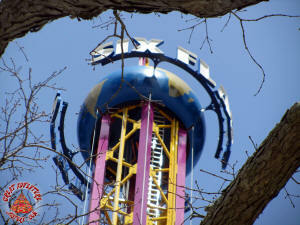 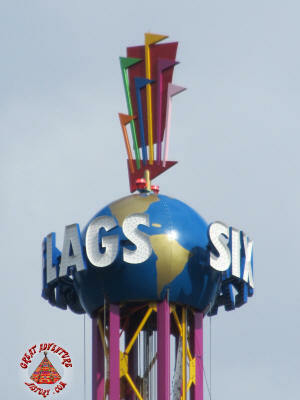 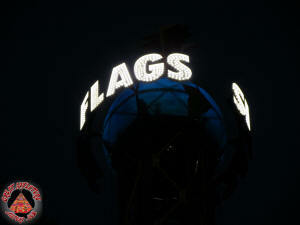 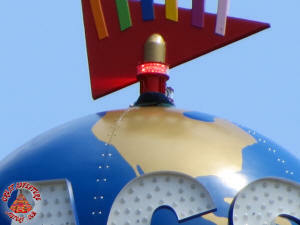 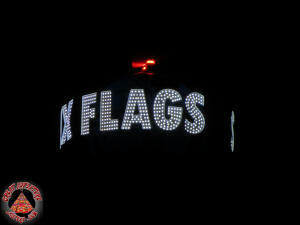 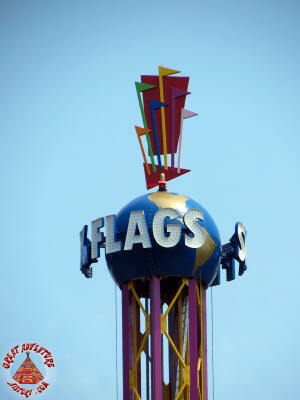 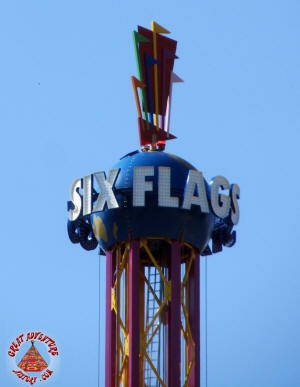 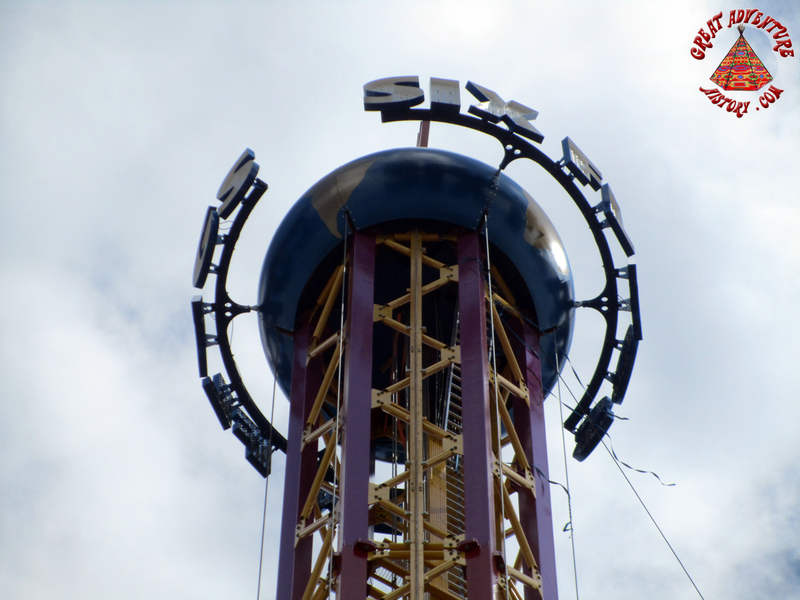 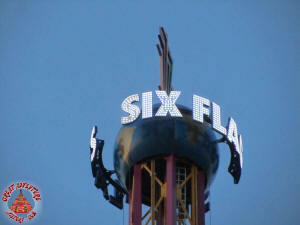 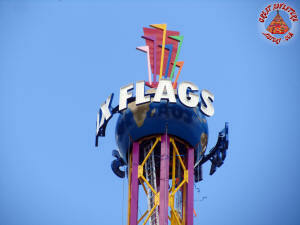 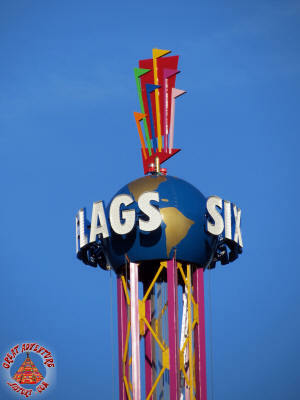 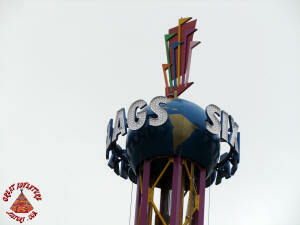 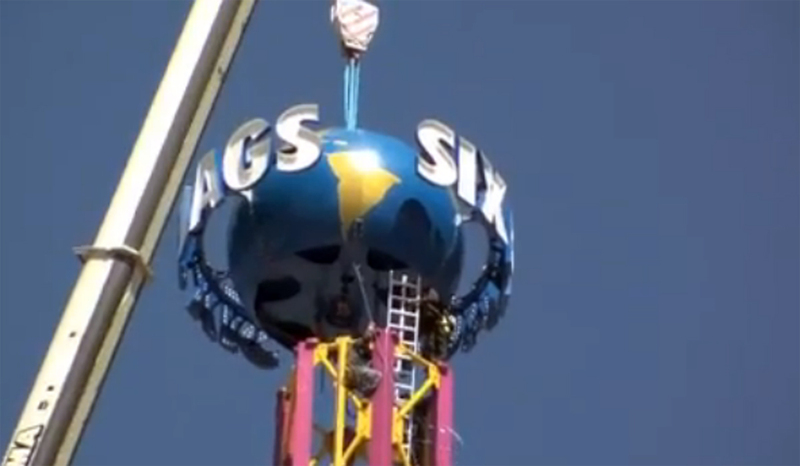 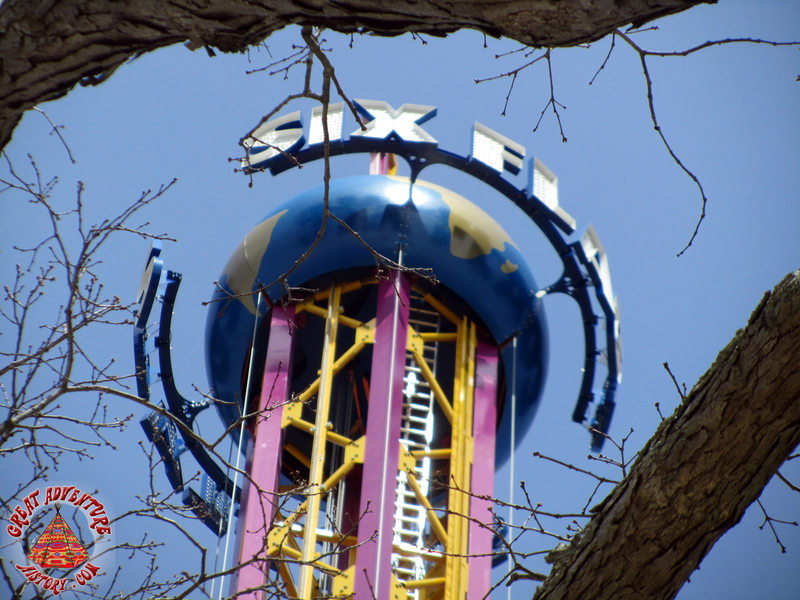 To top the ride off, a large globe with the Six Flags name was placed on the top of the tower. 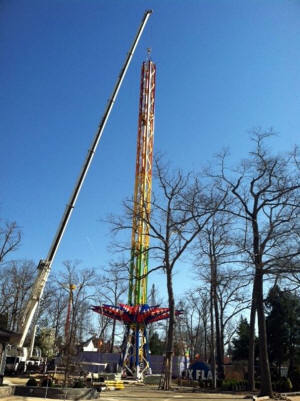 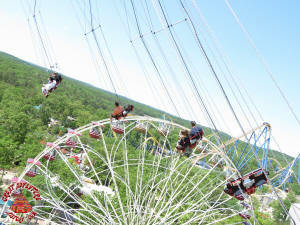 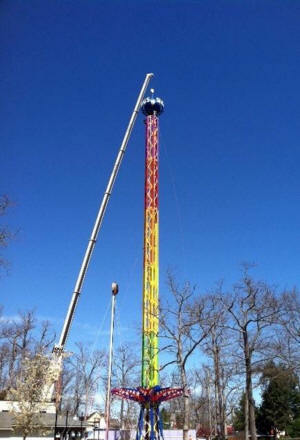 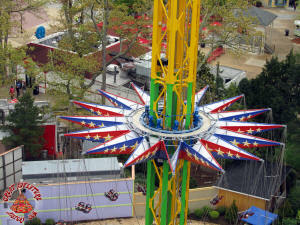 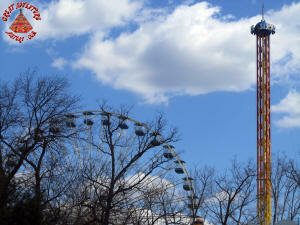 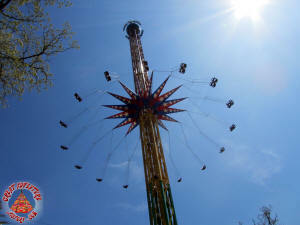 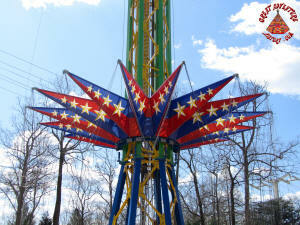 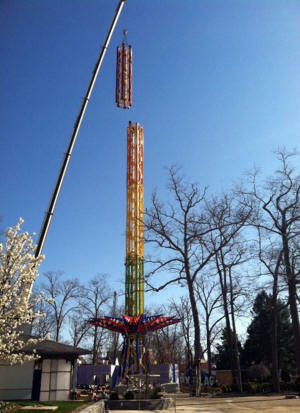 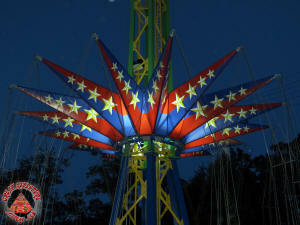 When originally announced, SkyScreamer was suppose to be a 150 foot tall ride. 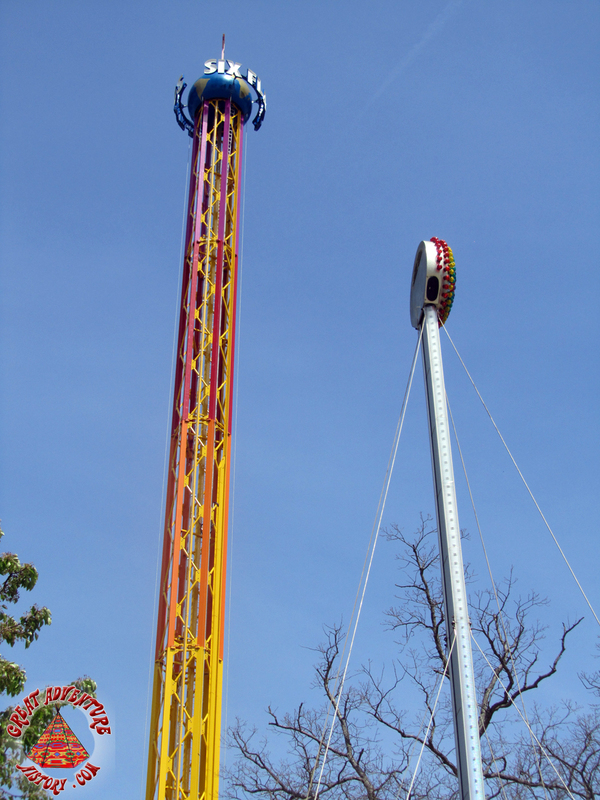 Thanks to some reallocation of funds, the height of the tower was increased with a 242 foot ride joining the Great Adventure skyline. 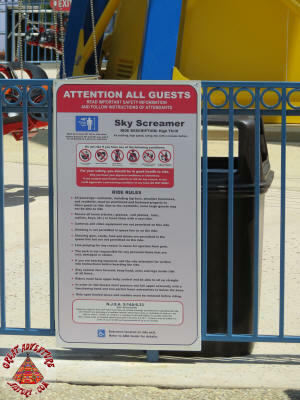 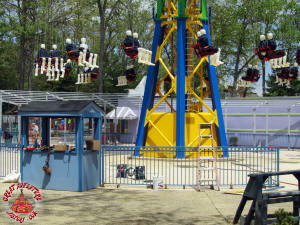 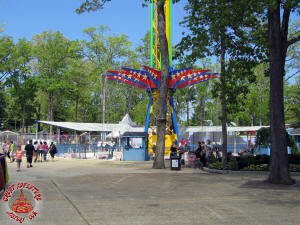 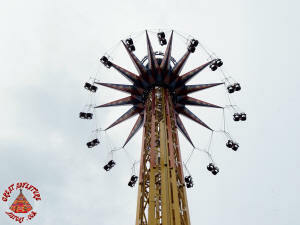 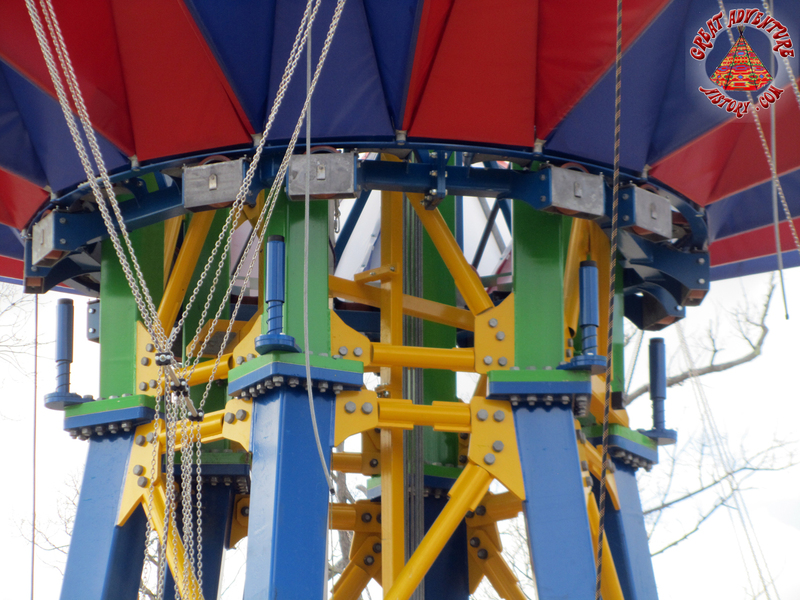 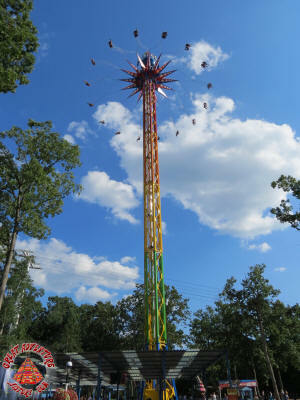 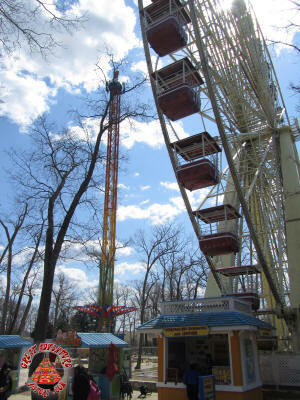 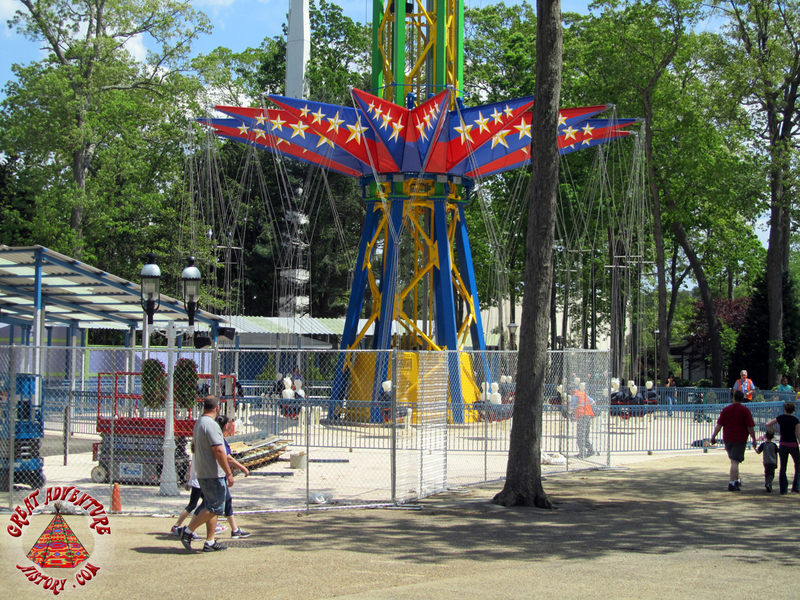 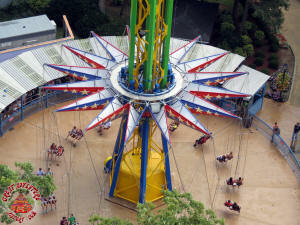 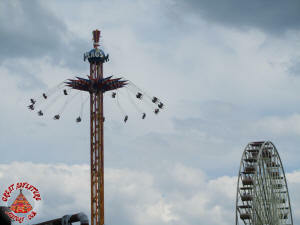 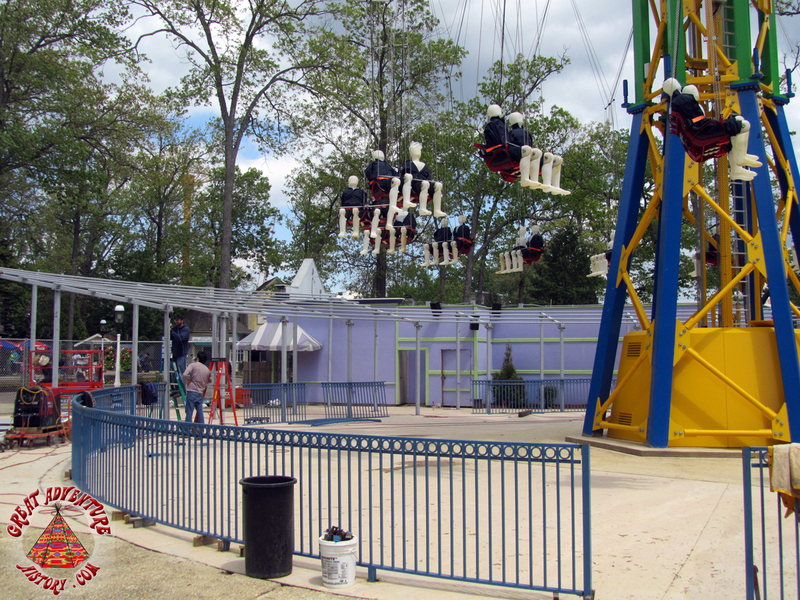 The Sky Screamer was the anchor ride of the newly re-themed and refurbished Adventure Alley section of the park that opened in spring of 2012. 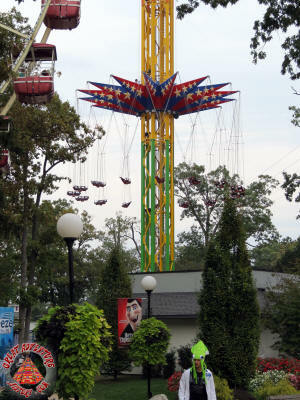 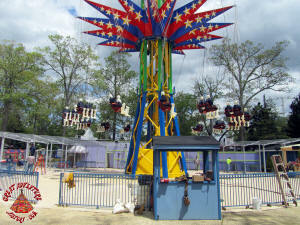 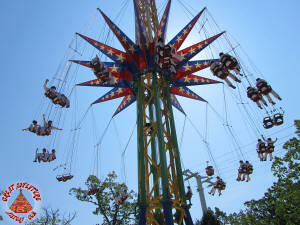 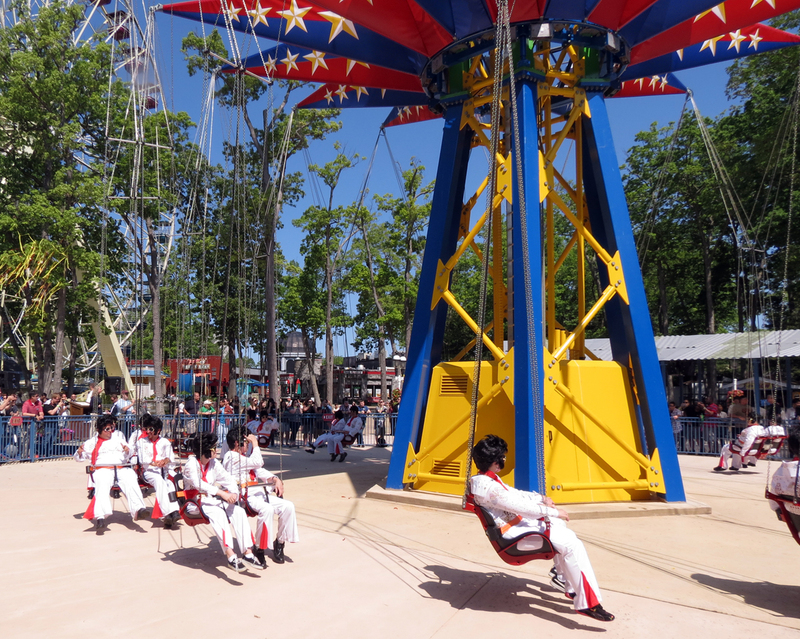 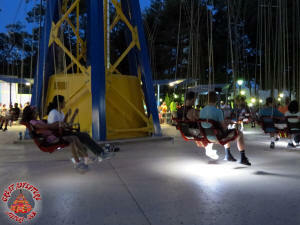 The new ride took the idea of the swing ride that had previously occupied the same location to new heights and created a new landmark for the park. The simple looking ride was highly complex and required weeks of work to complete all of the ride's safety systems and mechanical assembly. 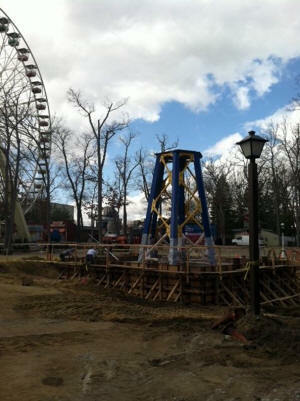 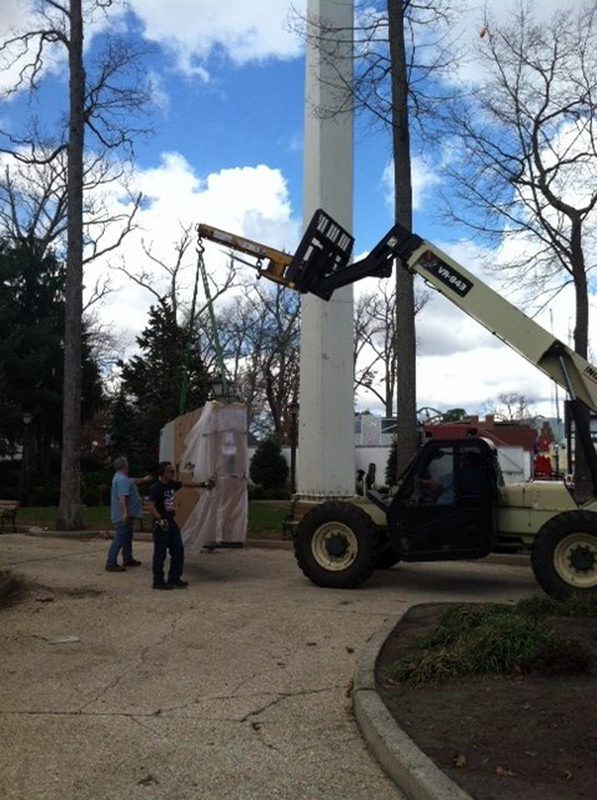 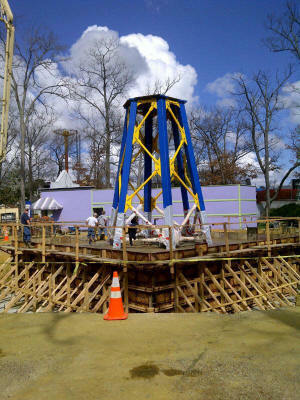 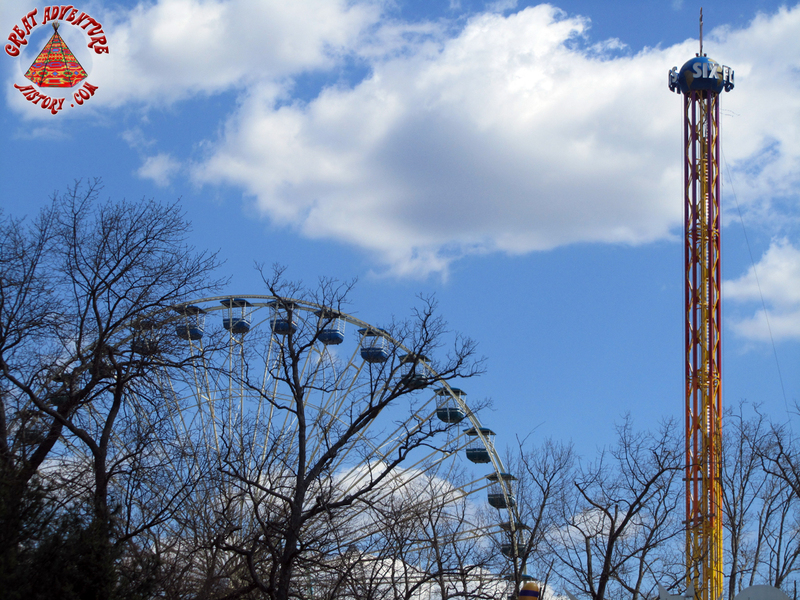 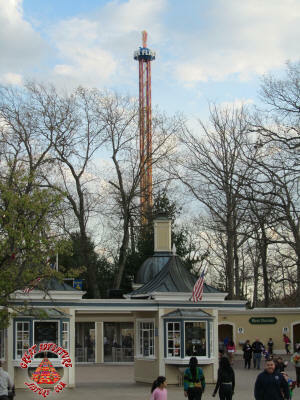 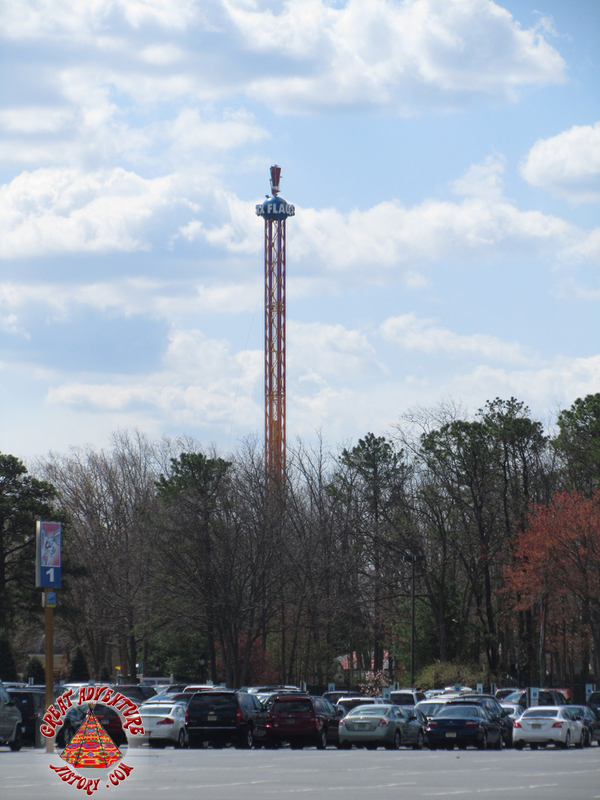 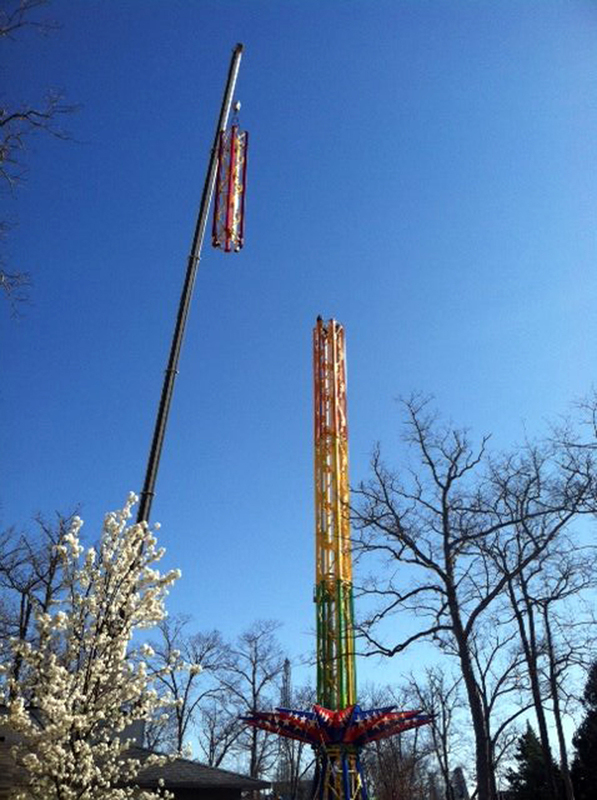 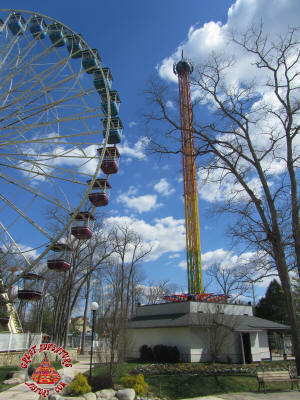 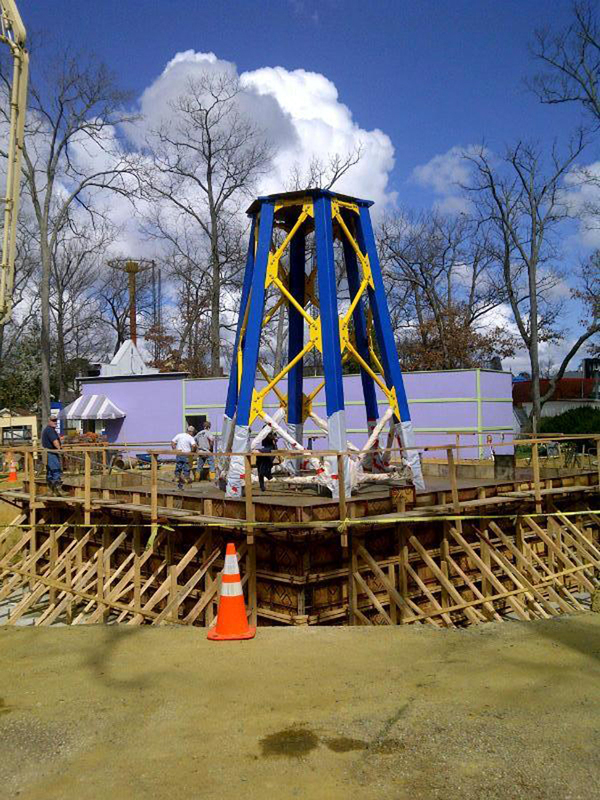 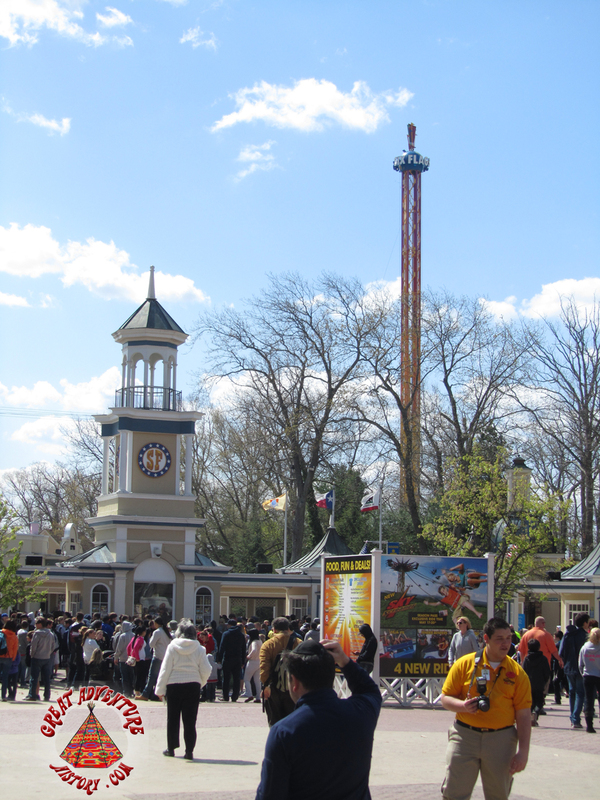 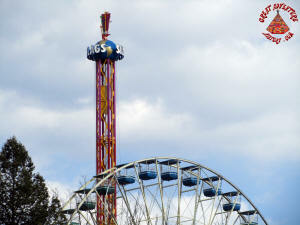 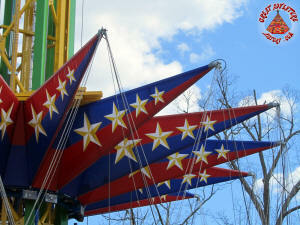 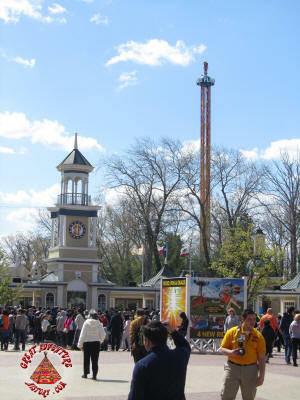 The tower was erected during the month of March and by opening day in early April the ride structure was complete. As April passed and May began, the ride drew closer to completion. 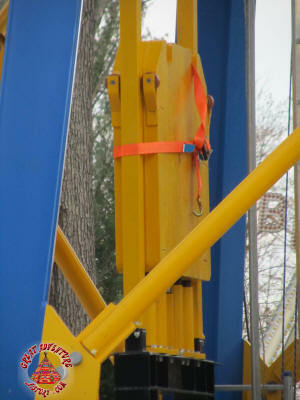 Adjustments were made once the central counterweight was installed. 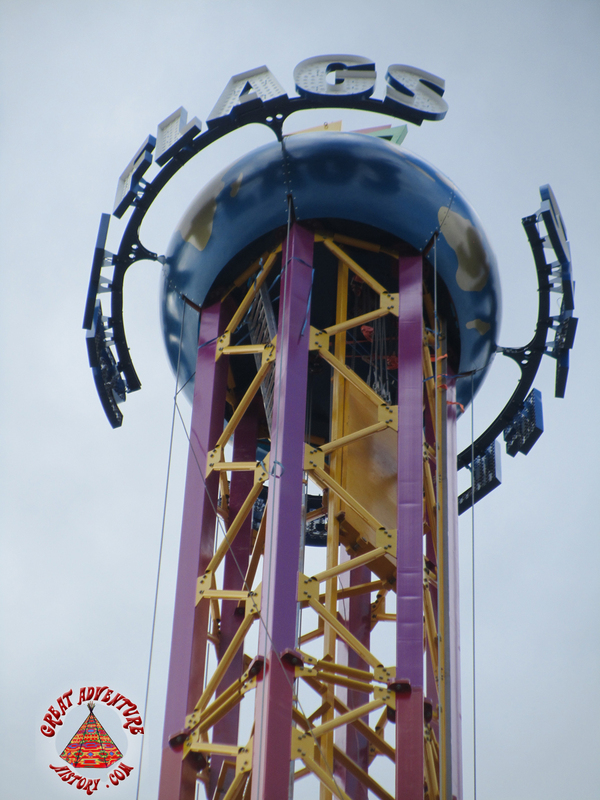 The counterweight allowed the ride carriage to travel up and down the tower smoothly with less power required. 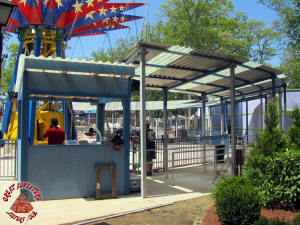 Anticipation grew as the ride weeks ticked on and it looked ready to open. 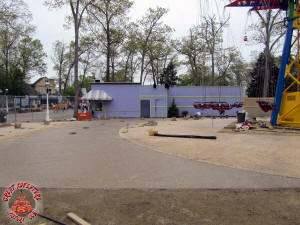 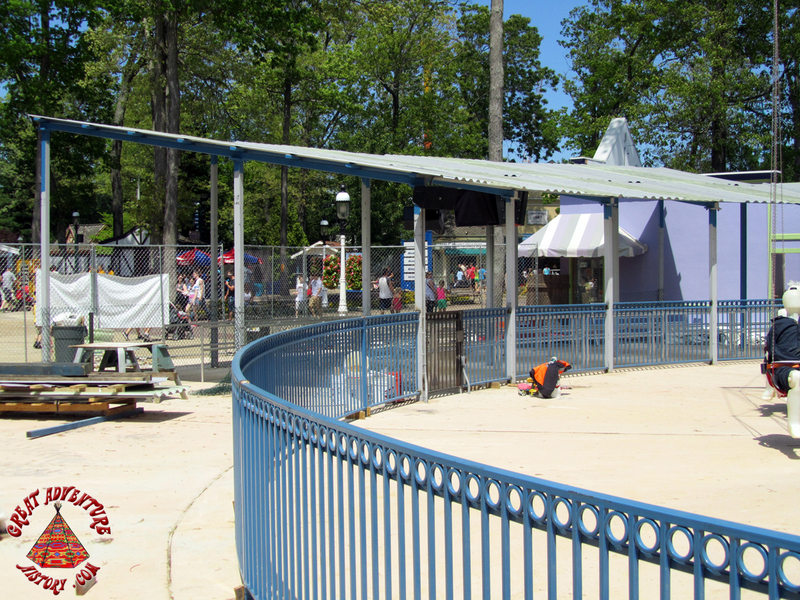 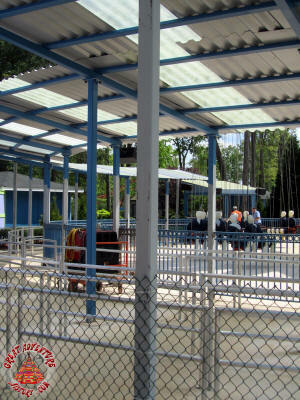 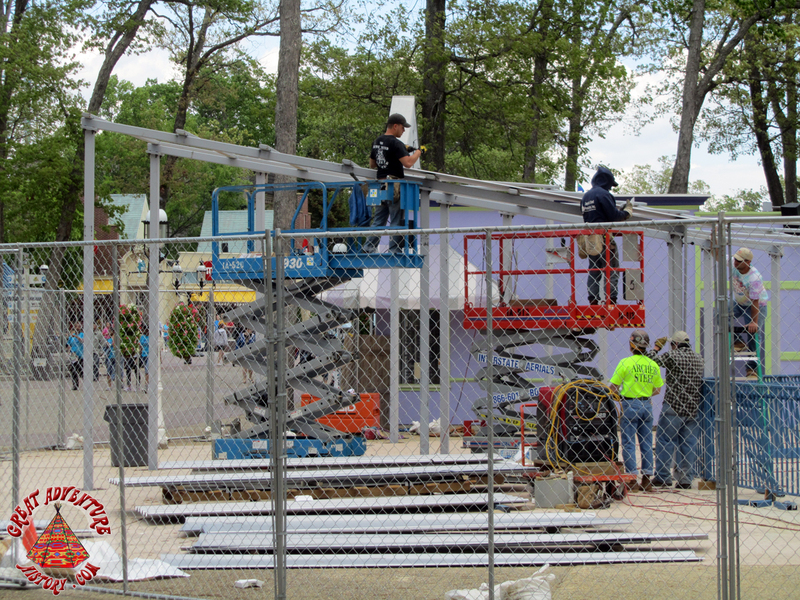 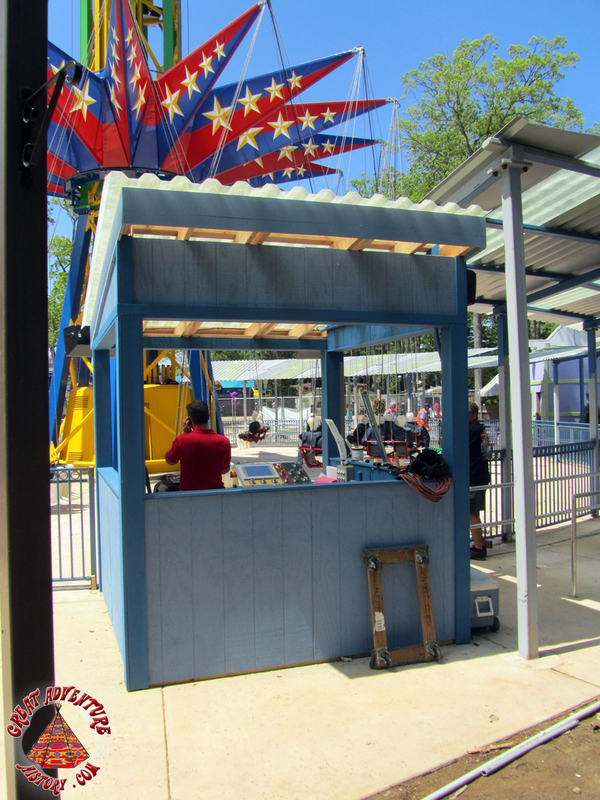 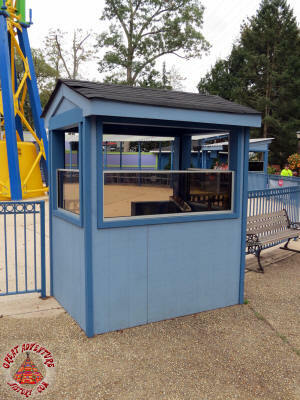 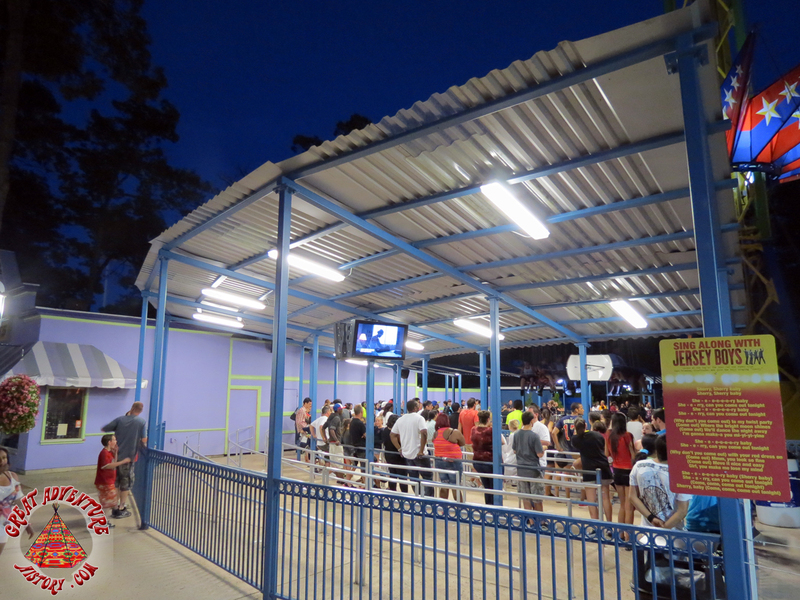 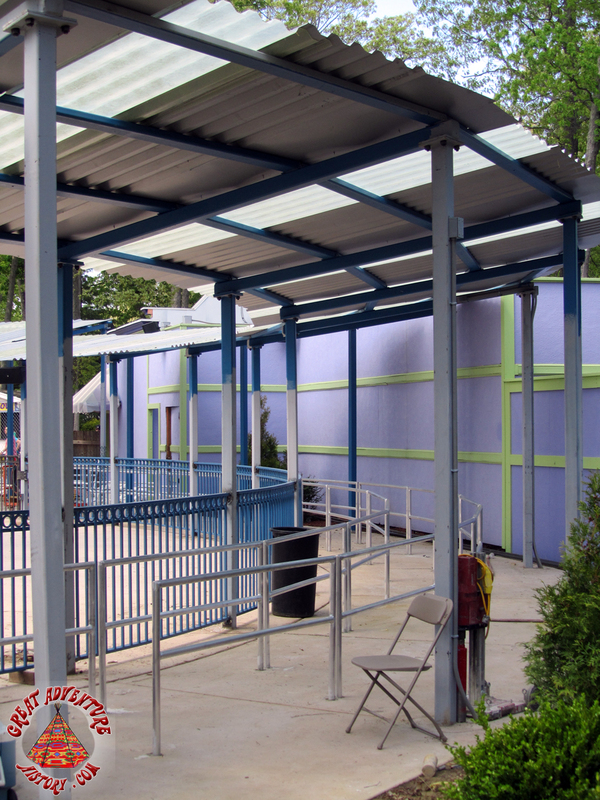 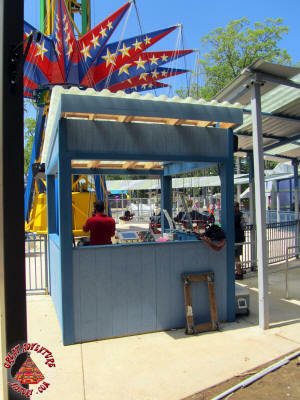 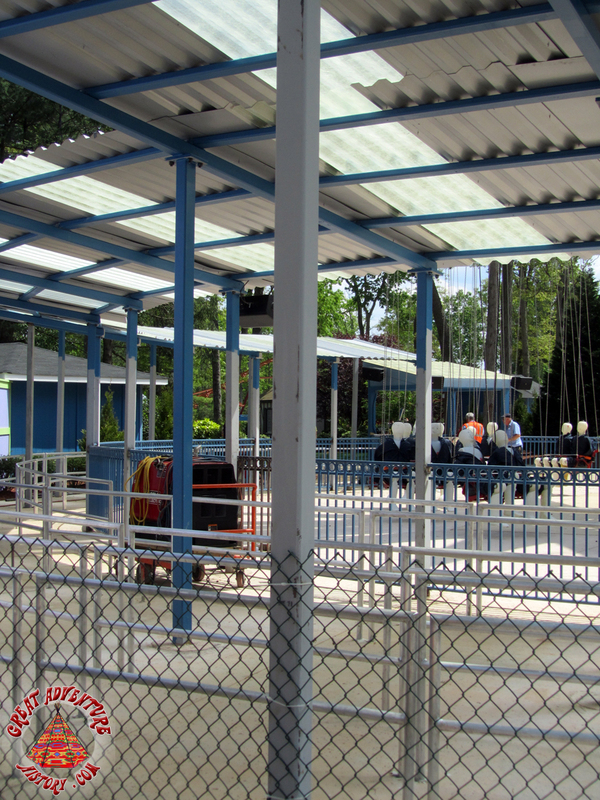 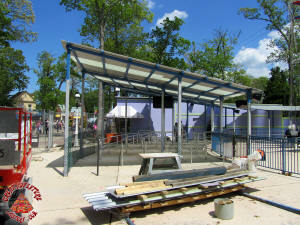 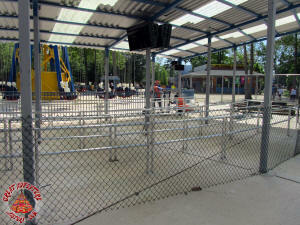 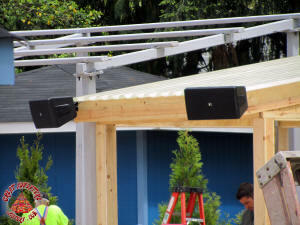 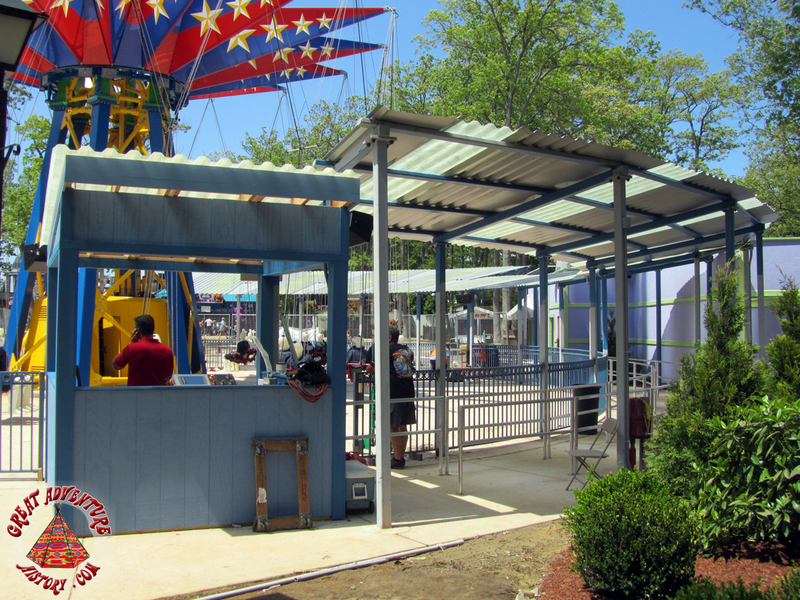 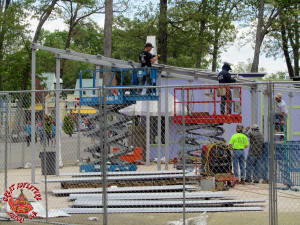 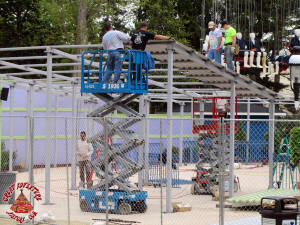 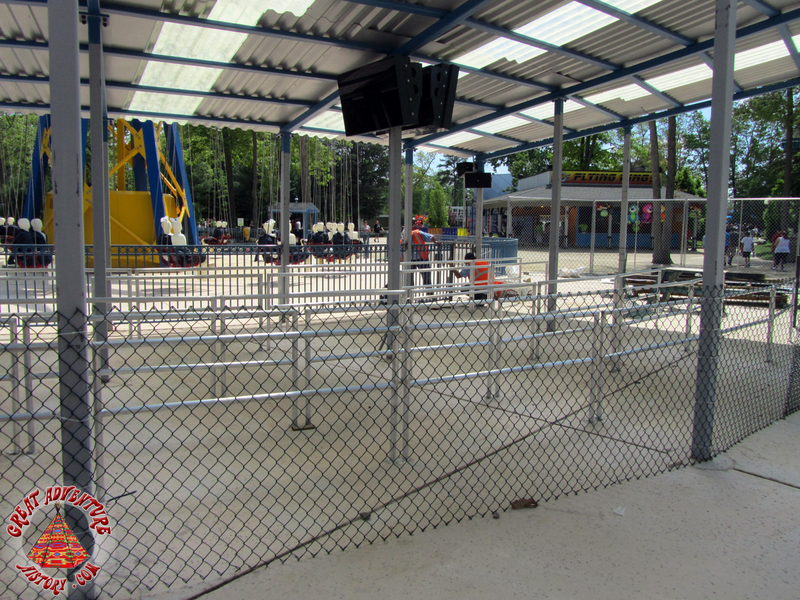 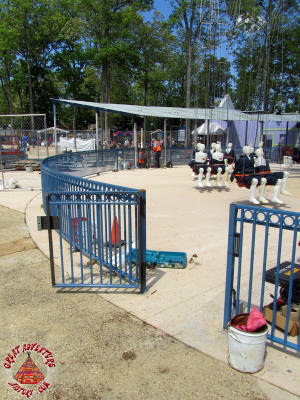 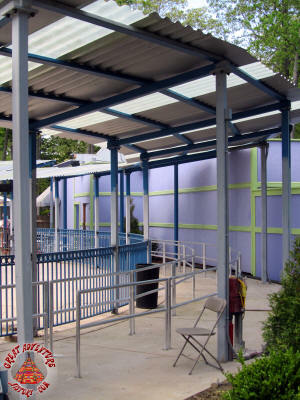 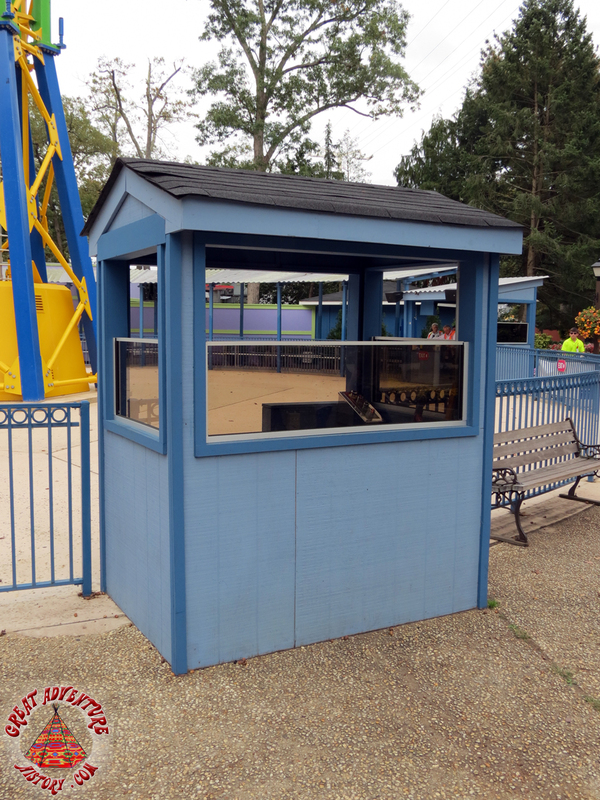 However, there was still much testing and adjusting to do as well as construction of the ride's operator booth, paving of the ride's landing area, as well as building a new covered queue that could handle the large crowds which were expected. 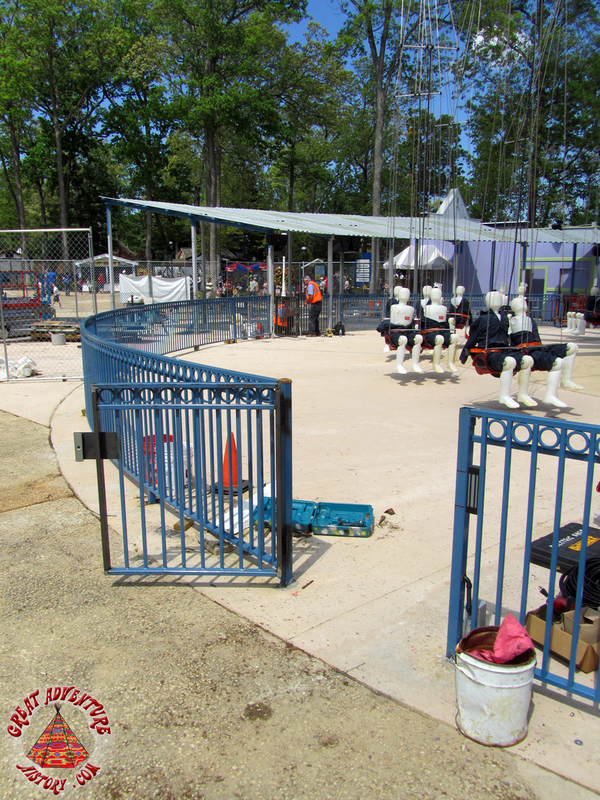 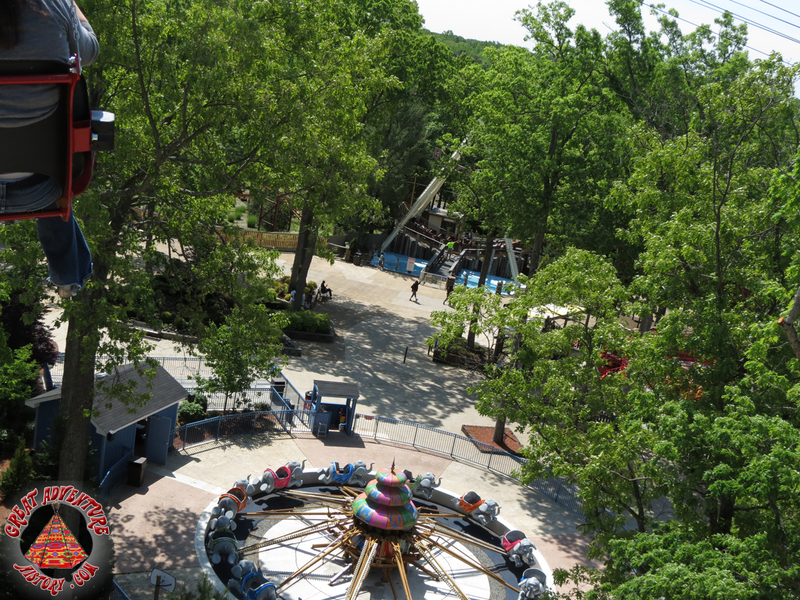 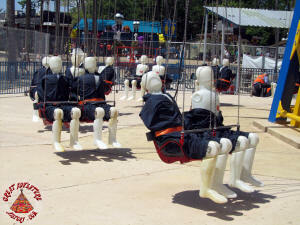 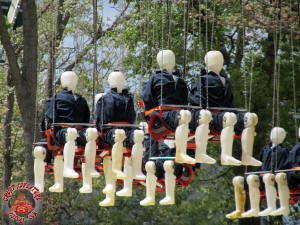 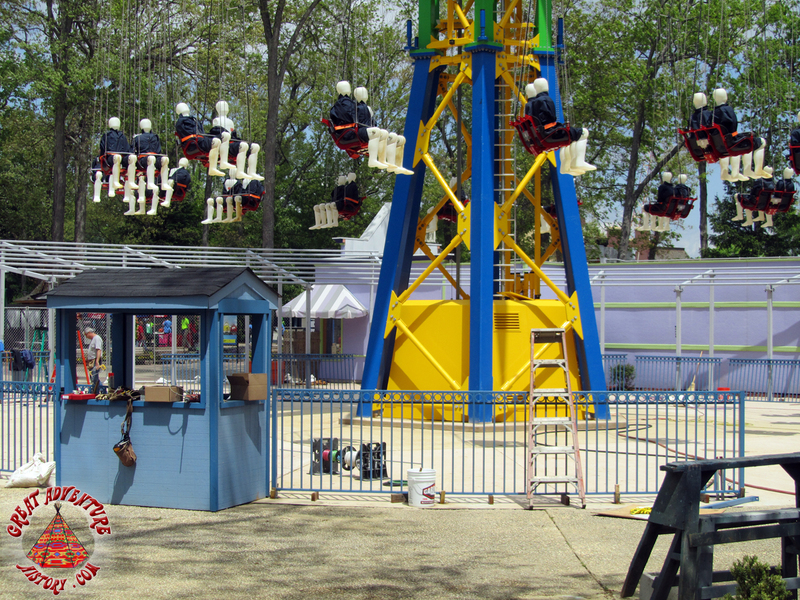 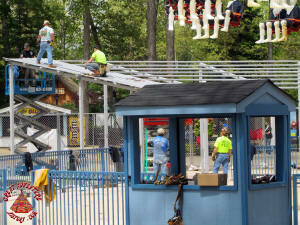 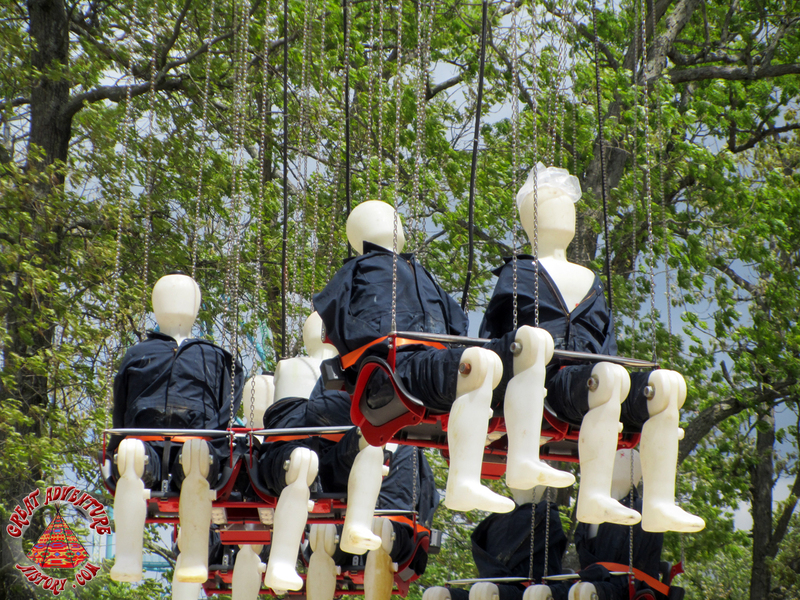 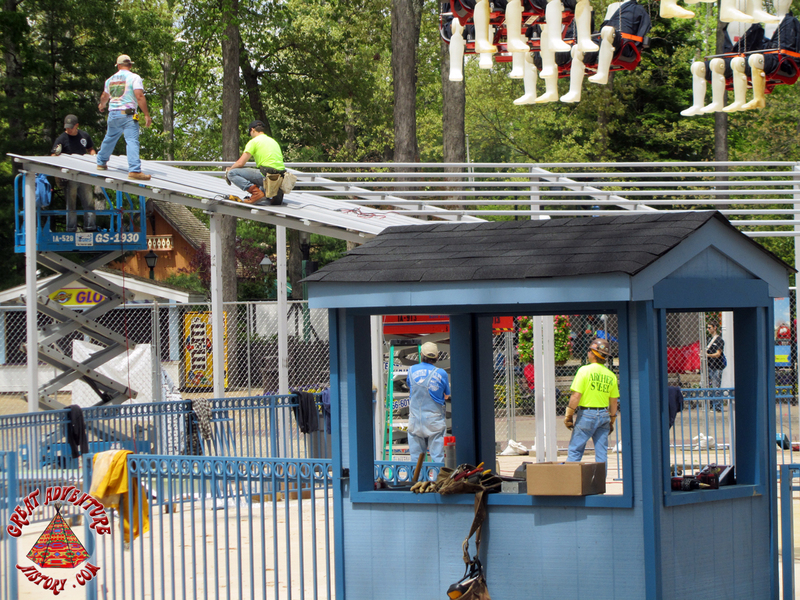 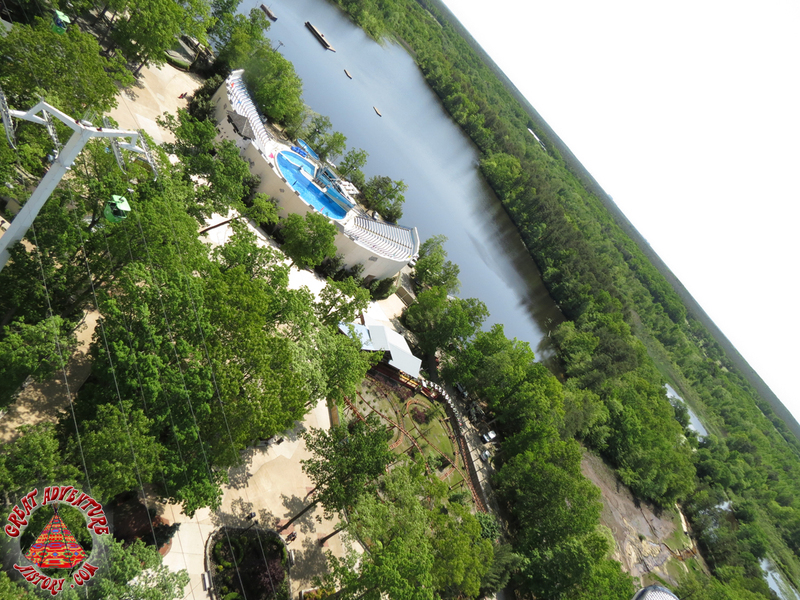 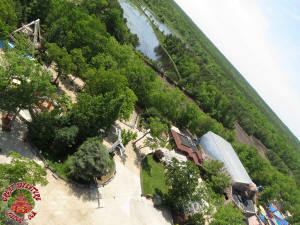 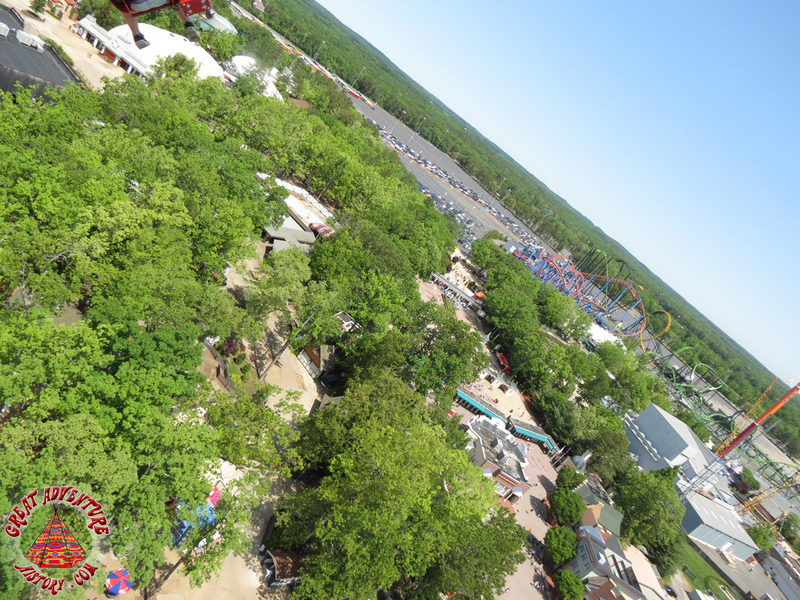 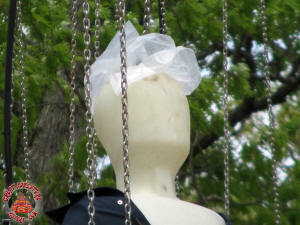 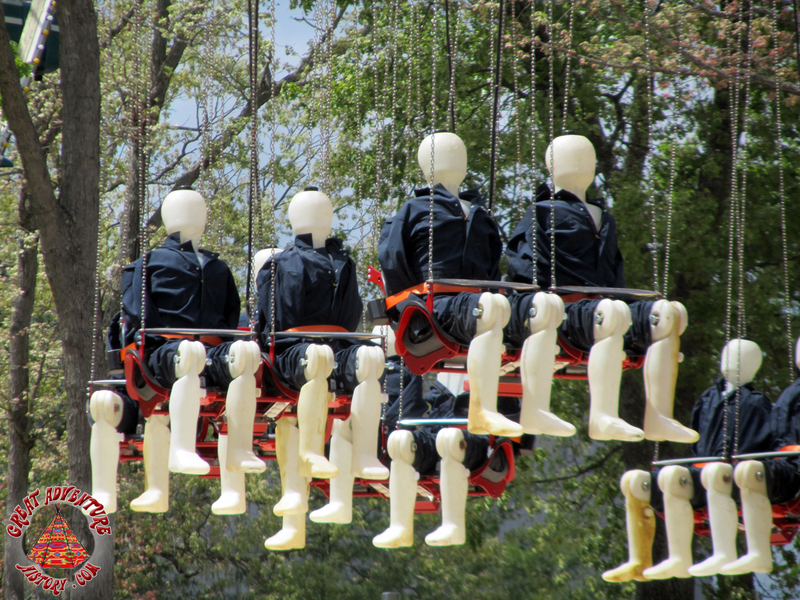 The testing of the ride began the second week of May, and the water filled test dummies spent a great deal of time flying high above the park as workers continued to finish the queue and fencing below. 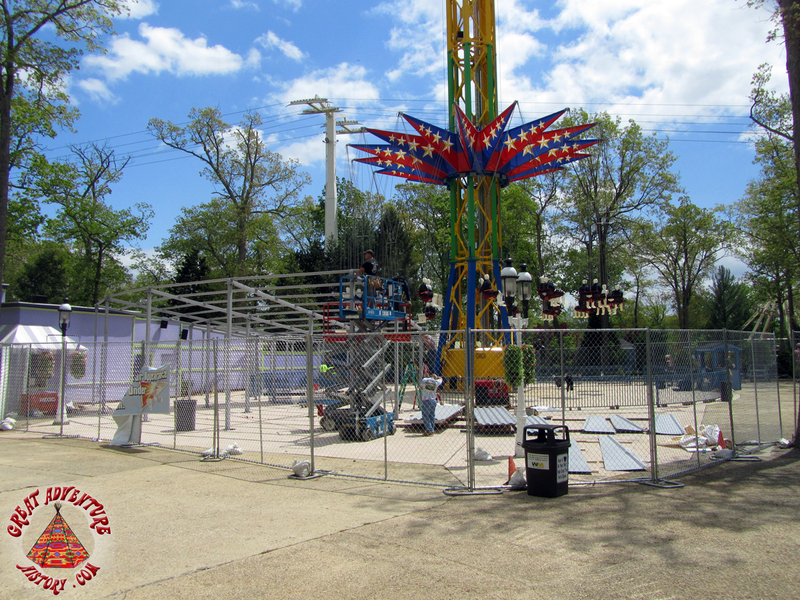 The middle of May saw the ride finally nearing completion. 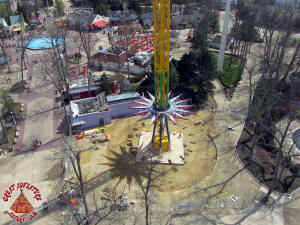 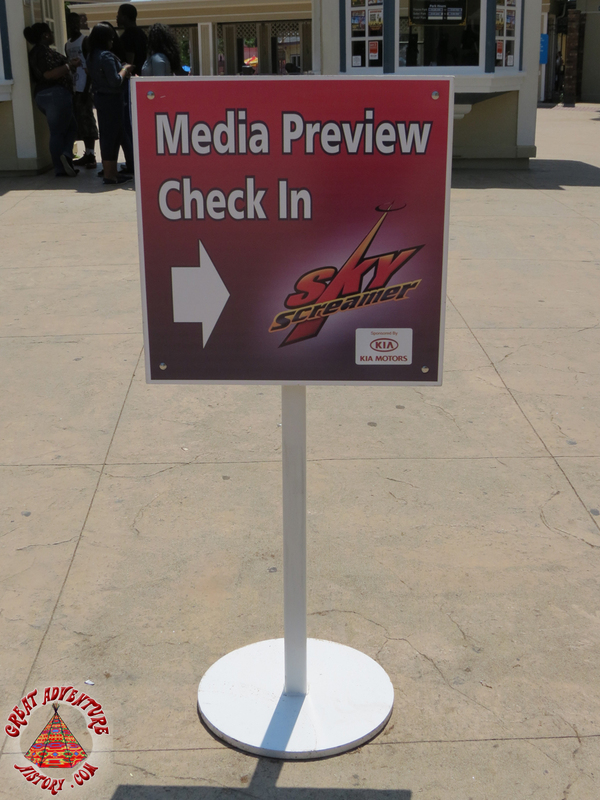 Once everything was ready, the Sky Screamer media day was scheduled for May 17th featuring a unique press event to introduce the new ride. 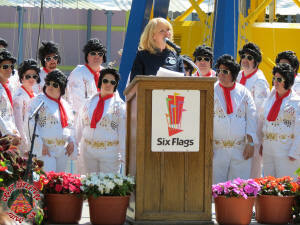 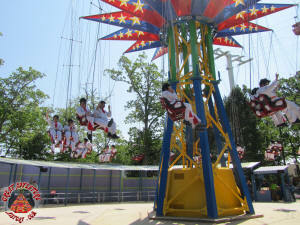 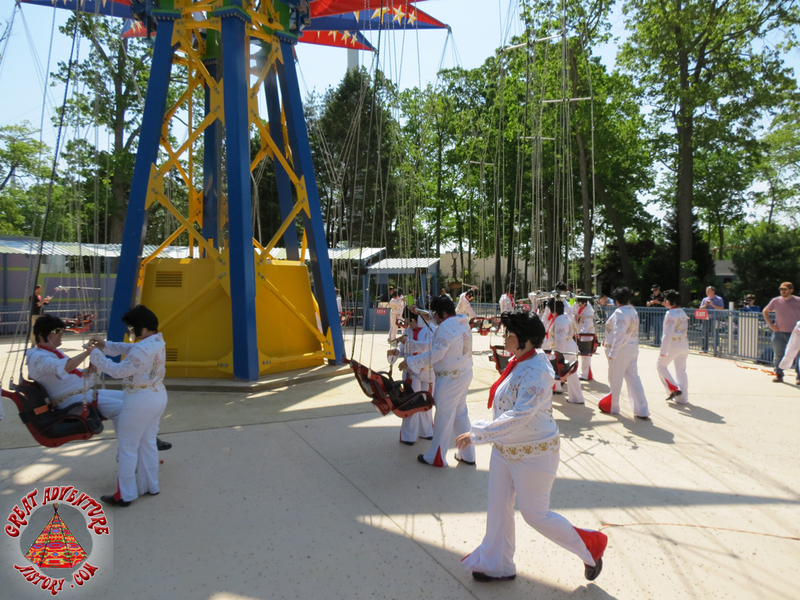 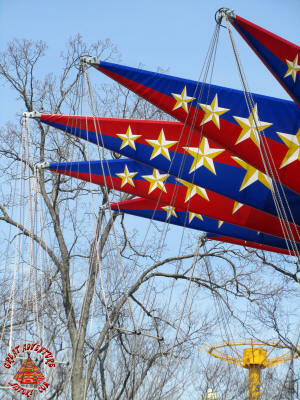 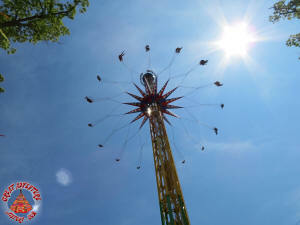 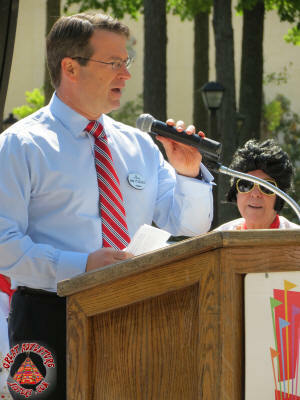 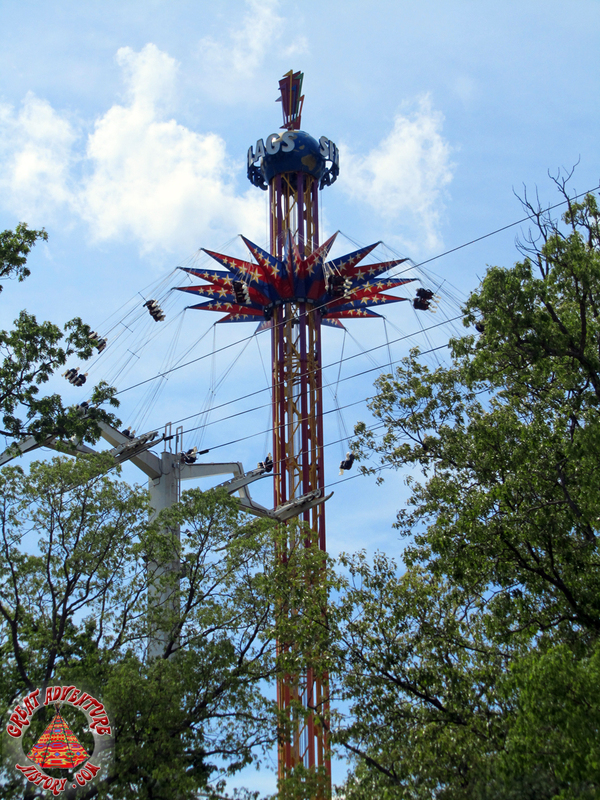 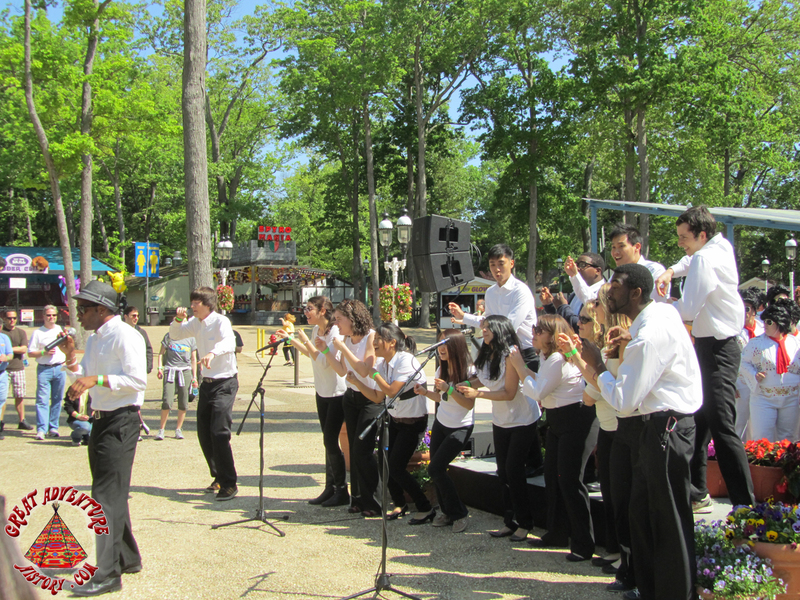 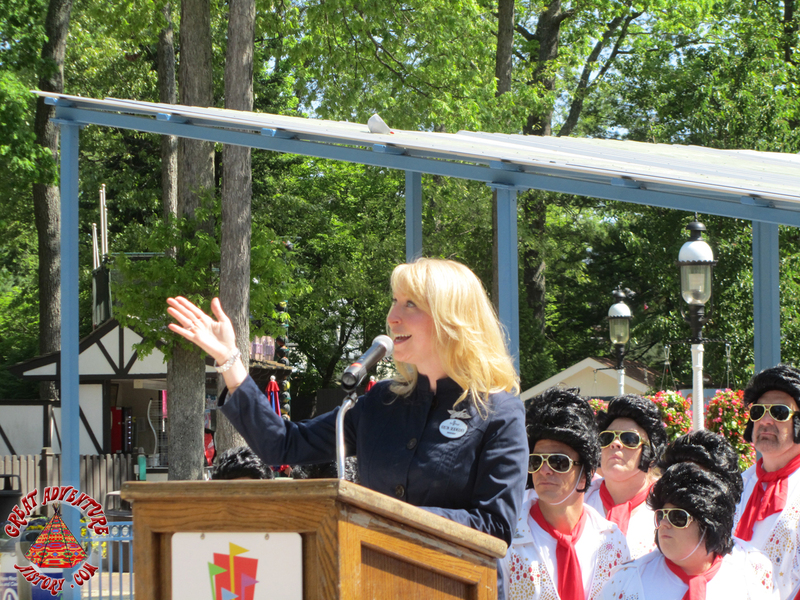 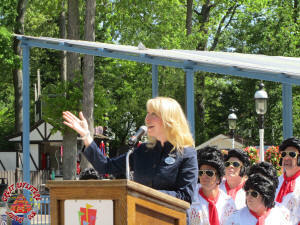 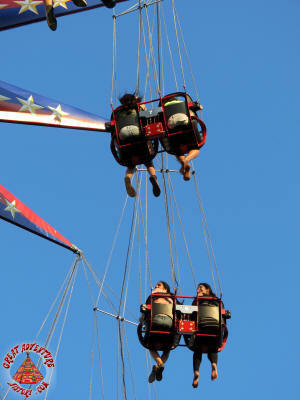 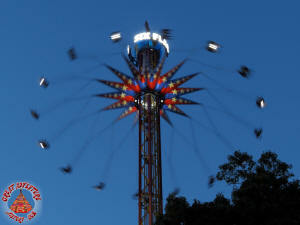 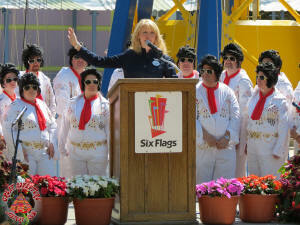 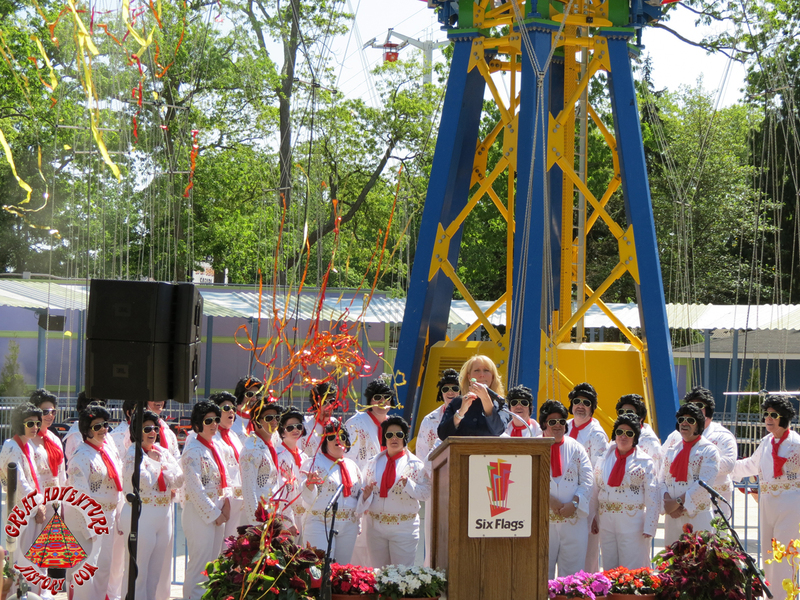 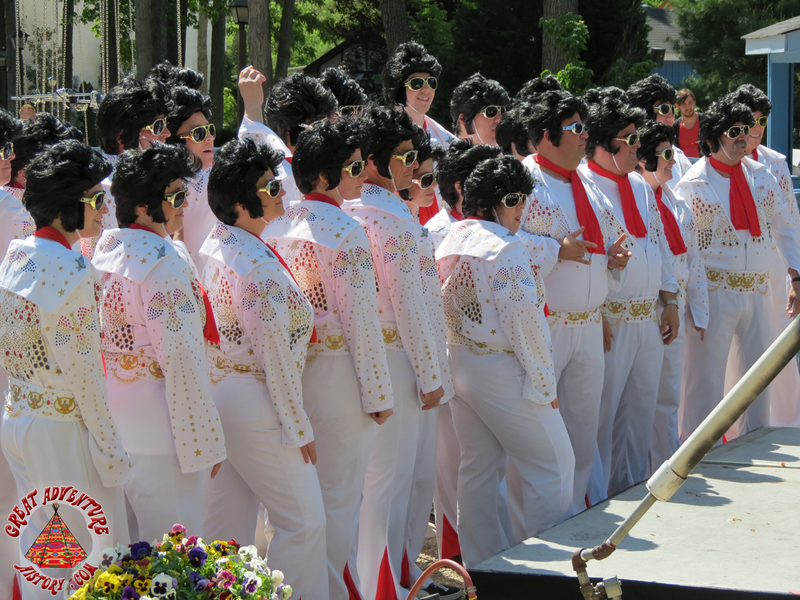 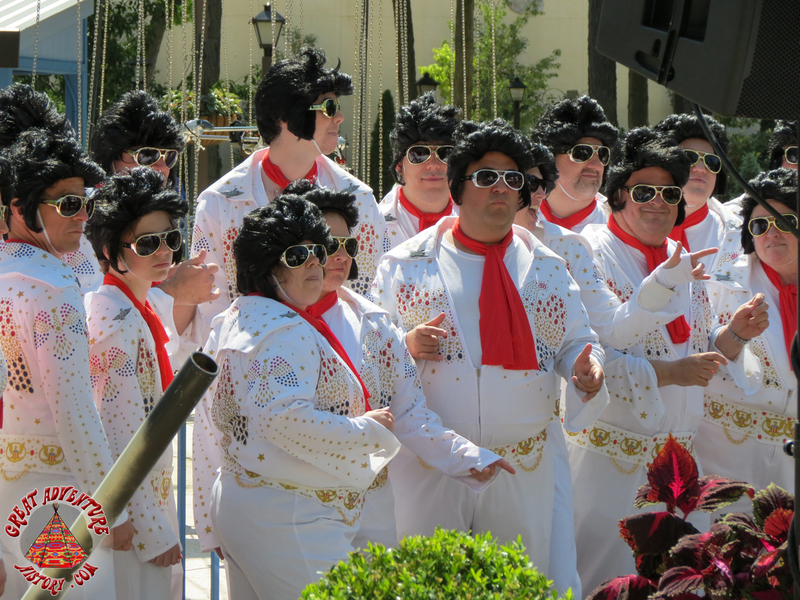 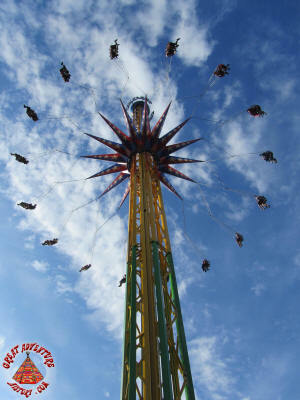 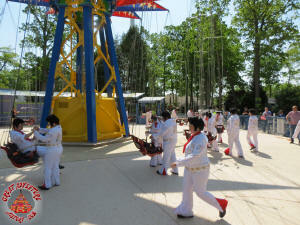 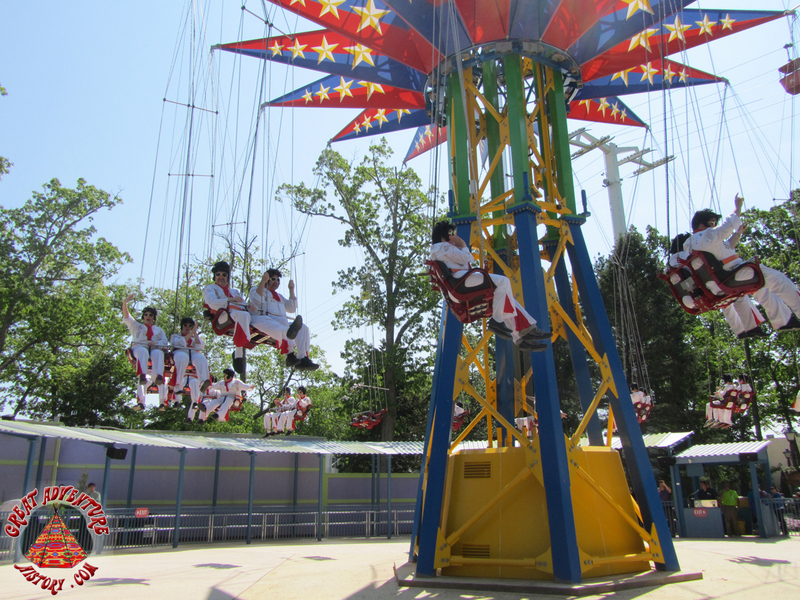 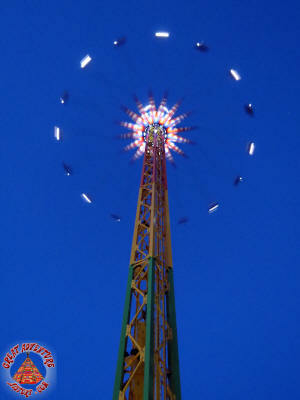 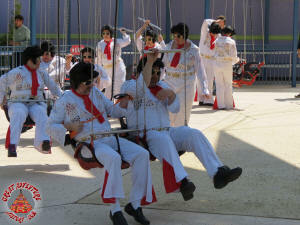 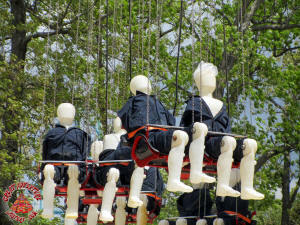 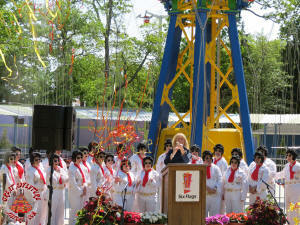 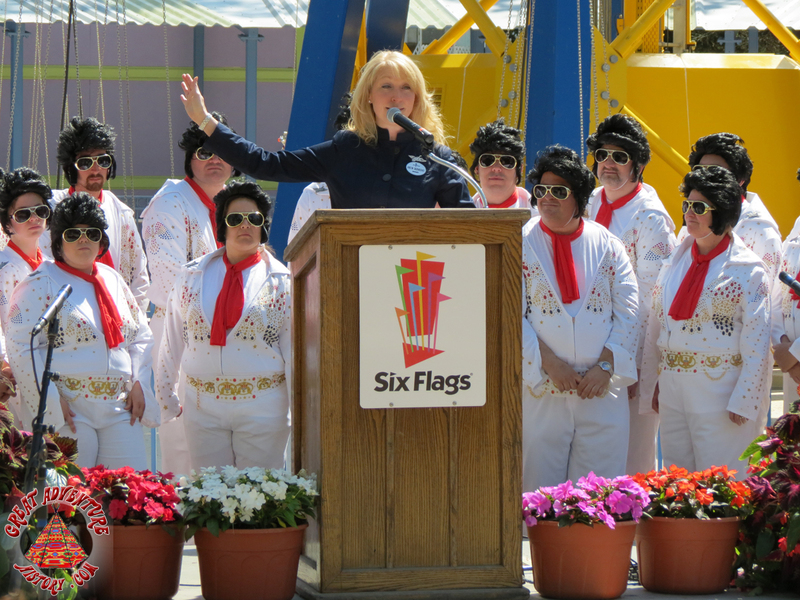 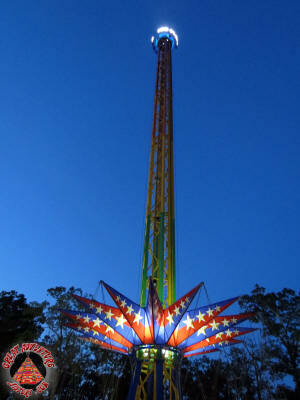 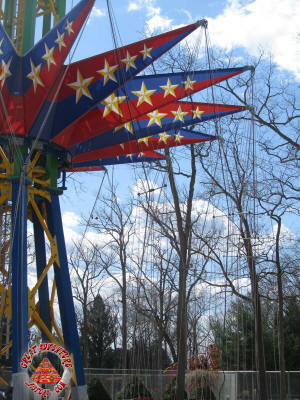 The Sky Screamer was launched with a few dozen "Flying Elvises" taking to the sky high above the treetops. 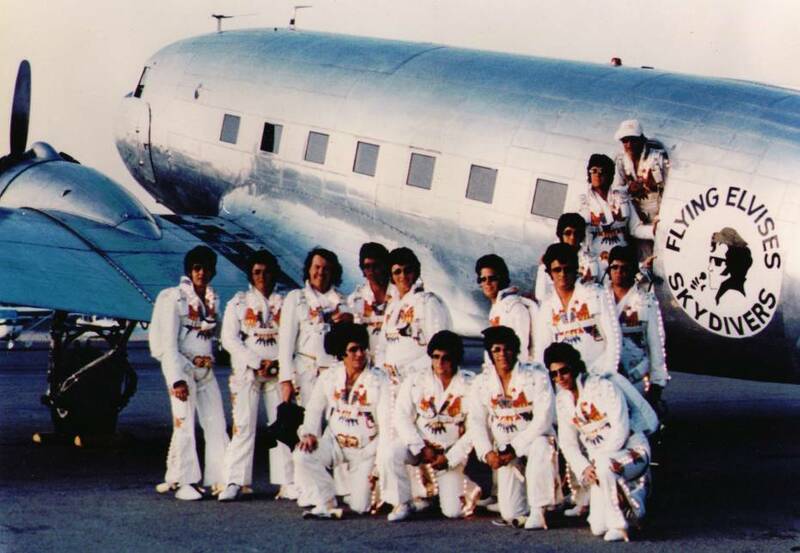 The Elvises took wing wearing matching white jumpsuits just like the official Elvis Presley skydiving team. 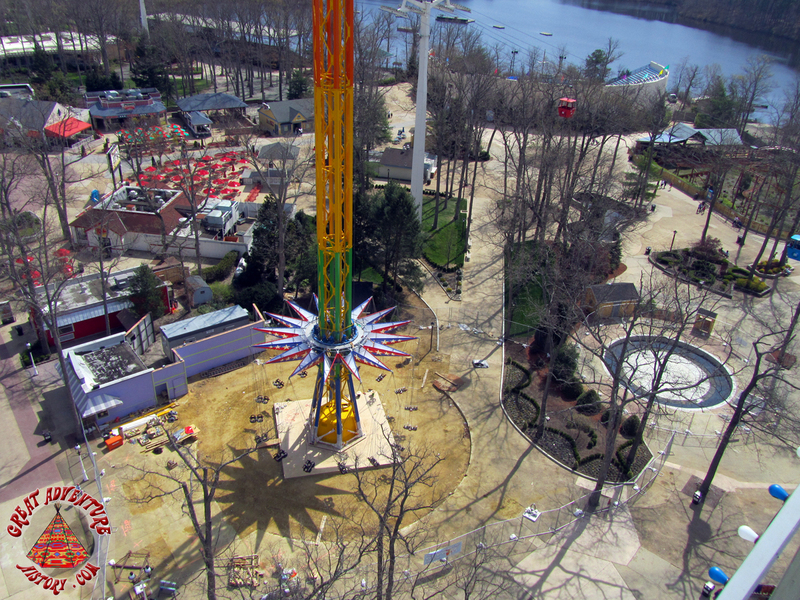 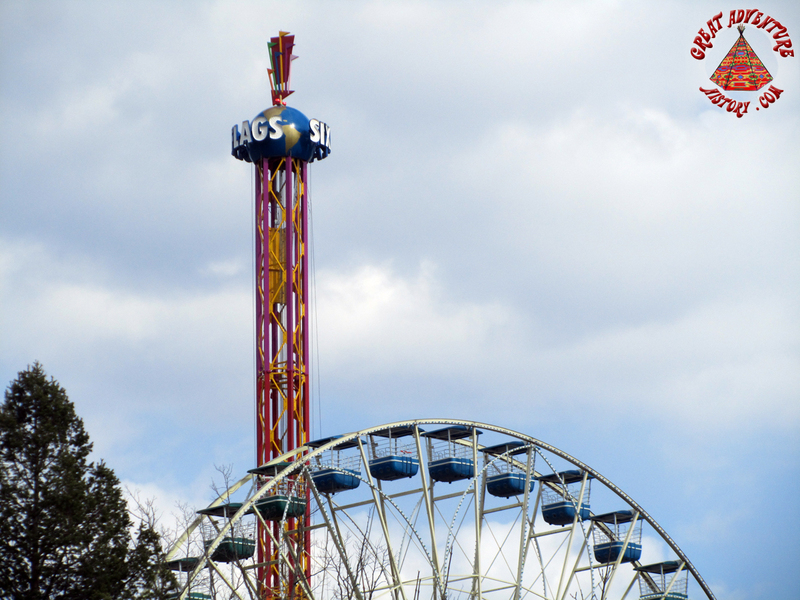 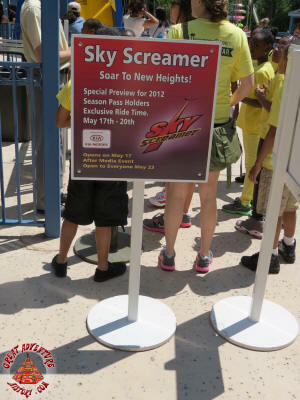 With the entertaining opening ceremonies concluded, Sky Screamer was available for a special season passholder preview period. 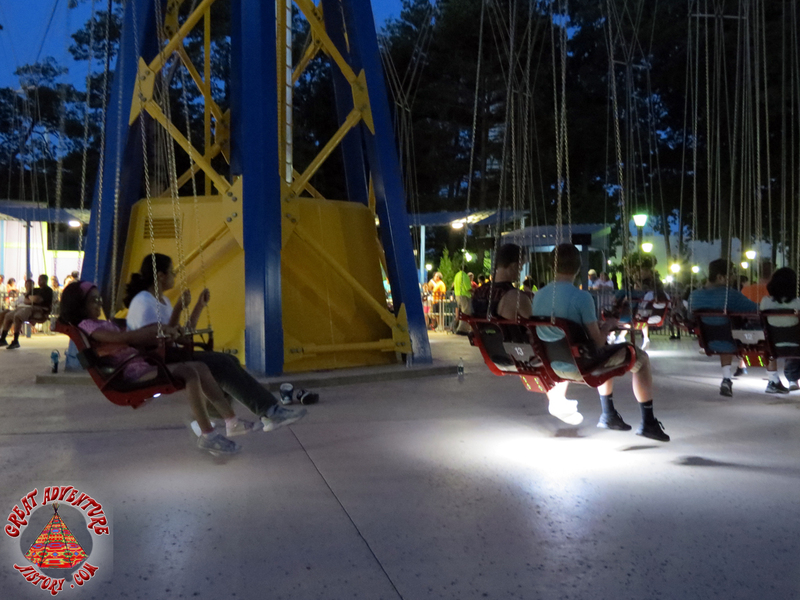 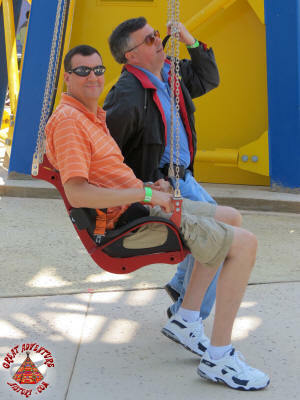 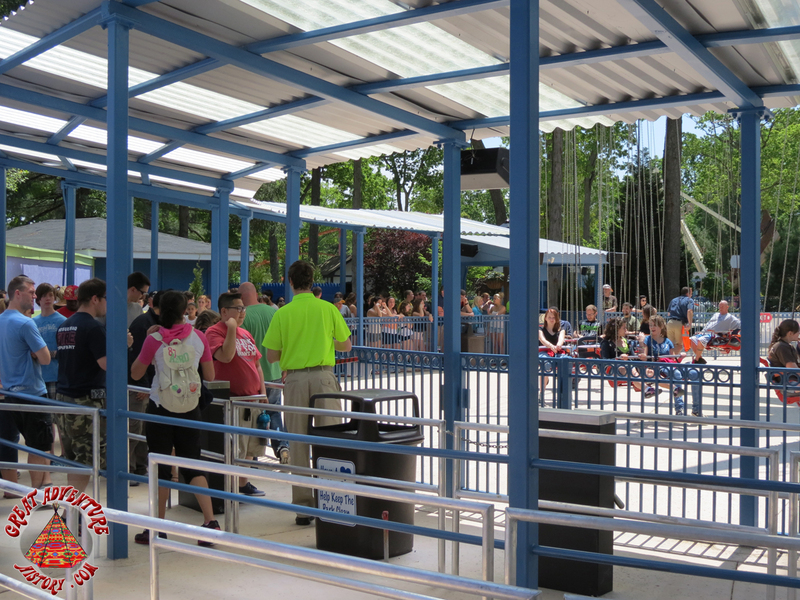 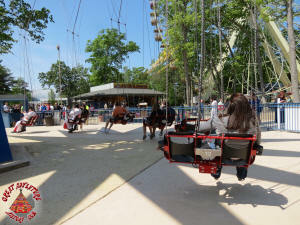 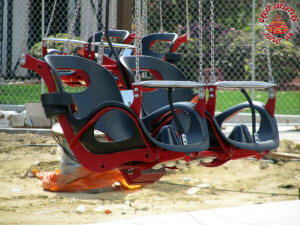 During the first several days of operation passholders got to try the new ride before the general public. 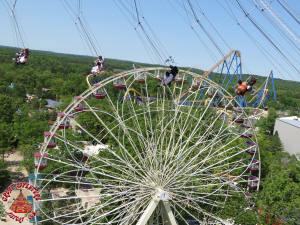 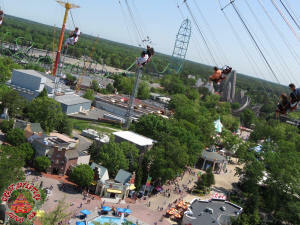 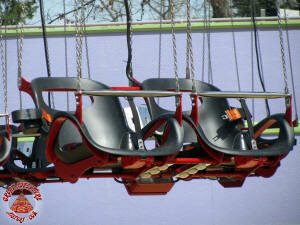 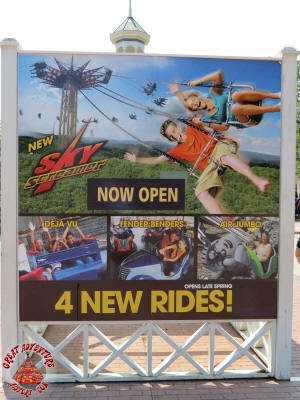 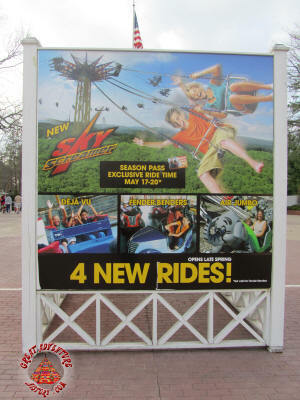 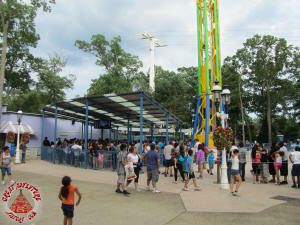 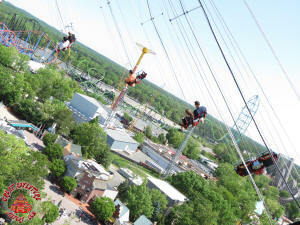 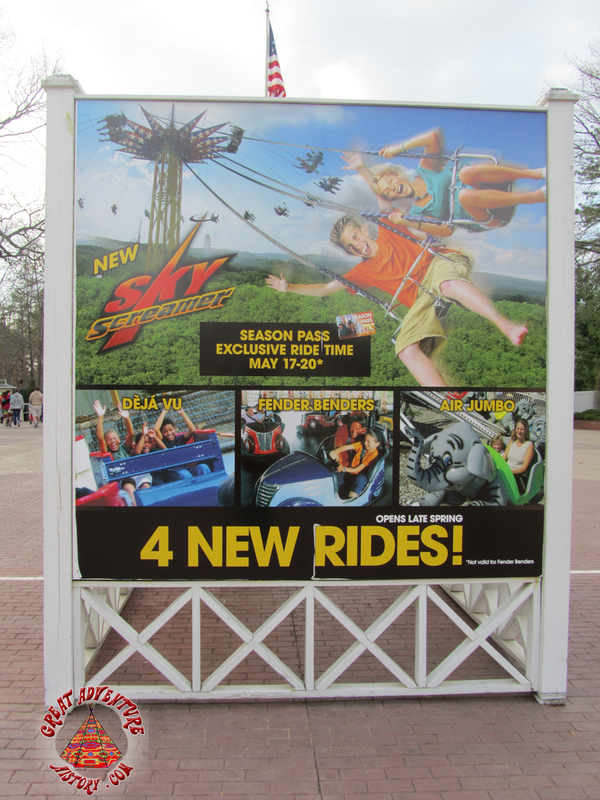 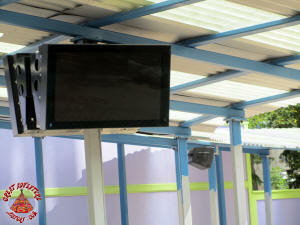 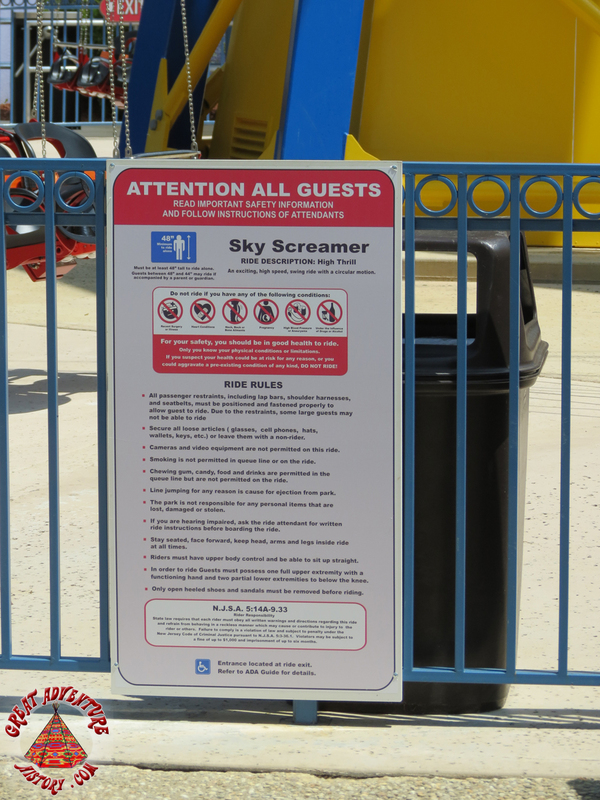 Ticketed guests were encouraged to upgrade to a season pass and experience the SkyScreamer. 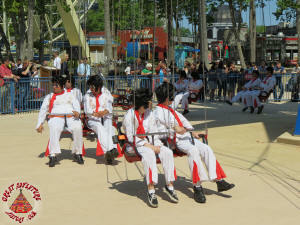 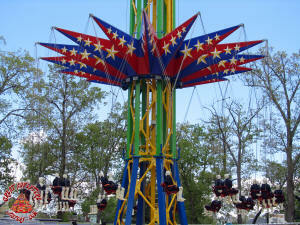 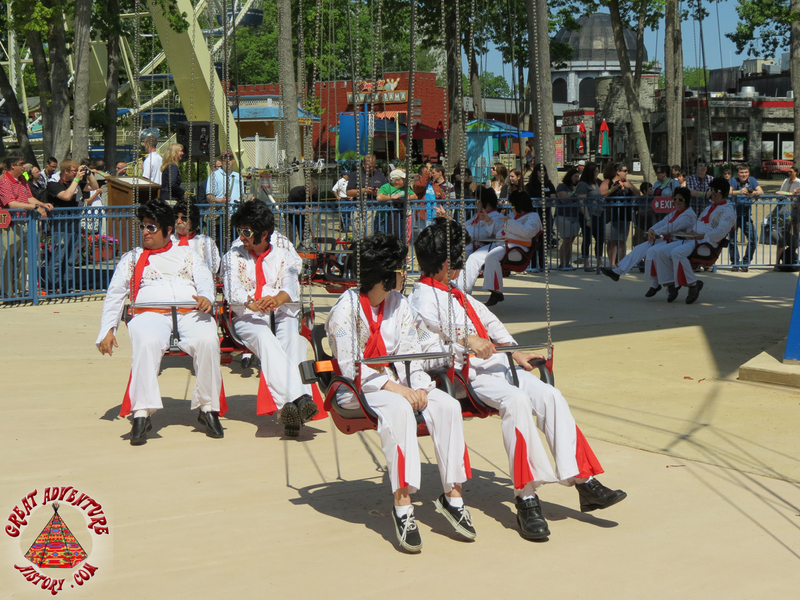 the Flying Elvises riding SkyScreamer. of view video riding SkyScreamer. 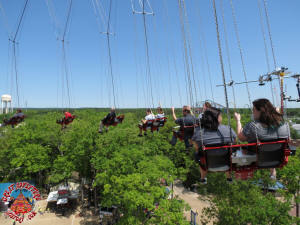 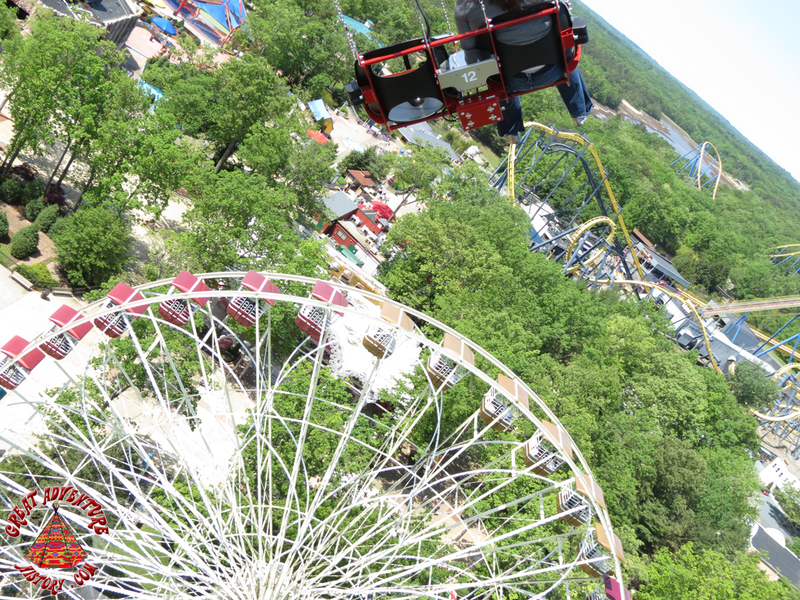 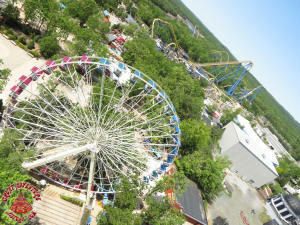 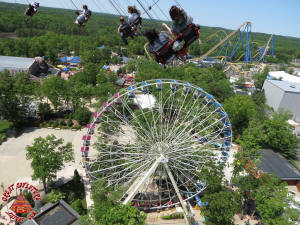 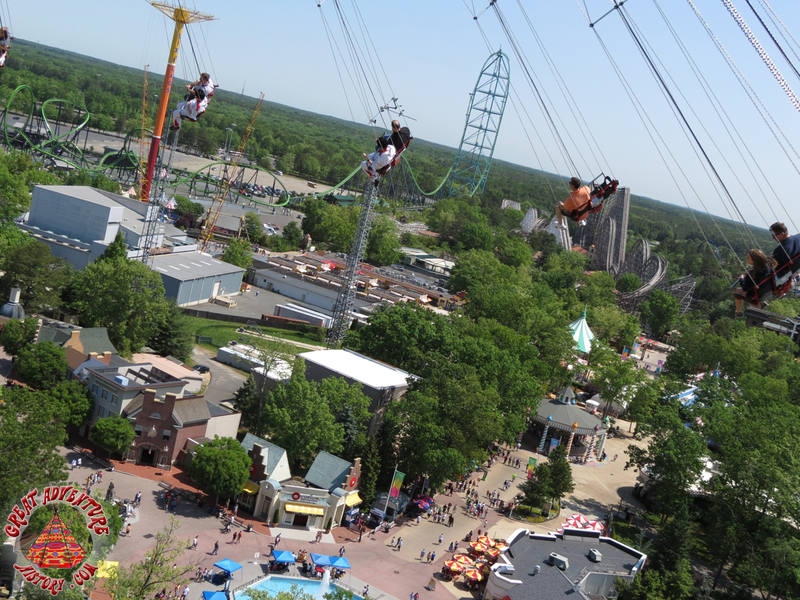 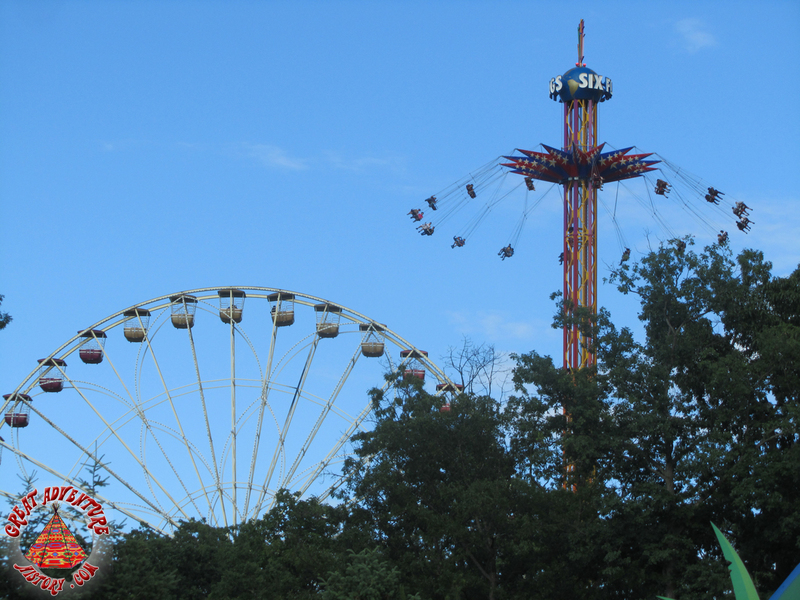 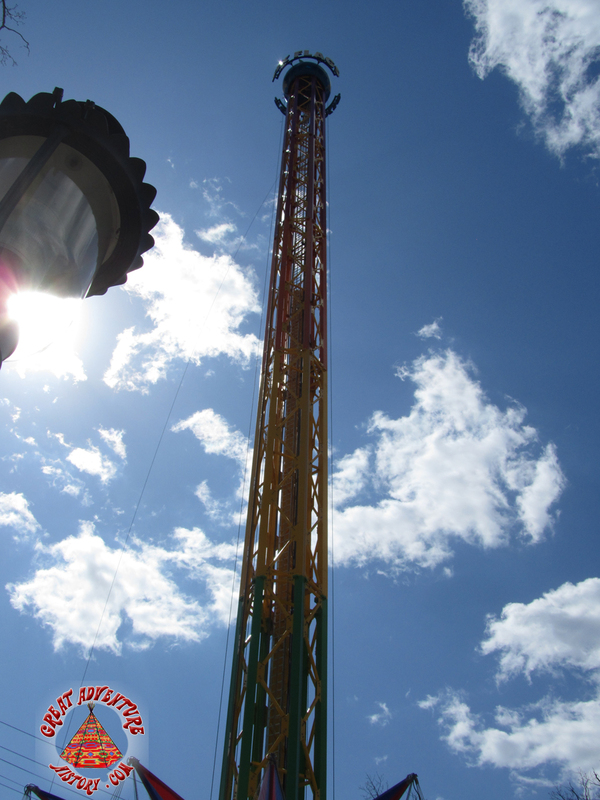 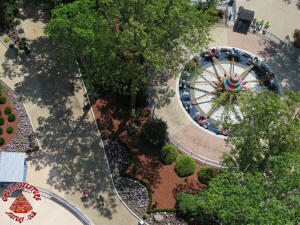 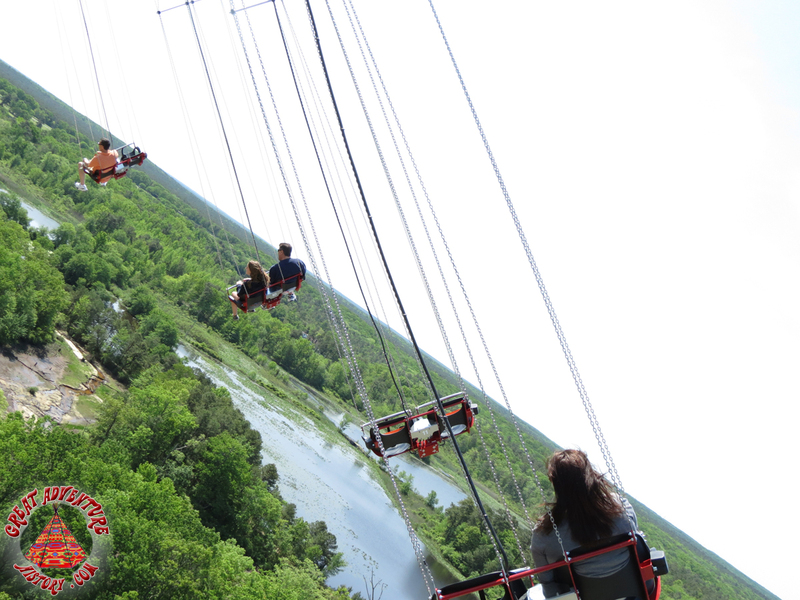 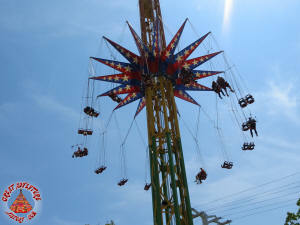 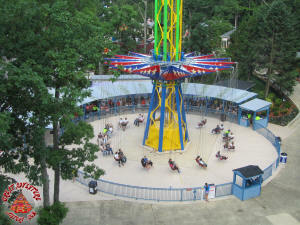 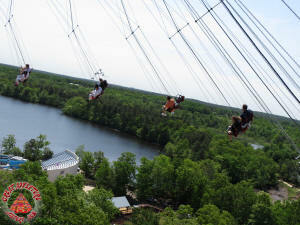 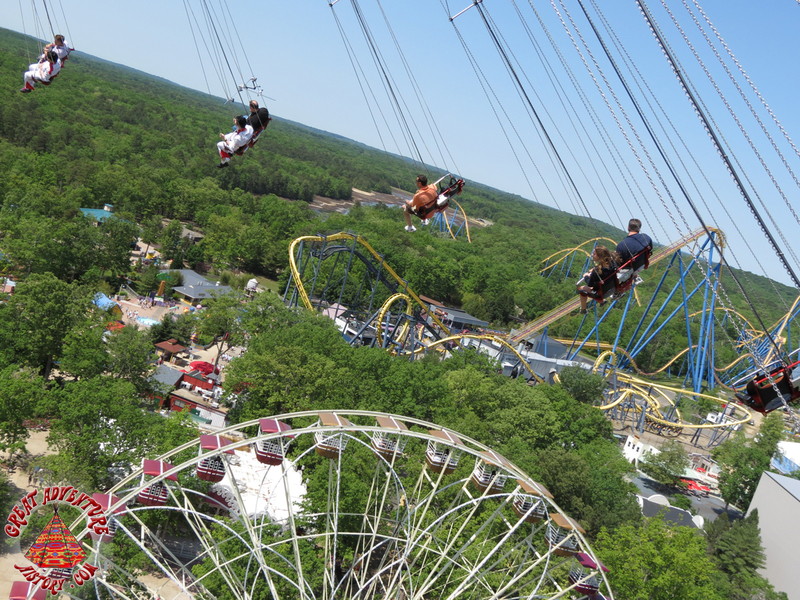 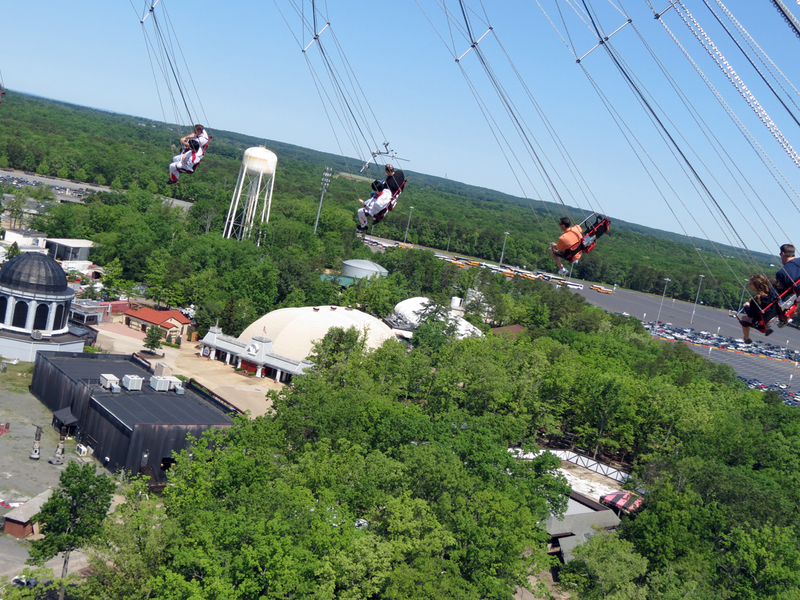 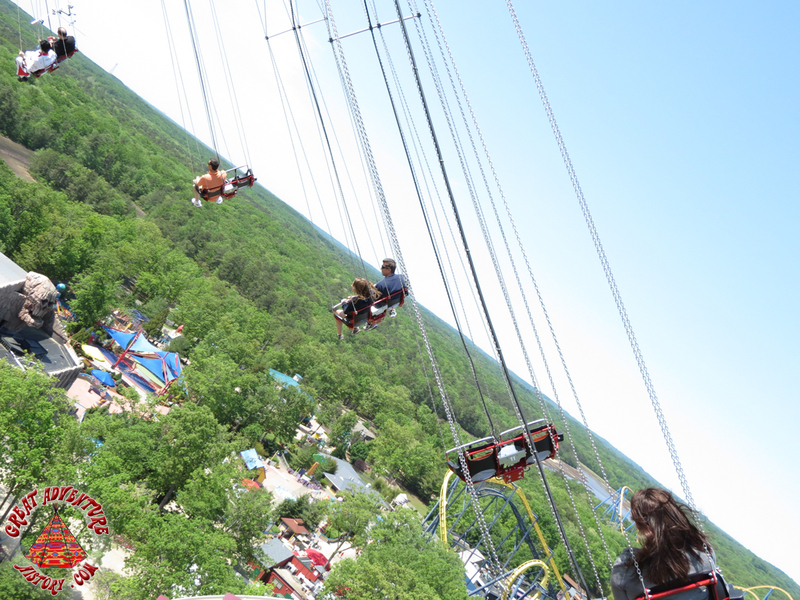 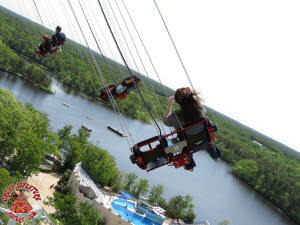 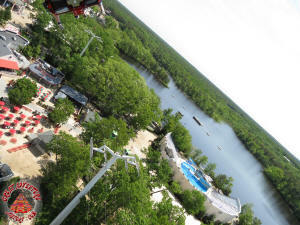 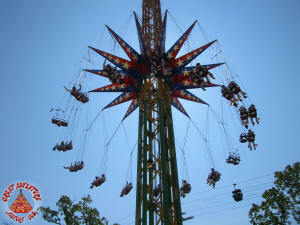 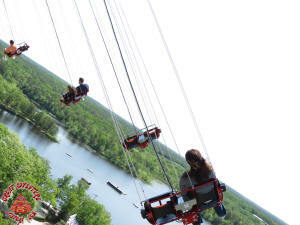 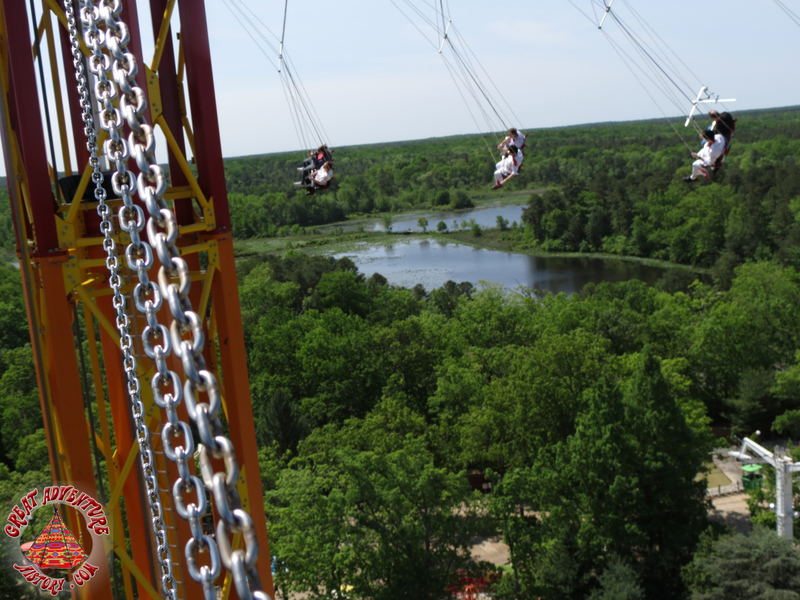 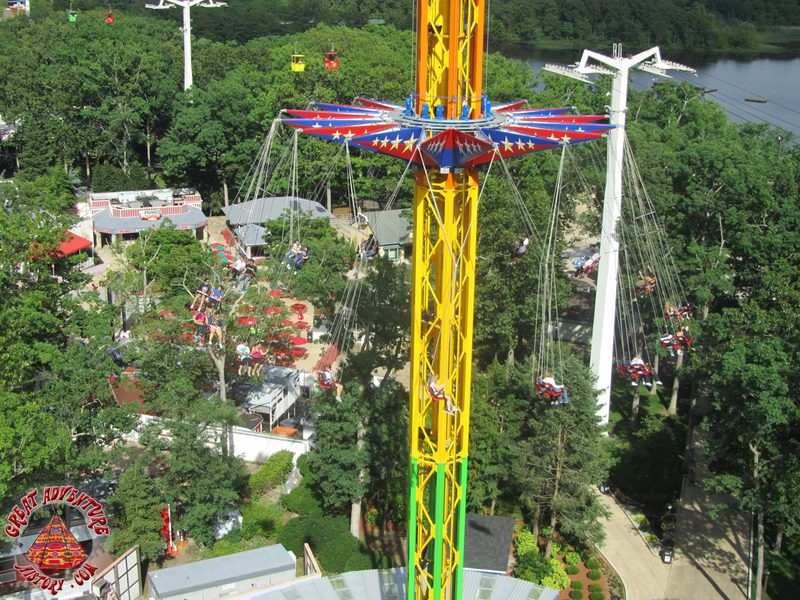 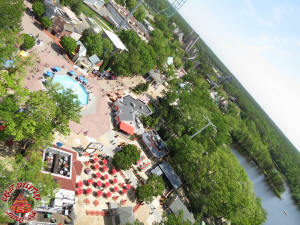 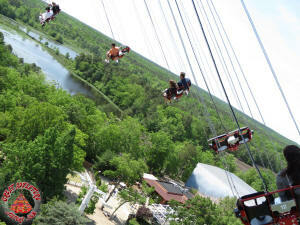 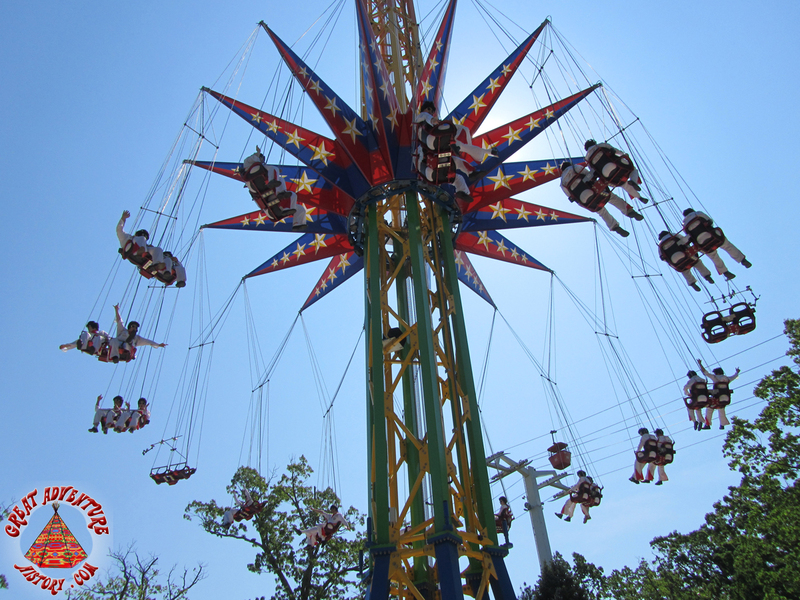 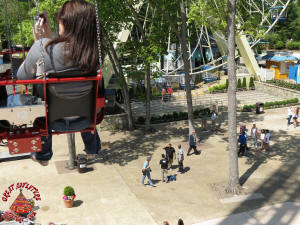 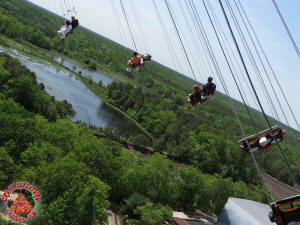 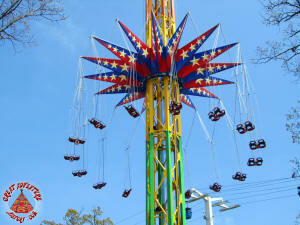 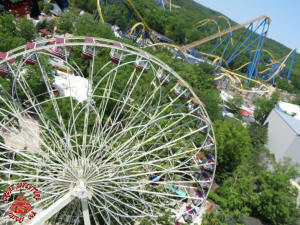 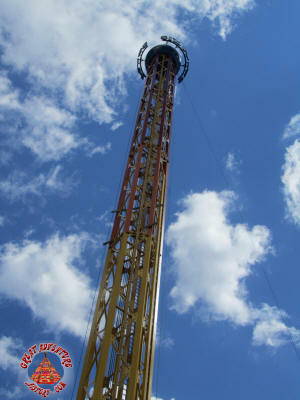 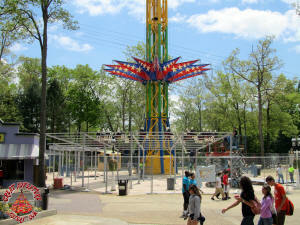 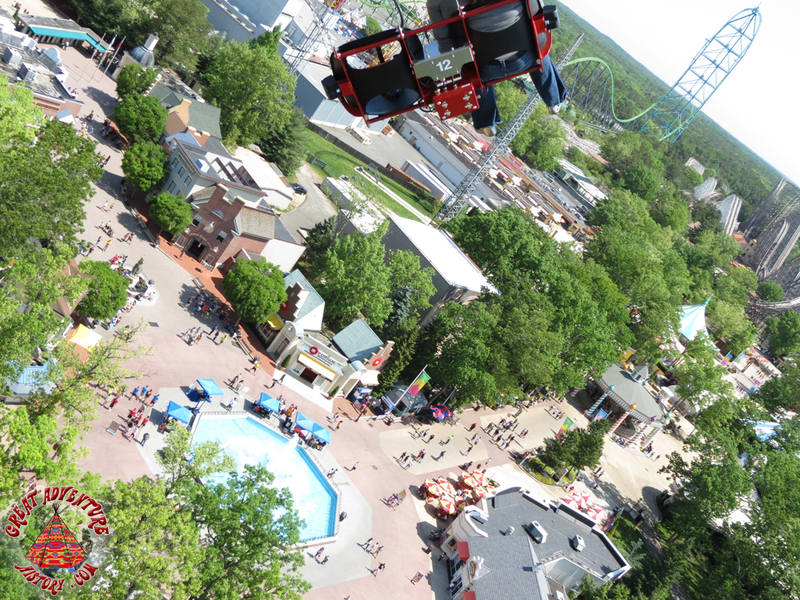 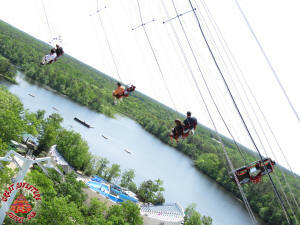 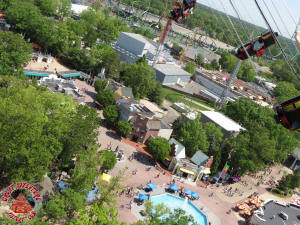 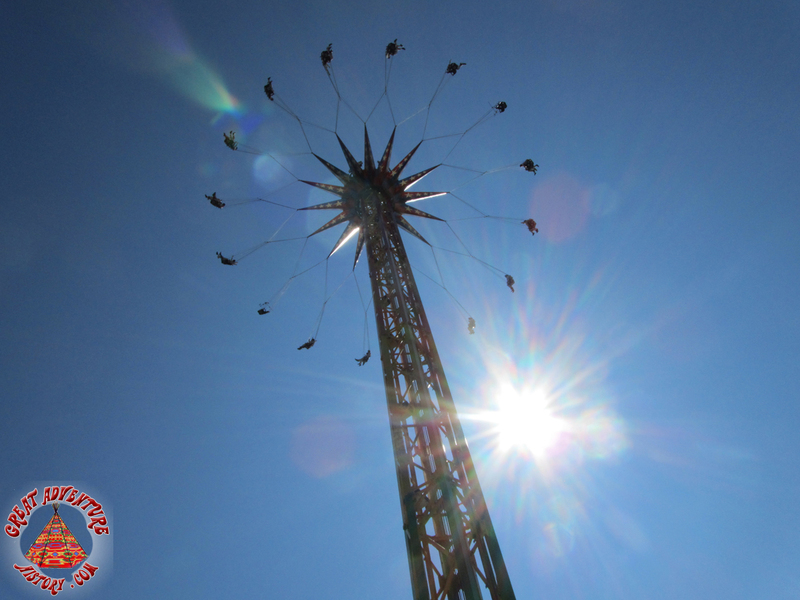 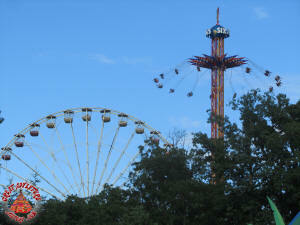 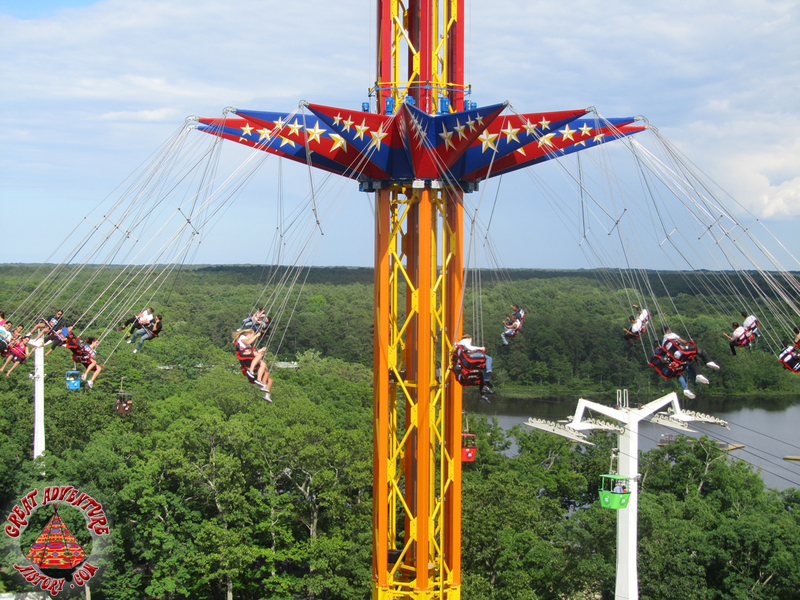 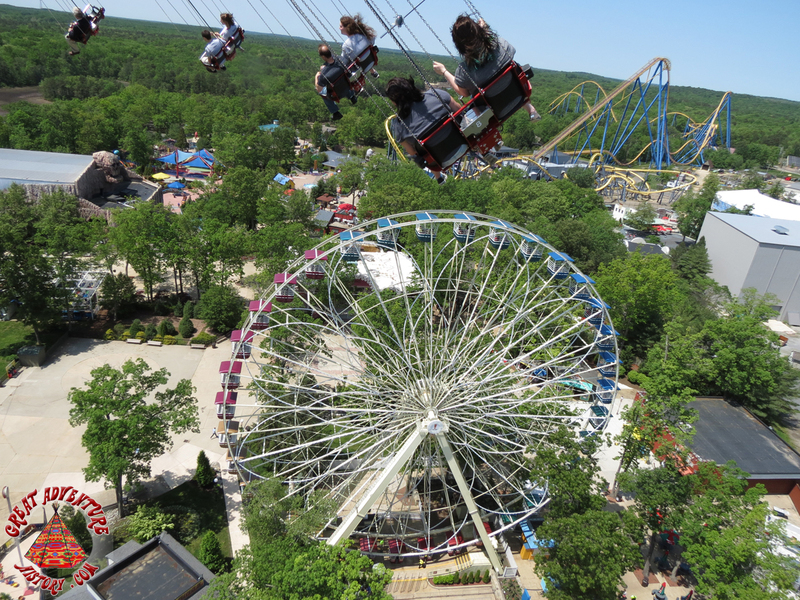 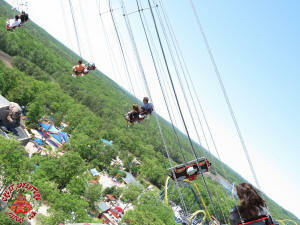 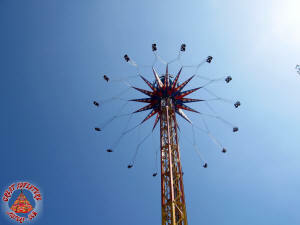 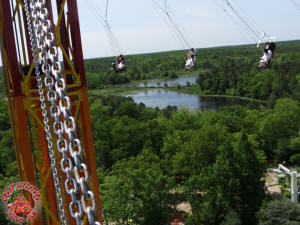 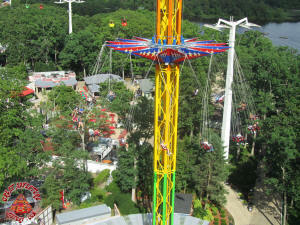 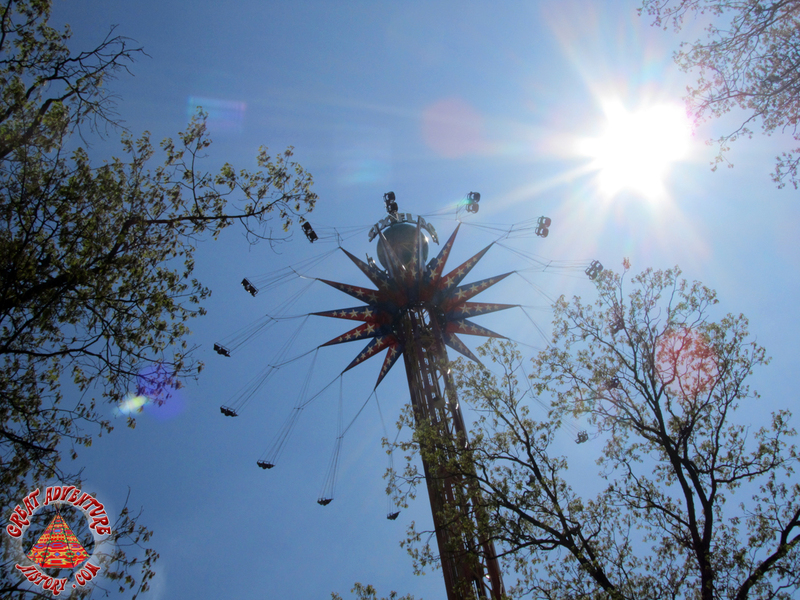 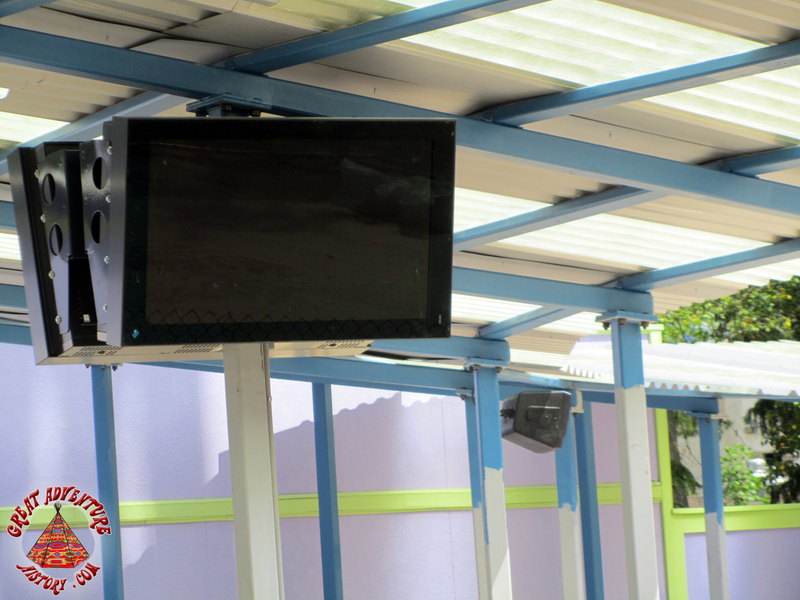 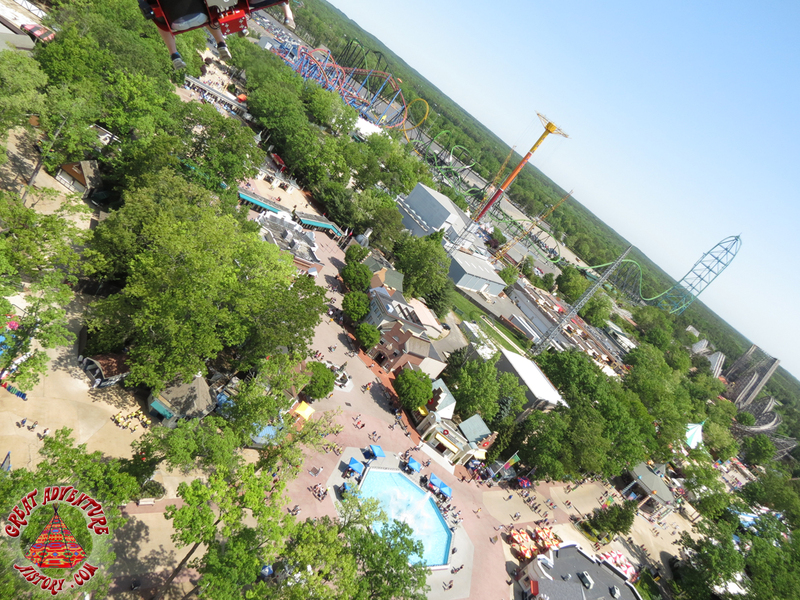 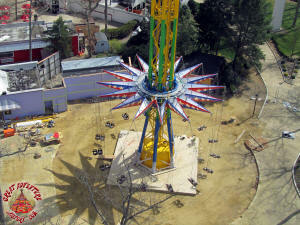 The Sky Screamer offered incredible new views of the park and the surrounding area. 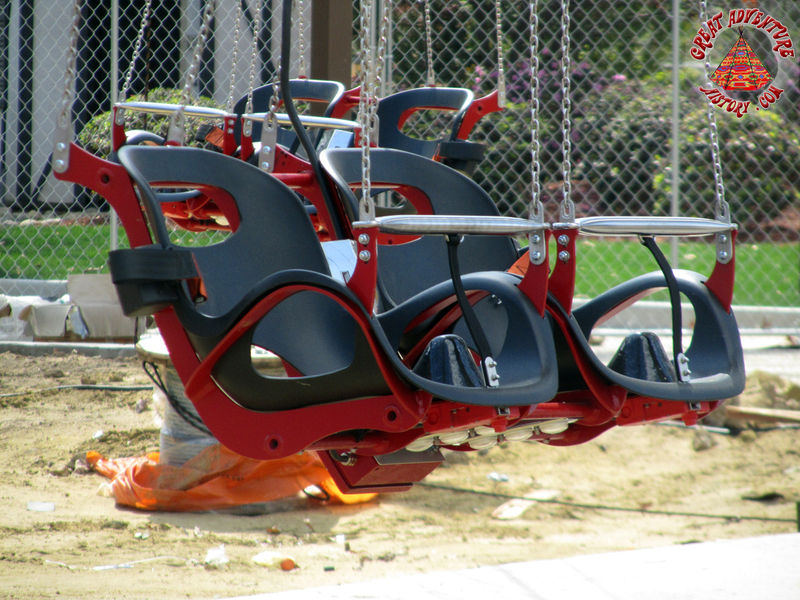 The sensation of flying was incredible, with slender chains holding the minimal seats, creating a real sense of freedom and excitement. 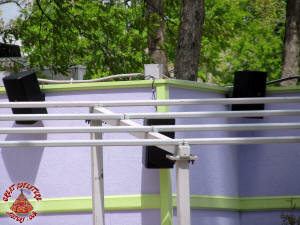 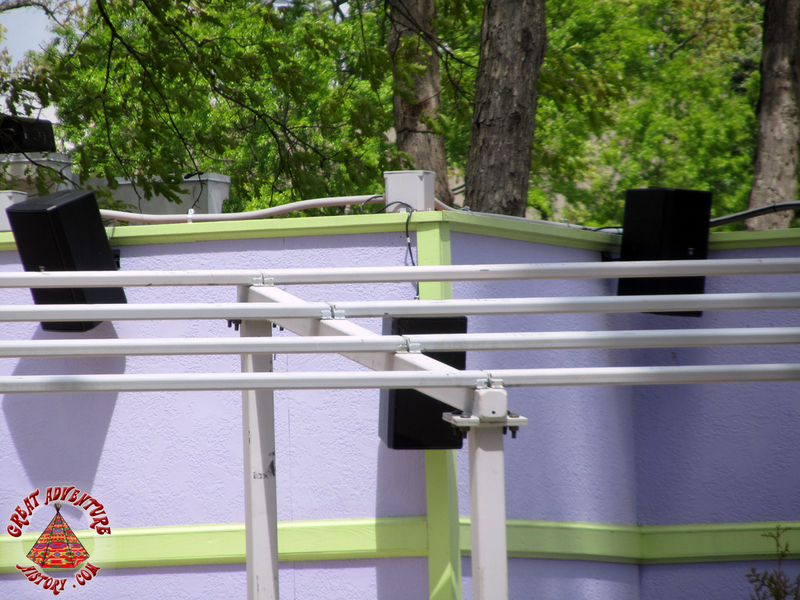 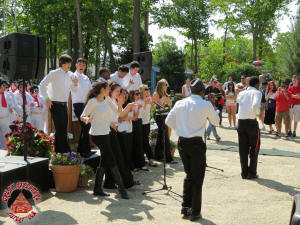 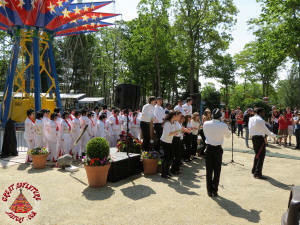 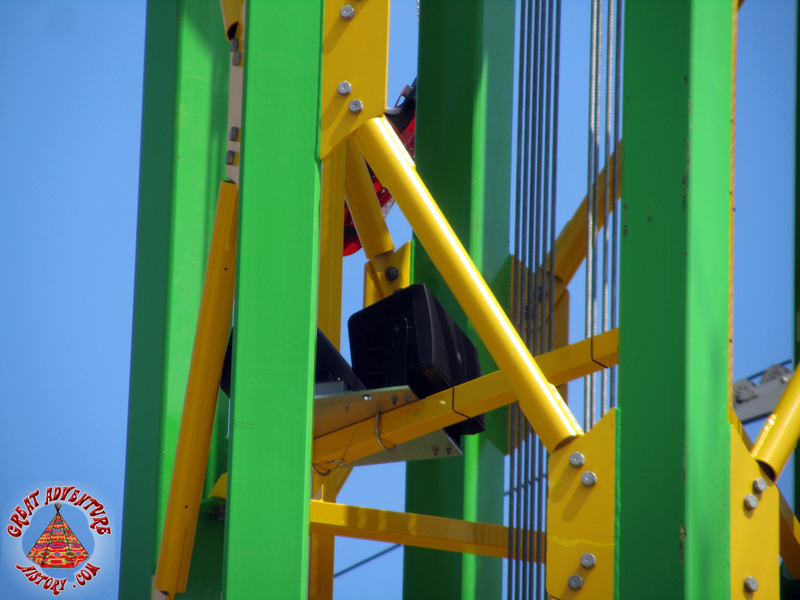 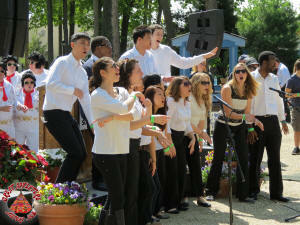 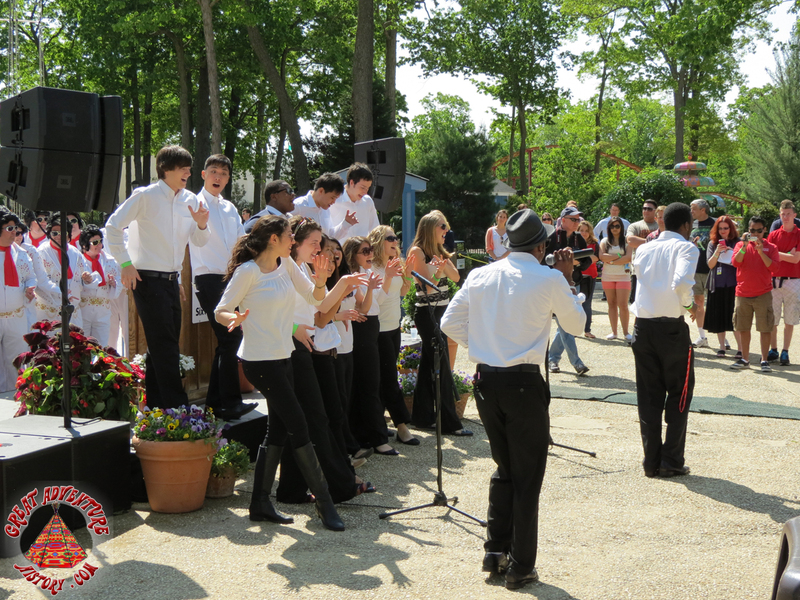 An extensive sound system with speakers located all around the base of the ride as well as situated within the ride's tower provided a soundtrack which matched the programming of the ride experience. 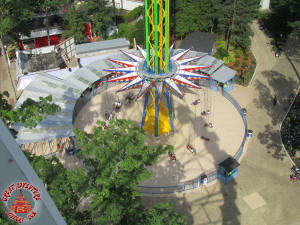 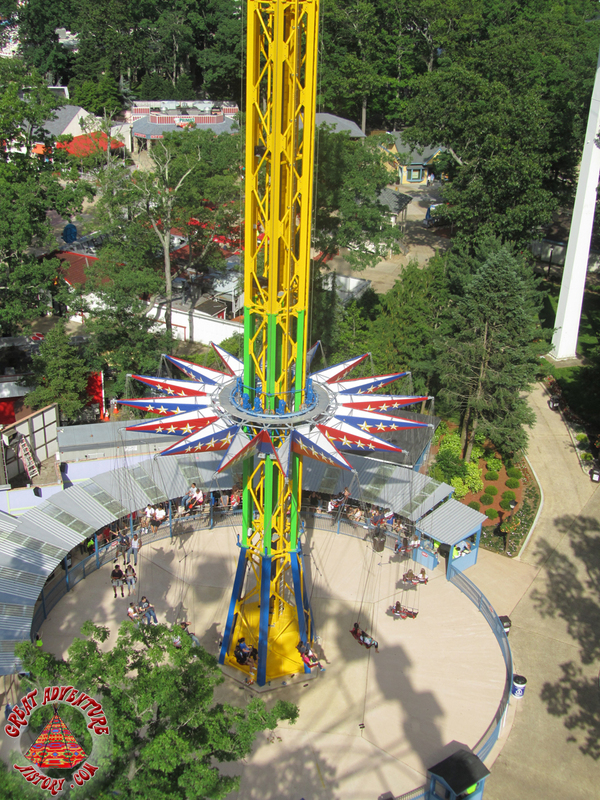 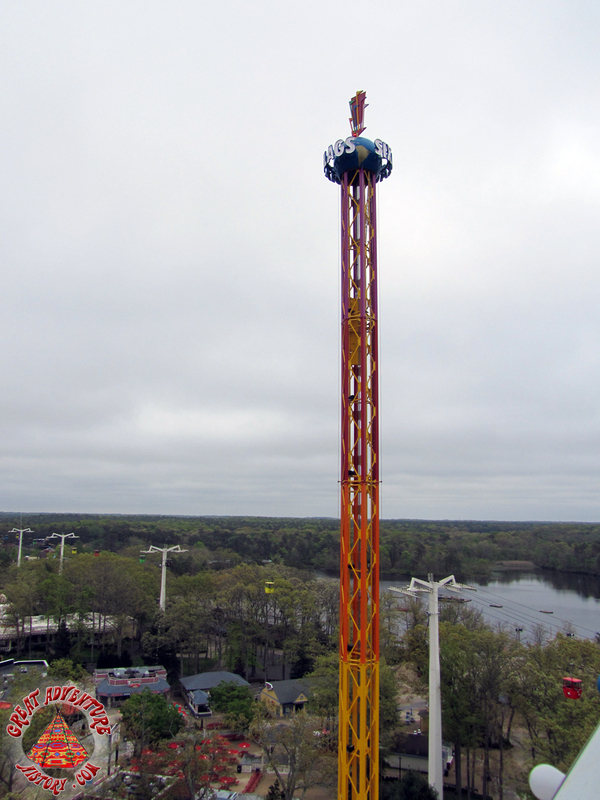 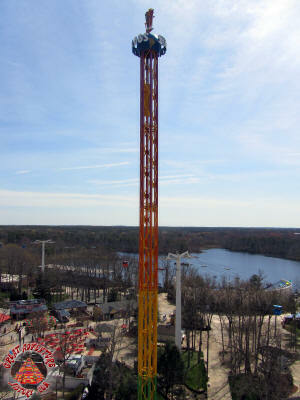 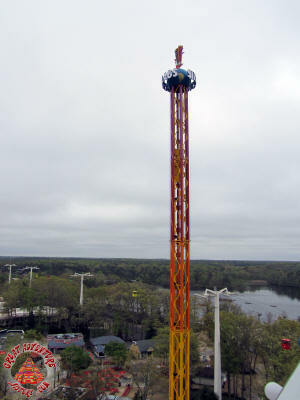 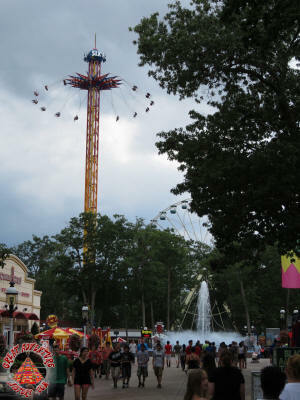 Though not the tallest ride in the park, the Sky Screamer offered some of the best views due to its central location as well as the prolonged time rides spend at the top. 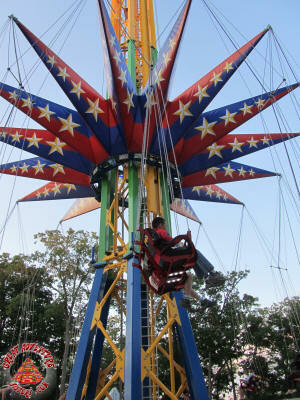 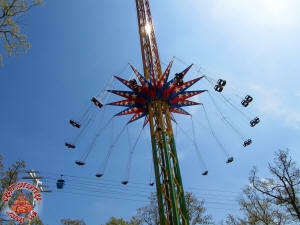 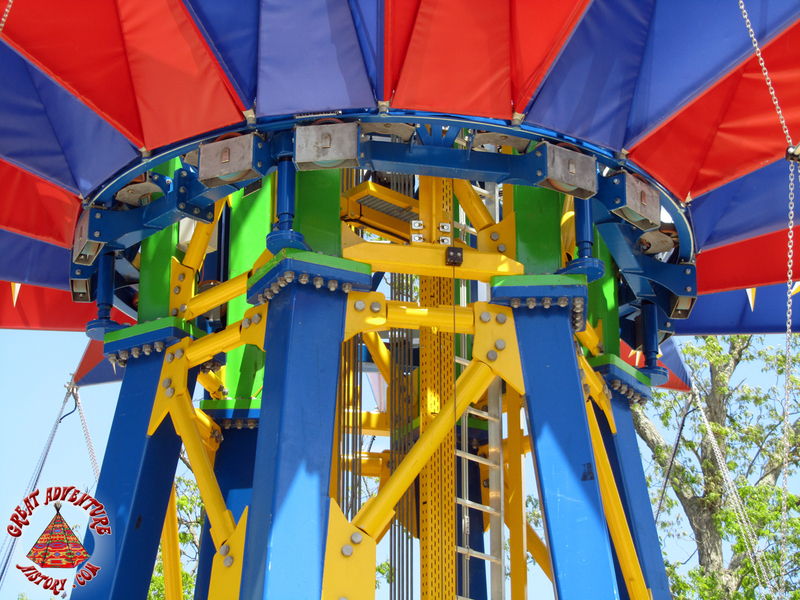 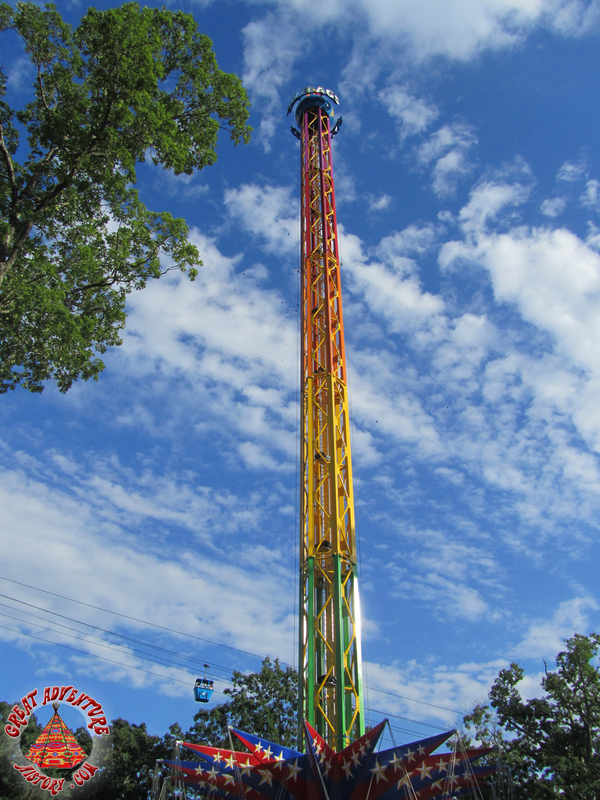 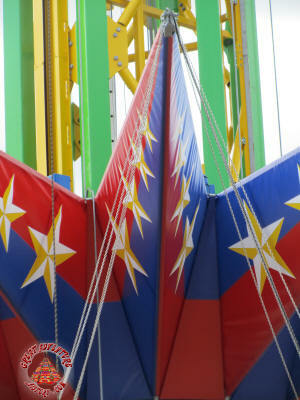 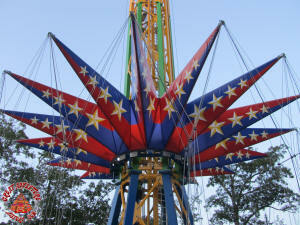 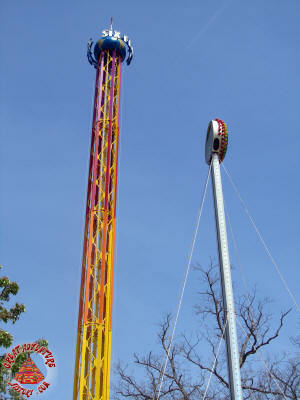 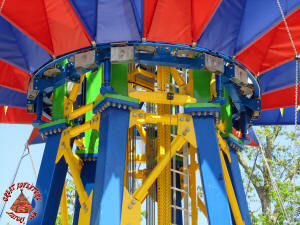 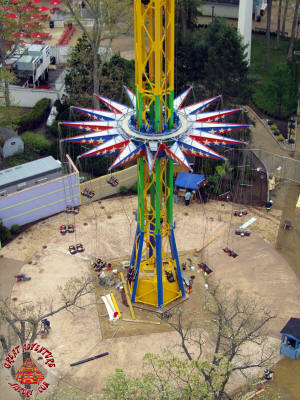 The colorful Sky Screamer had quickly become one of the park's most iconic rides. 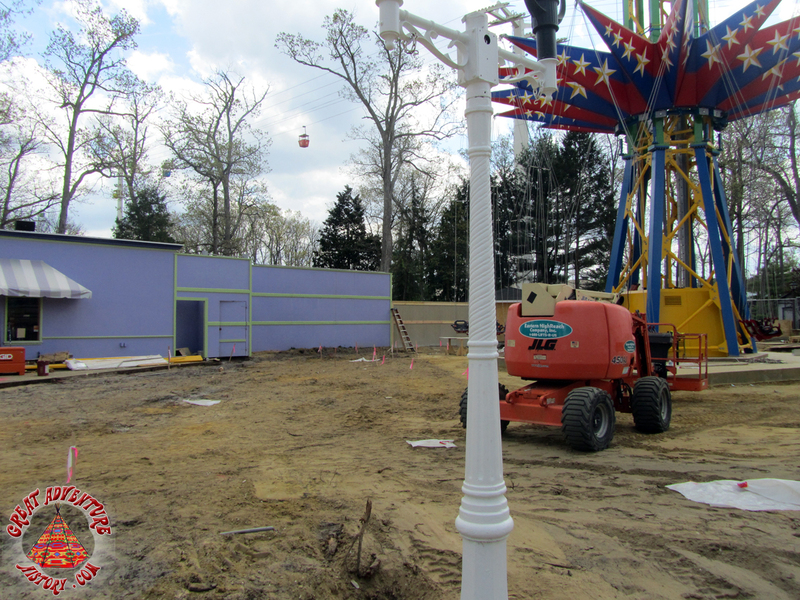 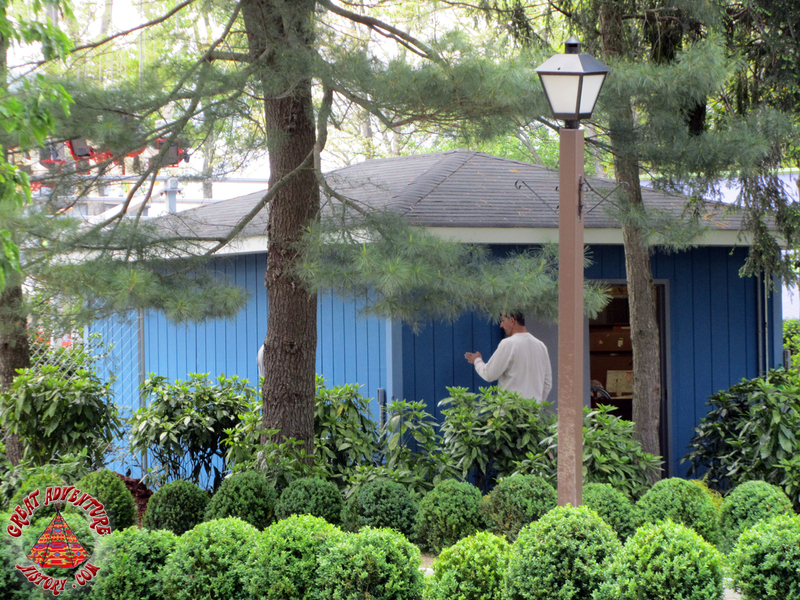 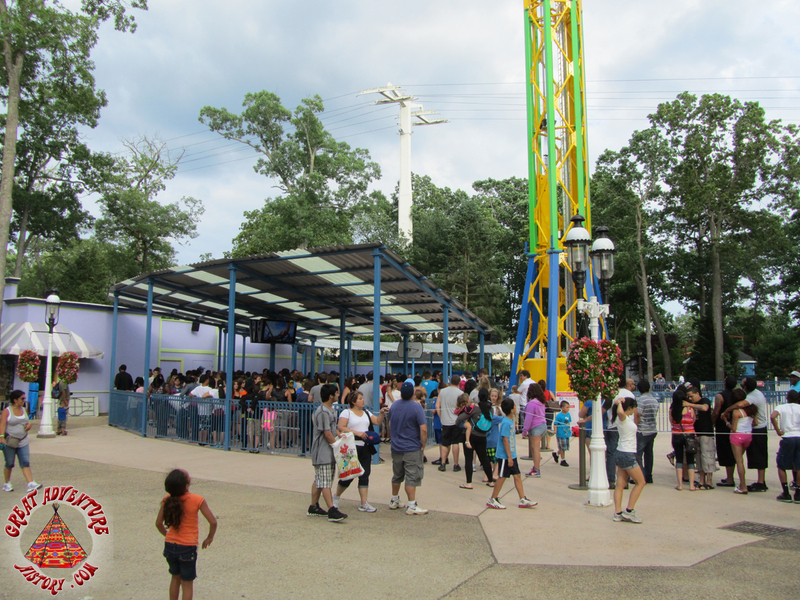 The bright colors and massive height brought new life to a once sleepy area of the park. 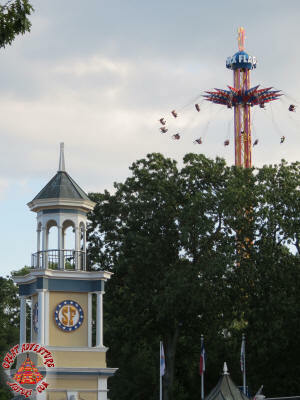 The attraction was as fun for spectators as for riders, with the ability to run several programs and creating exciting unexpected run sequences. 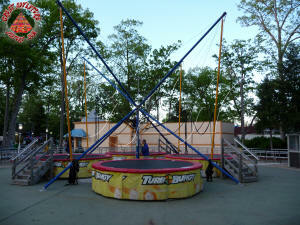 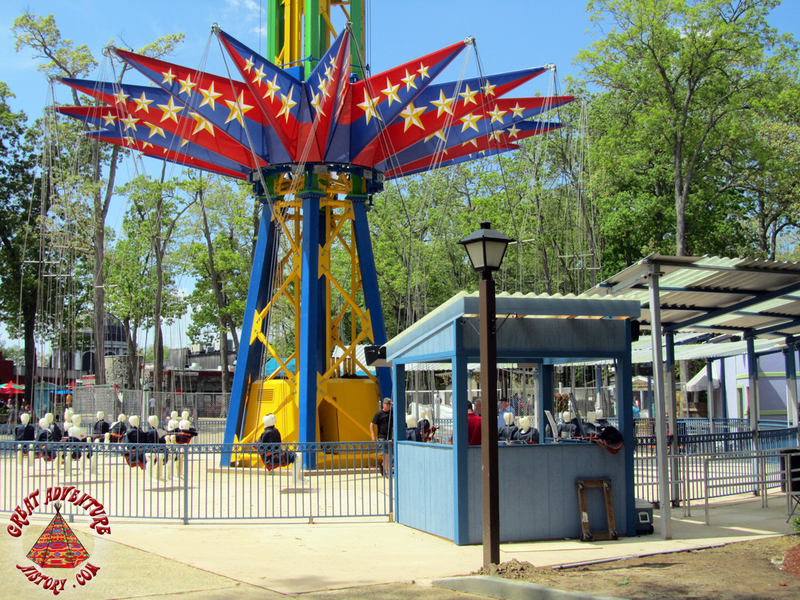 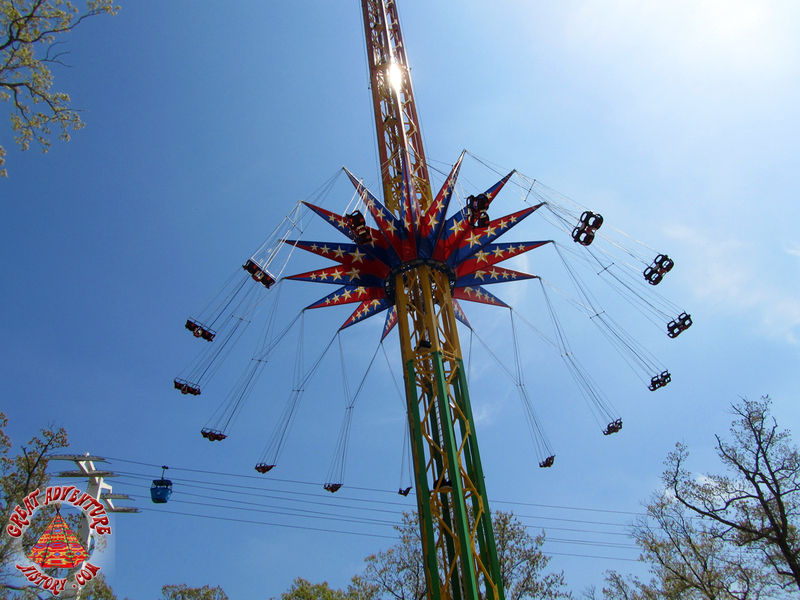 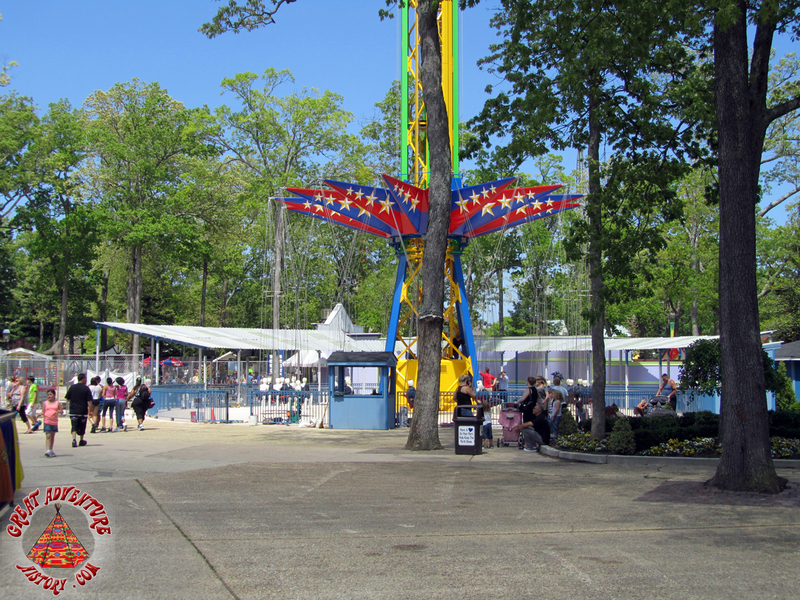 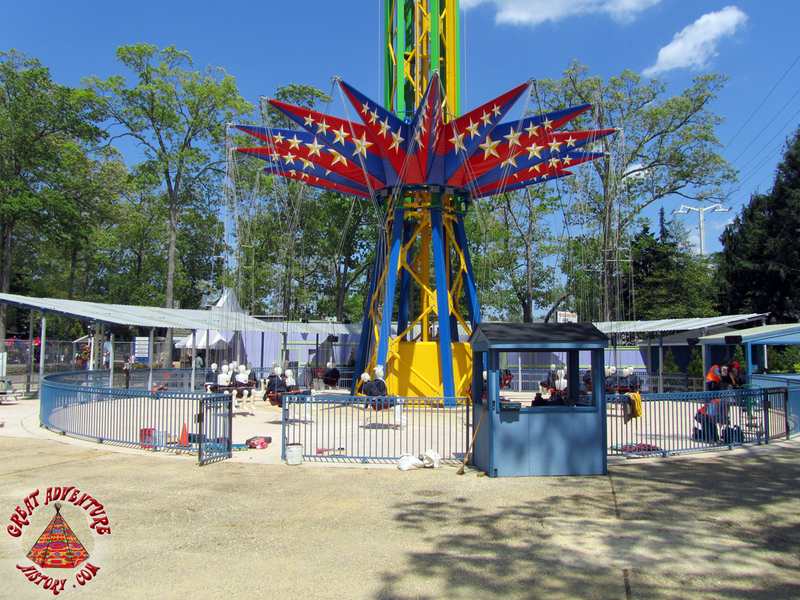 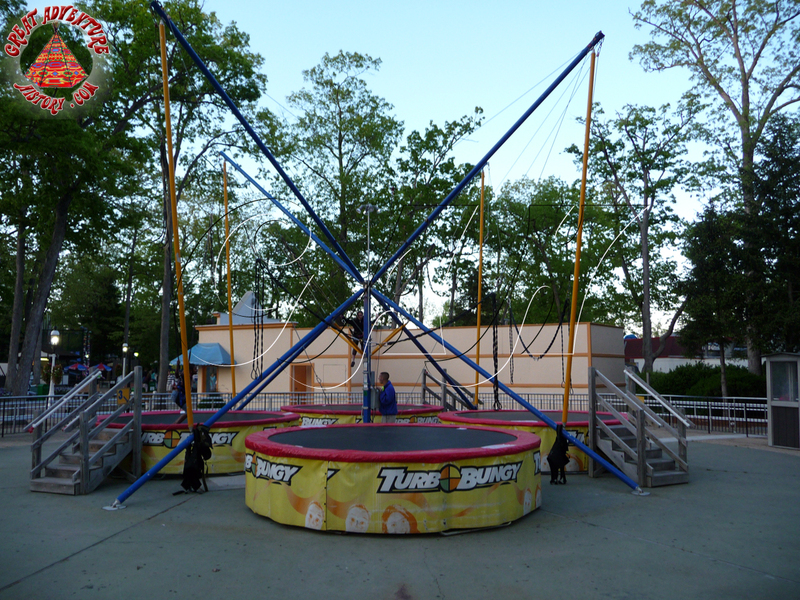 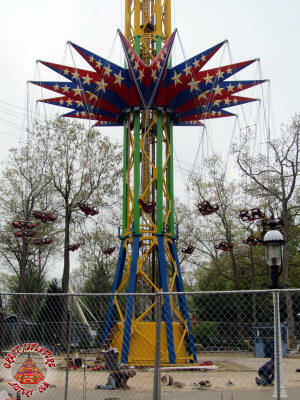 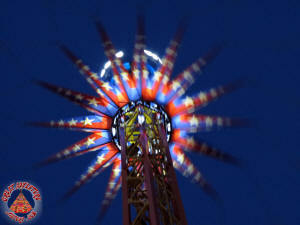 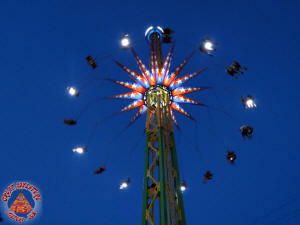 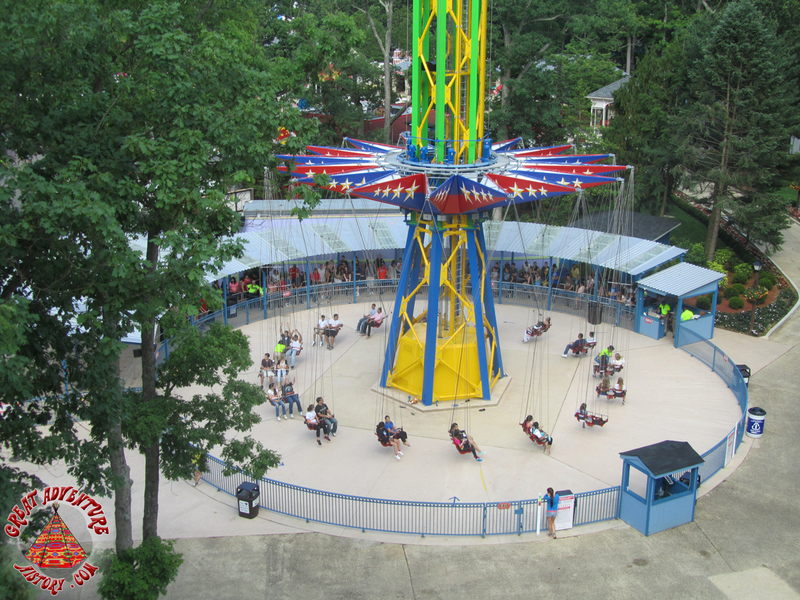 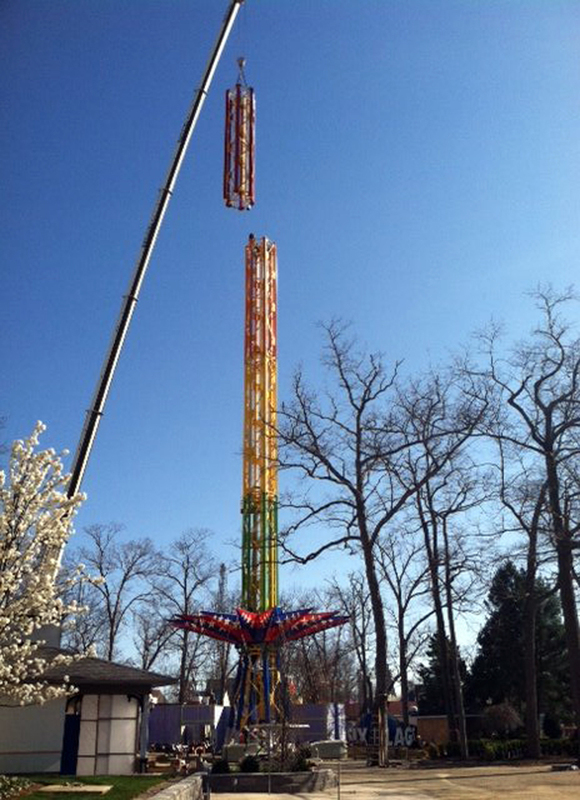 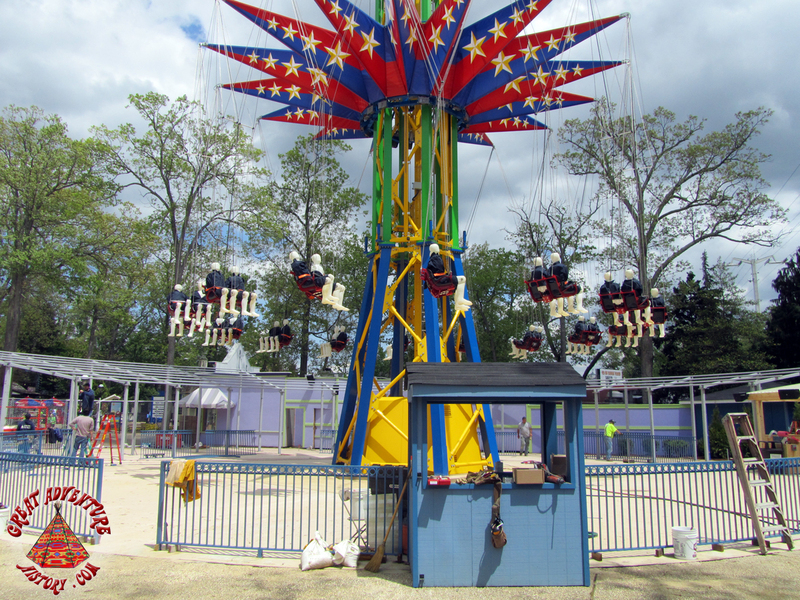 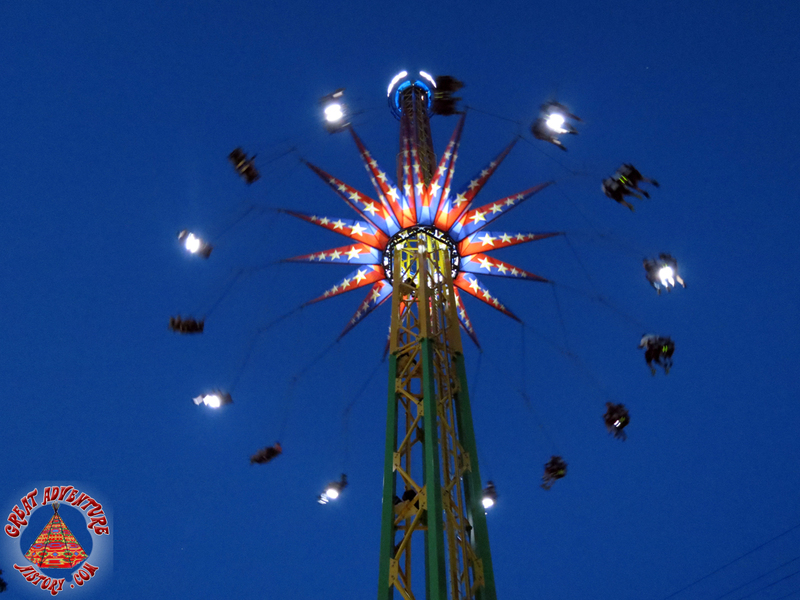 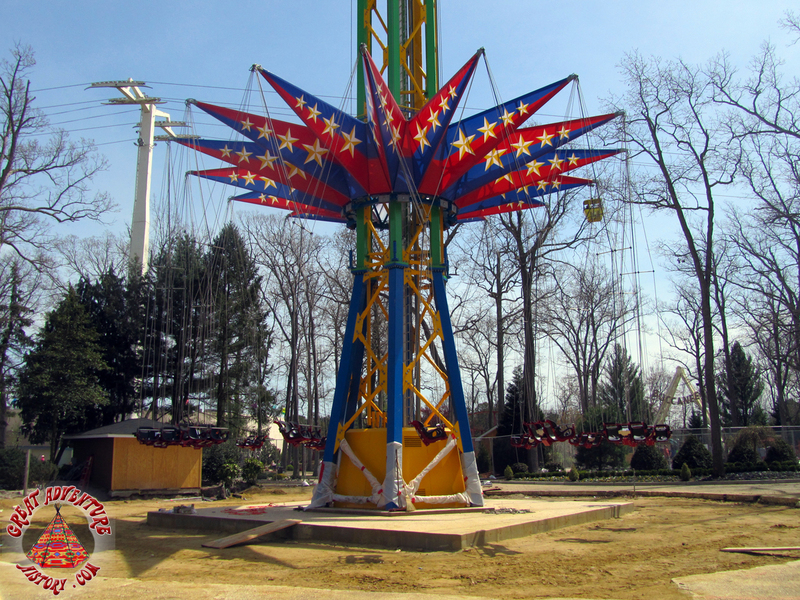 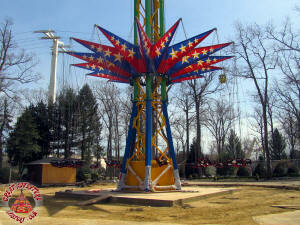 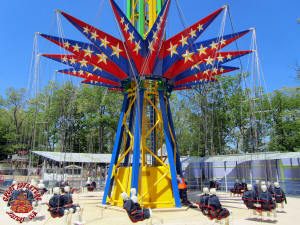 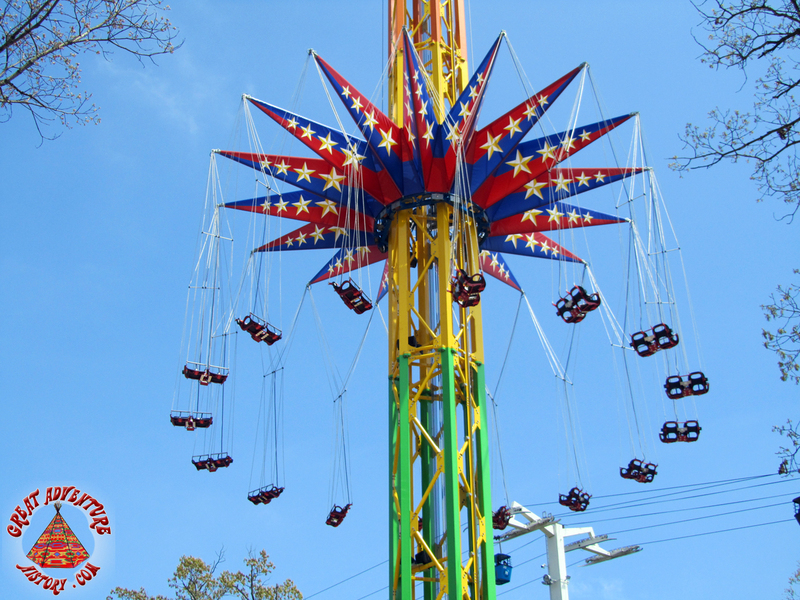 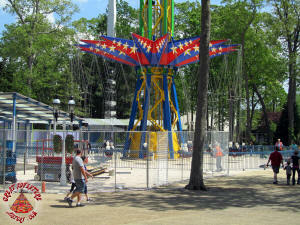 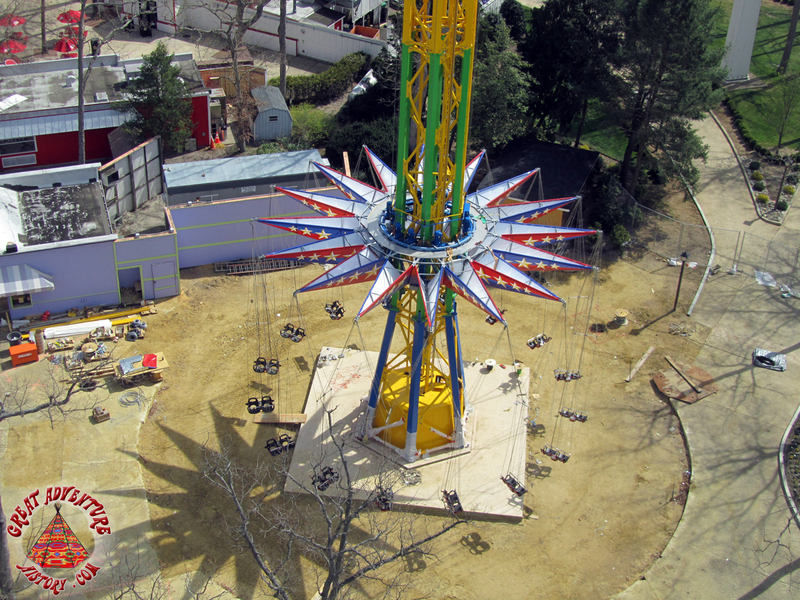 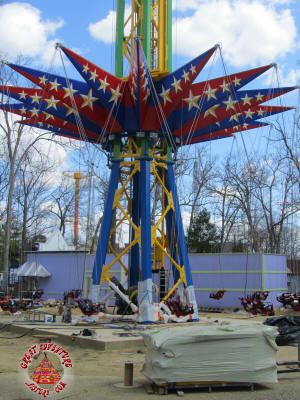 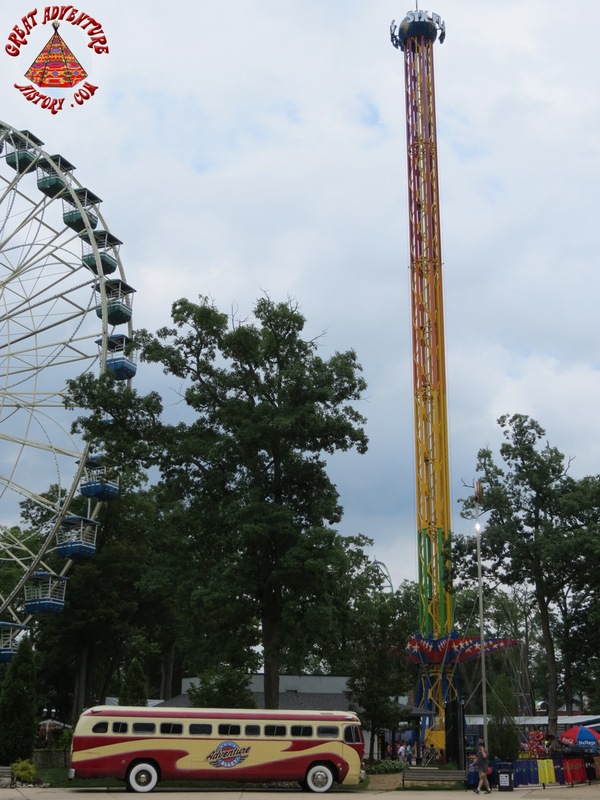 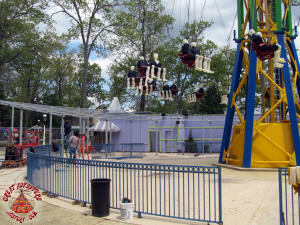 By day or by night, the Sky Screamer became a new classic ride in the park. 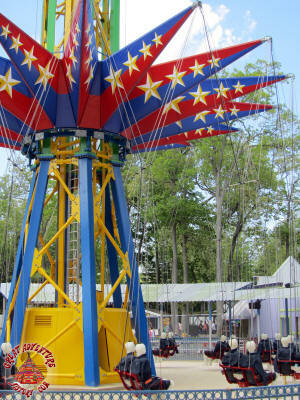 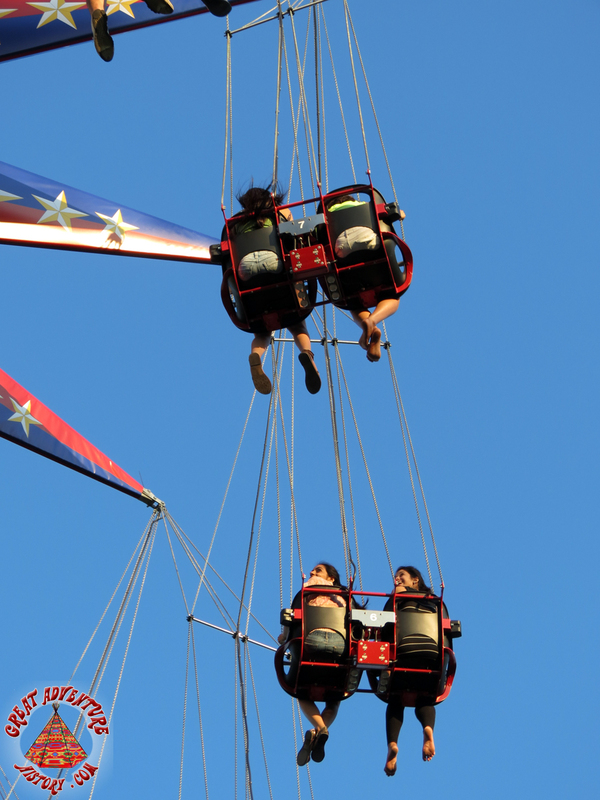 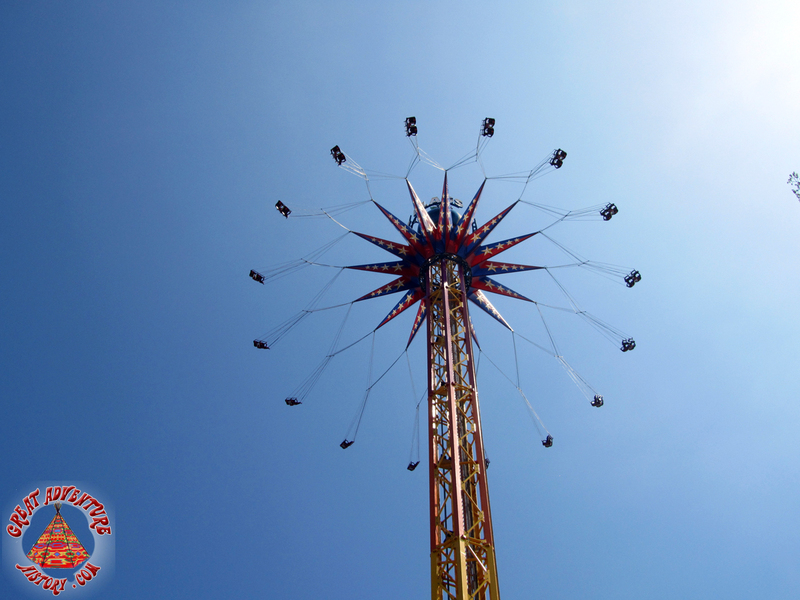 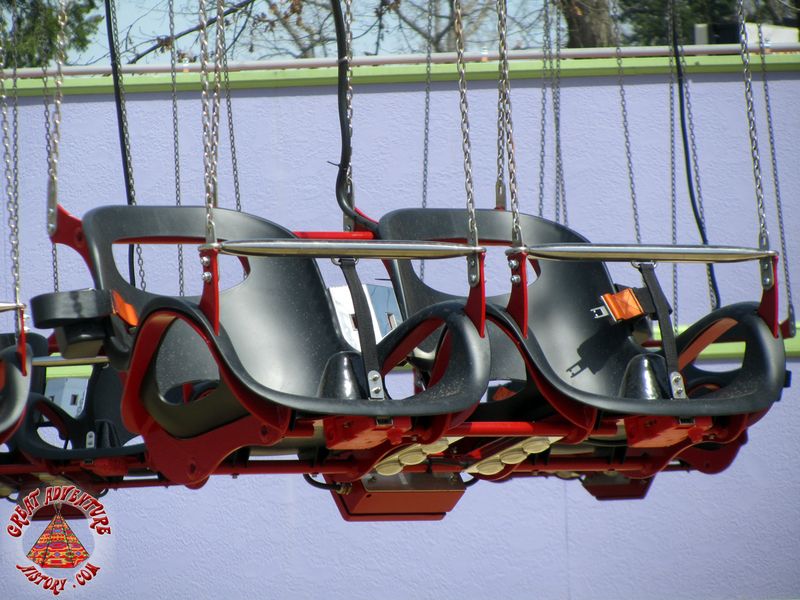 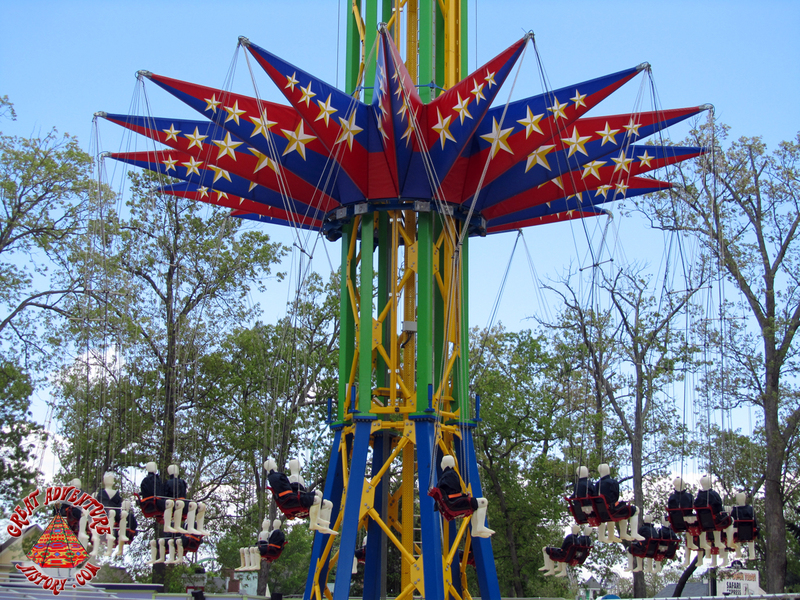 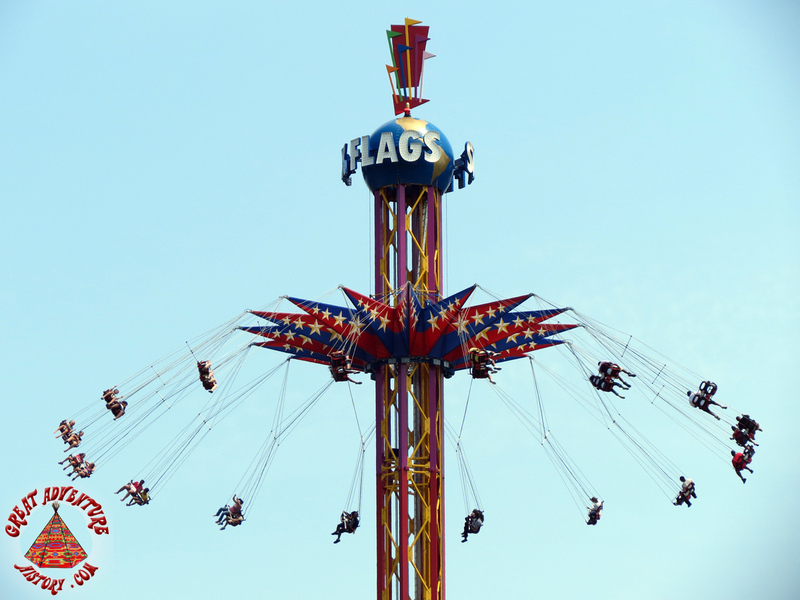 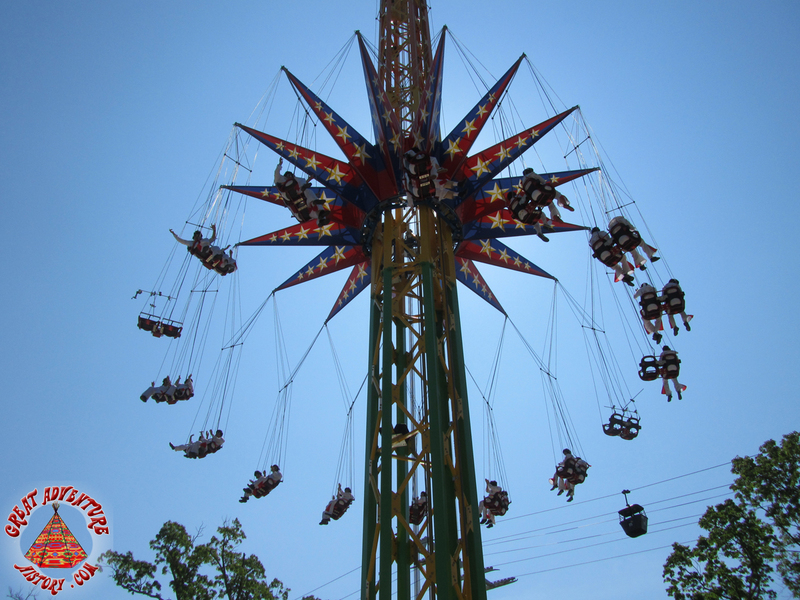 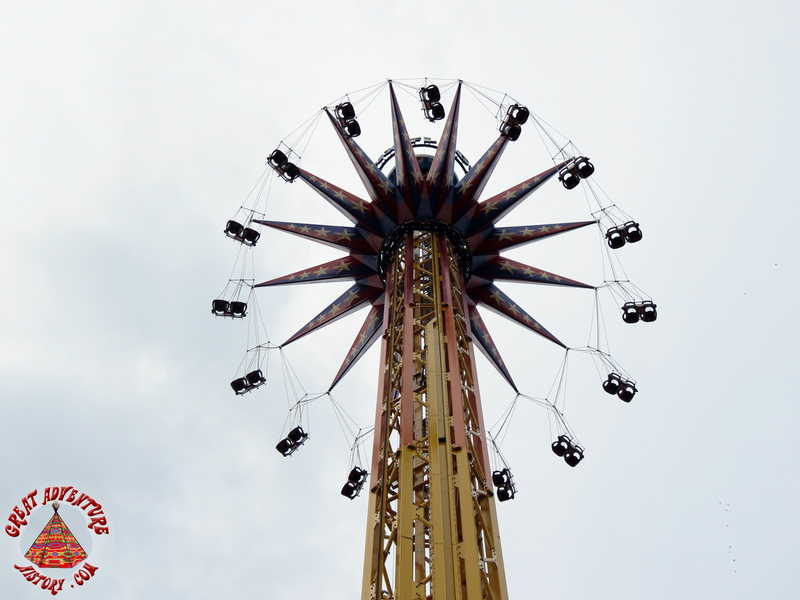 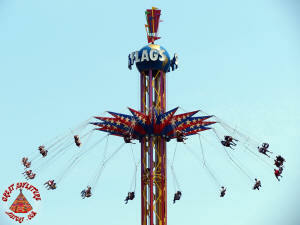 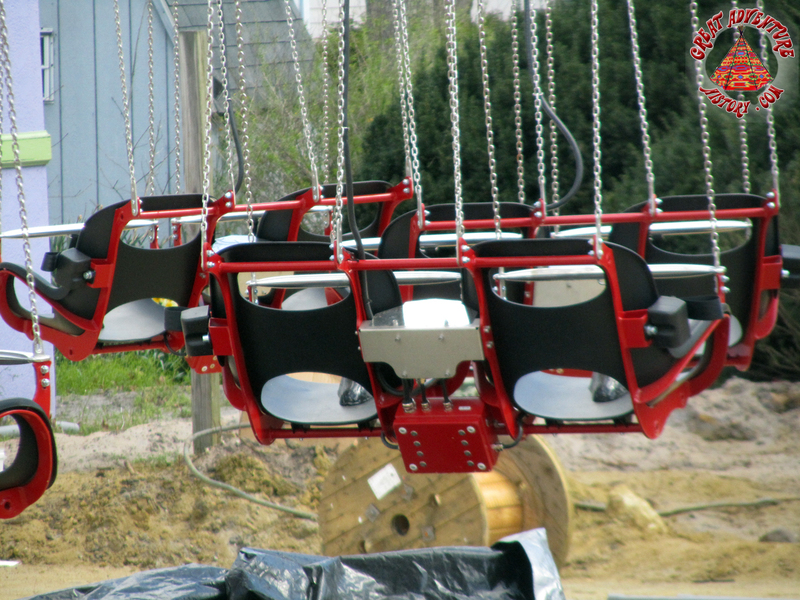 While some guests still lament the loss of the Flying Wave, many have embraced the Sky Screamer as the next step in the evolution of flying swing rides.